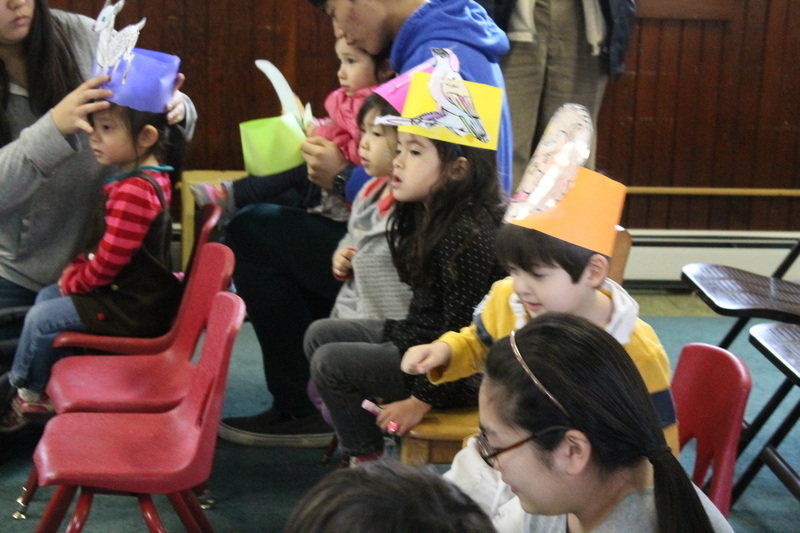 March 23rd was our Annual Story Telling Day. 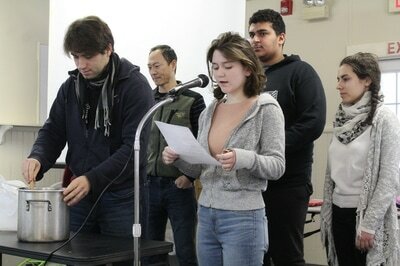 It was fun to listen to many different stories from individual participants and the classes. All did a great job of telling their stories in front of many people. 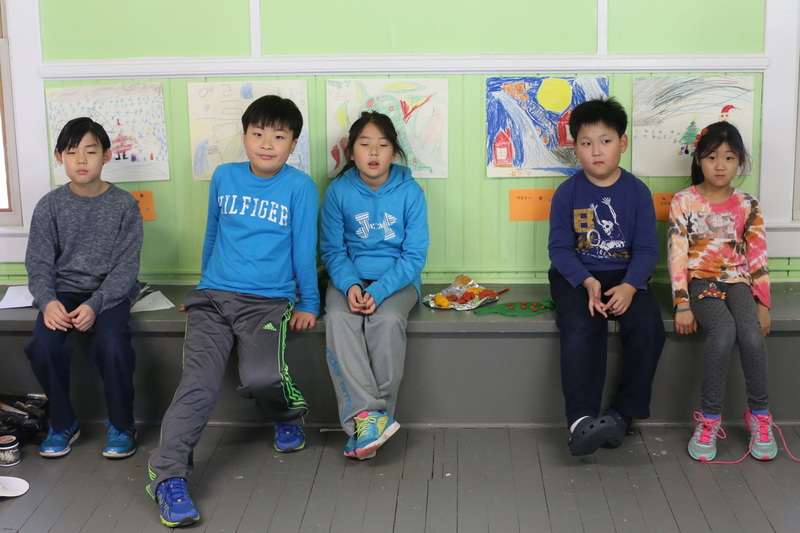 KAIP students were great listeners, too. 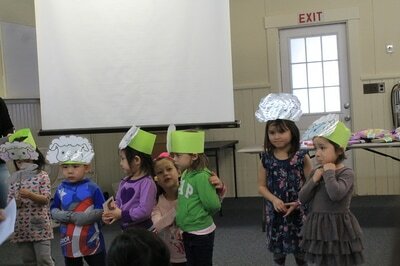 It was a wonderful story telling day! 3월 23일은 이야기 날이었습니다. 참가 학생과 반에서 들려주는 많은 이야기를 아주 재미있게 들었습니다. 많은 사람 앞에서 이야기를 잘 한 학생들에게 칭찬을 보냅니다. 프린스톤 한국학교 학생들의 이야기를 듣는 태도 역시 아주 훌륭했습니다. 아주 좋은 이야기 날이었습니다. 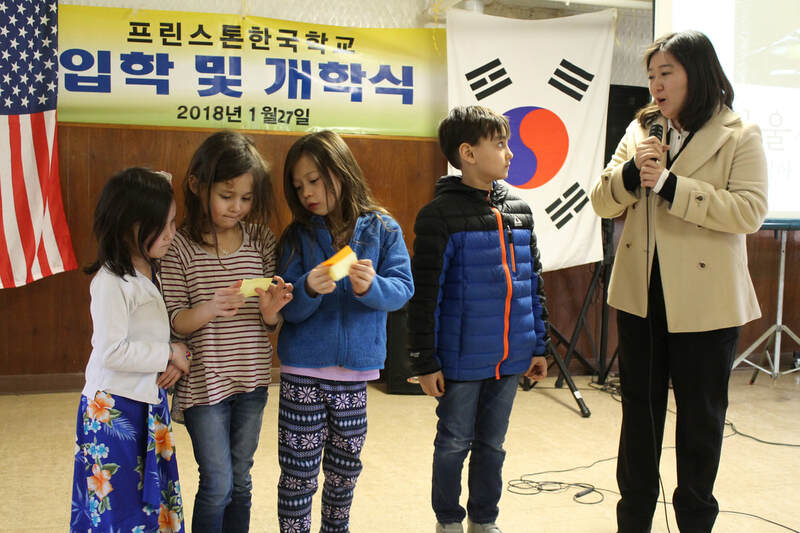 The KAIP celebrated the New Year on the first day of spring session on February 2nd, 2019. 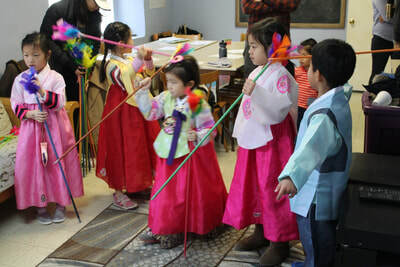 Luna New Year (설날 seol-nal) is one of the most celebrated holiday in Korea. 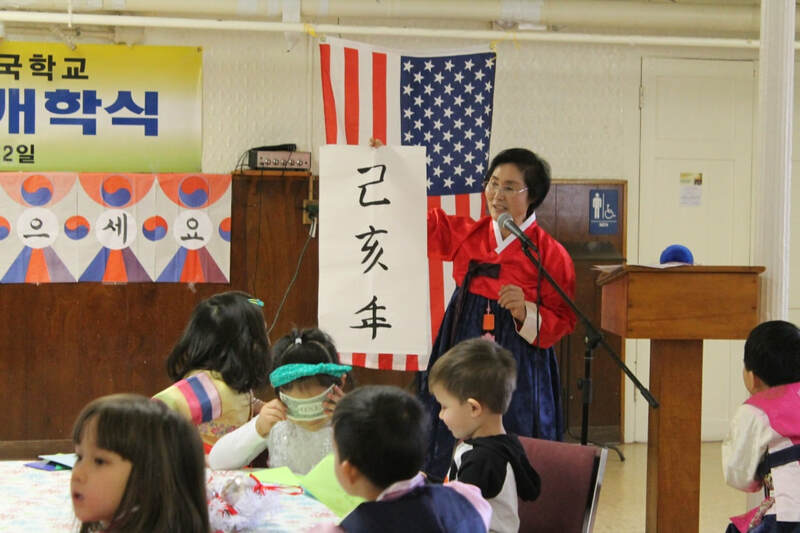 This year's Seol-nal falls on Tuesday, February 5, 2019. "Happy New Year!" 프린스톤 한국학교는 봄학기 시작하는 첫날 2월 2일에 설잔치를 했습니다. 설날은 한국에서 가장 큰 명절 중 하나입니다. 올해의 설날은 2월 5일입니다. "새해 복 많이 받으세요!" "We will see you on February 2nd, 2019! 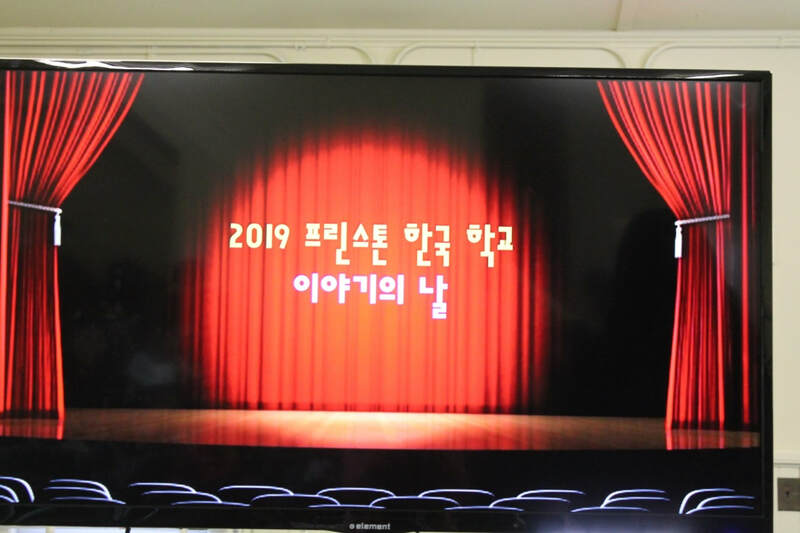 / 2019년 2월 2일 봄학기에 만나요!" 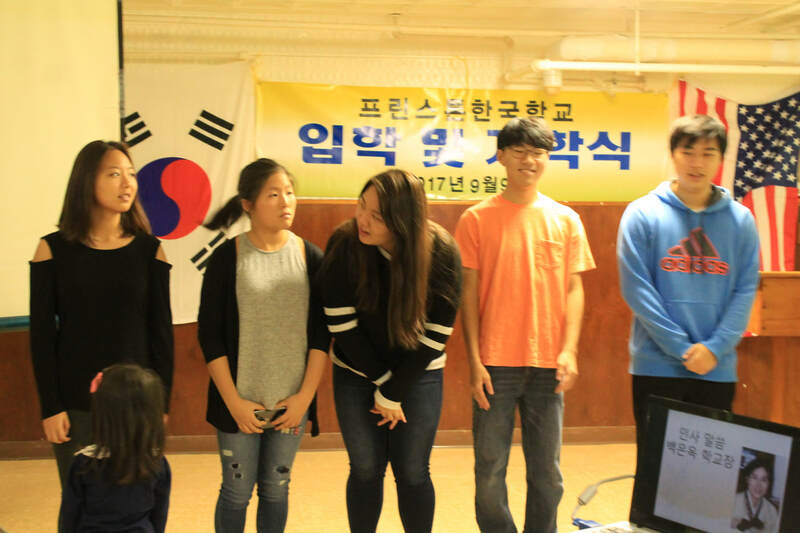 The KAIP students took us to an Arirang trip, singing five most popular Arirangs: Hol-lo Arirang, Jeong-sun Arirang, Mil-yang Arirang, Jin-do Arirang and Kyung-ki Arirang. 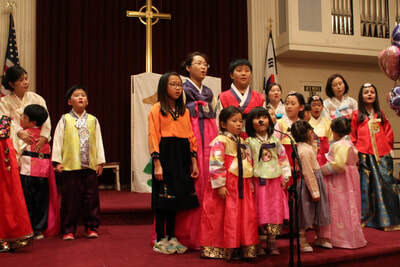 The opening song was Holo Arirang followed by Jeon-sun Arirang, which is believed to be the oldest version. 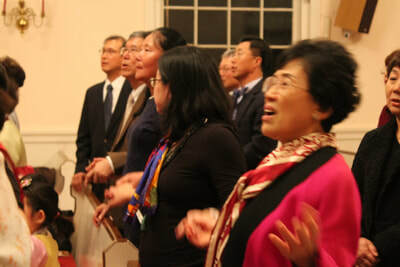 The next was the joyful and fast-paced tune of Mil-yang Arirang. The Jin-do Arirang conveys many human emotions. The Arirang is not only for Koreans but for the people of the world, for the song belongs to the world heritage. It was a wonderful trip of singing the word heritage song of the Arirang. 우리는 음악의 밤에 프린스톤 한국학교 학생들과 5개의 아리랑(홀로 아리랑, 정선 아리랑, 밀양 아리랑, 진도 아리랑, 경기 아리랑)을 부르며 아리랑 여행을 떠났습니다. 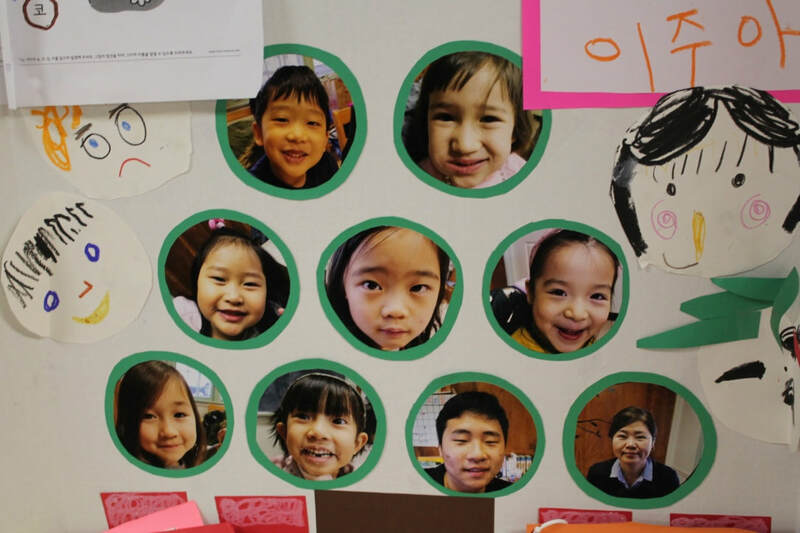 홀로 아리랑을 시작으로 가장 오래 되었다는 정선 아리랑을 불렀습니다. 빠른 곡조의 밀양 아리랑 그리고 사람의 마음을 풍부한 가락으로 표현해 주는 진도 아리랑을 불렀습니다. 한국의 아리랑은 이제 세상 사람이 함께 부르는 세계 문화 유산의 아리랑이 되었습니다. 세계 문화 유산인 아리랑을 부르며 아주 즐거운 여행이었습니다. 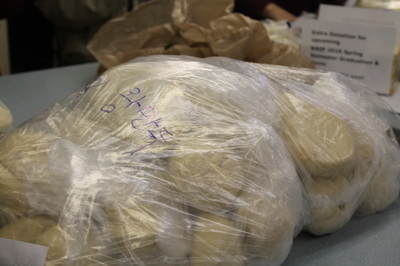 Adult class kneads the dough with pretty colors first. 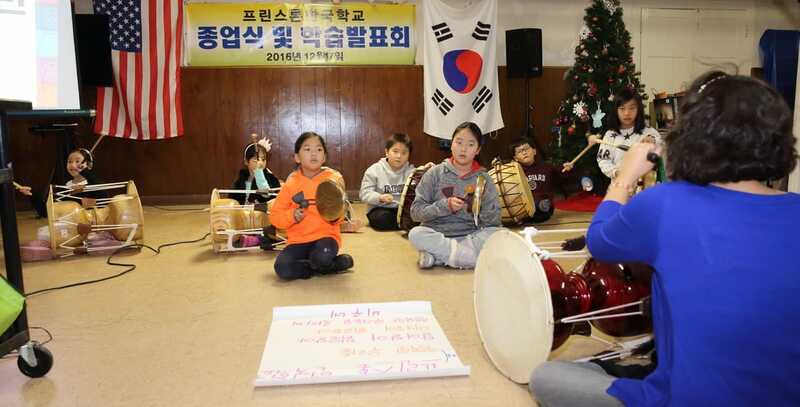 The students gather together at the assembly room to make song-pyun. 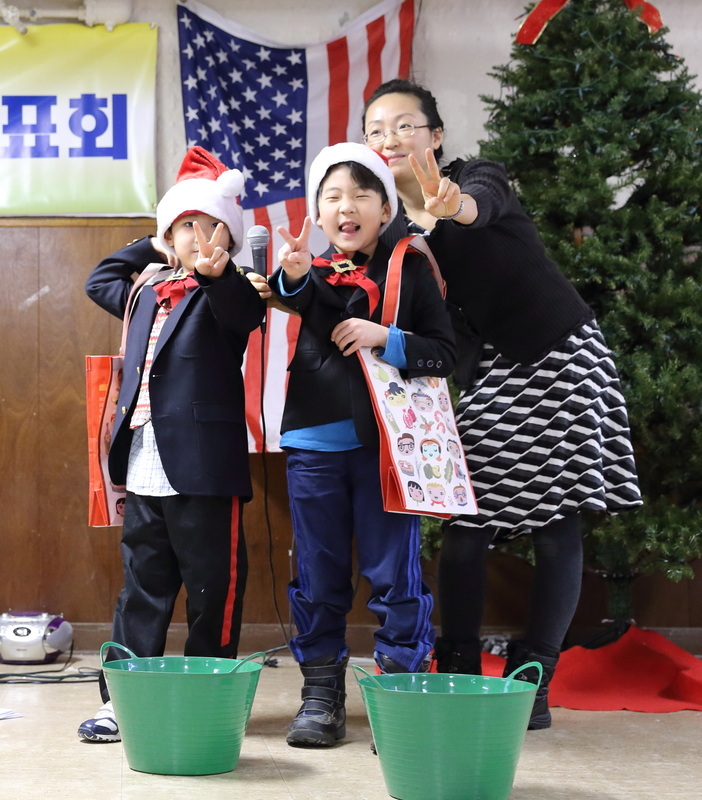 Parents boil the water to get ready to steam the song-pyun students made in the kitchen. 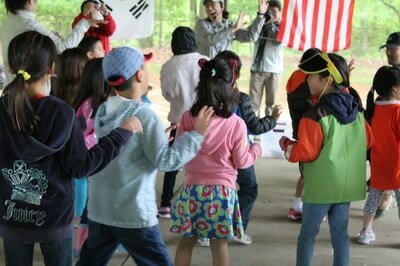 The teachers run around busily to make sure that the celebration goes smooth and fun. 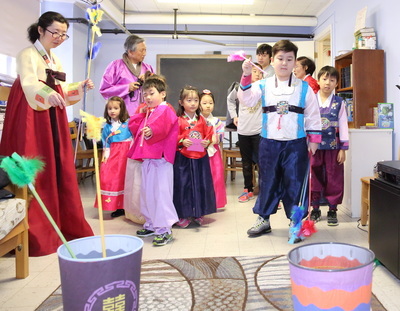 We all wish again that this year's chu-seok be just like Princeton Korean School. 어른반 학생들이 예쁜 색으로 반죽을 합니다. 학생들은 큰방에 모여서 송편을 빚습니다. 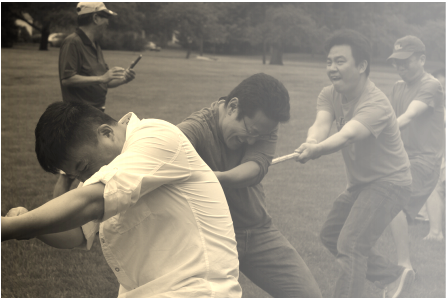 부엌에서는 부모님들이 물을 끓이며 학생들이 만든 송편을 찔 준비를 합니다. 선생님들은 바삐 움직이며 추석 잔치가 잘 진행되도록 뛰어다닙니다. "올해의 추석도 더도 말고 덜도 말고 프린스톤 한국 학교 가족만 같아라!"입니다. 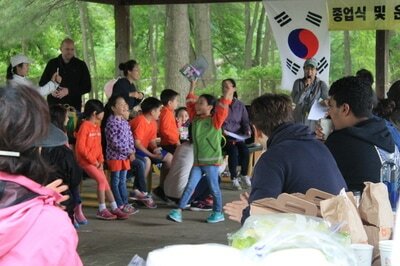 The closing ceremony and field day was held at the school instead of the park due to the forecast of inclement weather. It didn't rain. We got not a thunderstorm but hot and humid air. 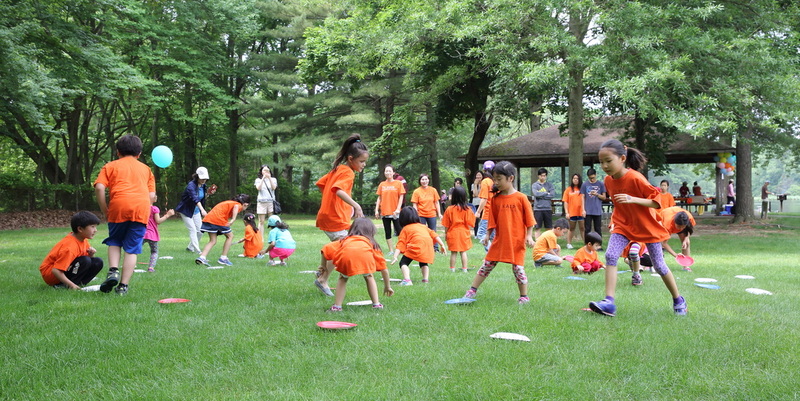 The KAIP family had a fun playing games. 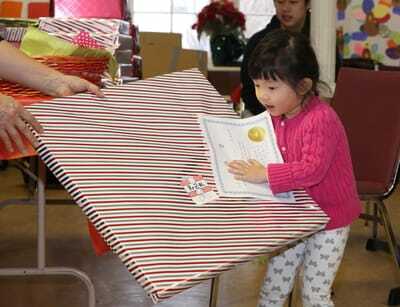 The students were recognized with prizes for their 16 weeks of hard work. 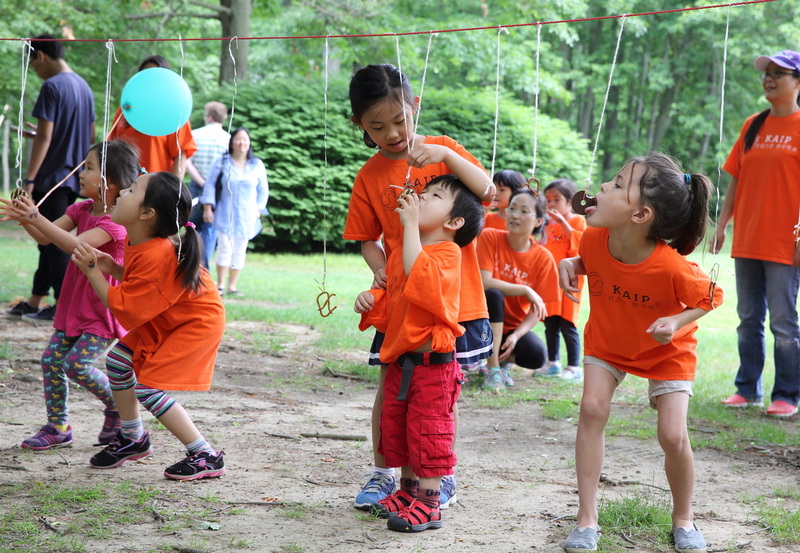 We wish you all have a safe summer and gather again on September 8th. 천둥 번개를 동반한 비가 올 거라는 일기예보로 종업식과 운동회를 공원에서 하지 않고 학교에서 했습니다. 비와 천둥번개는 오지 않았지만 아주 더운 날씨였습니다. 프린스톤 한국학교 가족들은 게임을 하며 즐거운 시간을 보냈습니다. 학생들은 16주동안 열심히 공부하고 출석하여 상을 받았습니다. 여름 방학동안 잘 지내고 9월 8일에 다시 만납시다. 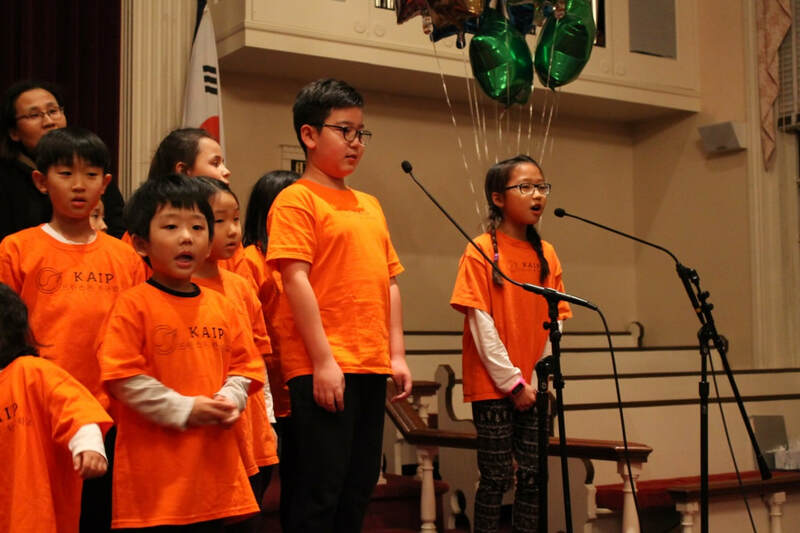 The KAIP students performed Arirang Srirang at Children's Art Festival in New York on May 19th, 2018. 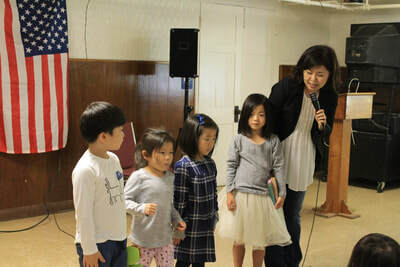 프린스톤 한국학교 학생들이 뉴욕 어린이 예술제에서 '우리랑 아리랑 스리랑 여행'을 공연했습니다. May 12th was the day of great music at Princeton Korean School. The solo contestants, family singers, and class choruses presented their talents in singing. 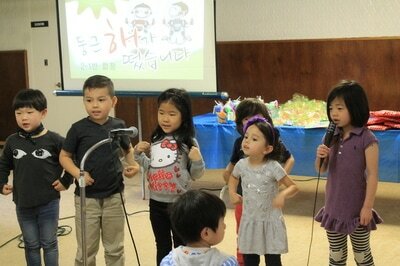 The talented performers from all grades entertained the audience with the songs they had practiced. 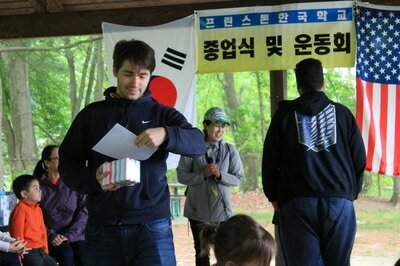 Everyone got the prize in the end. 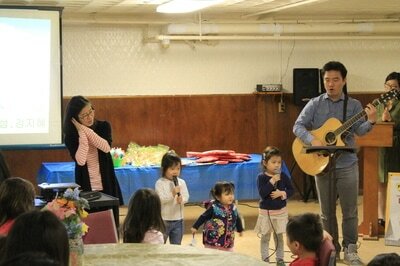 Singing and listening to the songs, KAIP family were very happy. 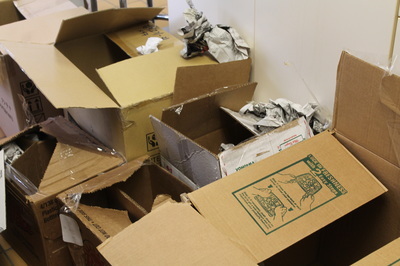 Good job, everyone!! 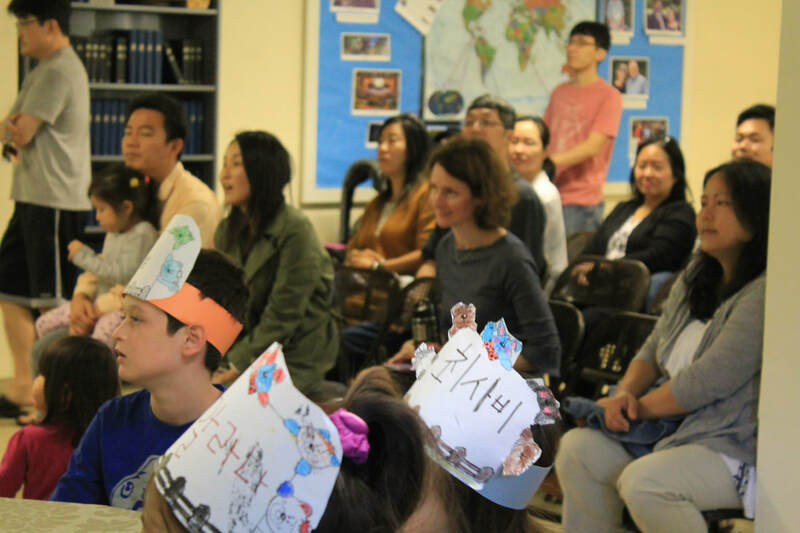 ​On April 14th, a rare opportunity took the KAIP's upper class students back to the three Kingdoms period of ancient Korea. 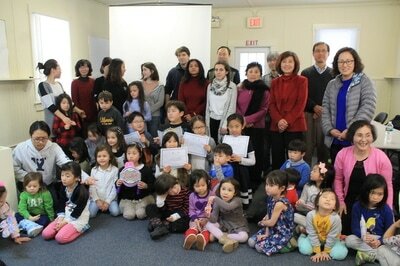 Professor Ksenia Chizhova (Anton's mom) gave a history lecture on 'Memorabilia of the Three Kingdoms' to the students. They had a wonderful time listening, asking questions, and expressing their thoughts on the subject. Many thanks to Professor Chizhova for the wonderful lecture! 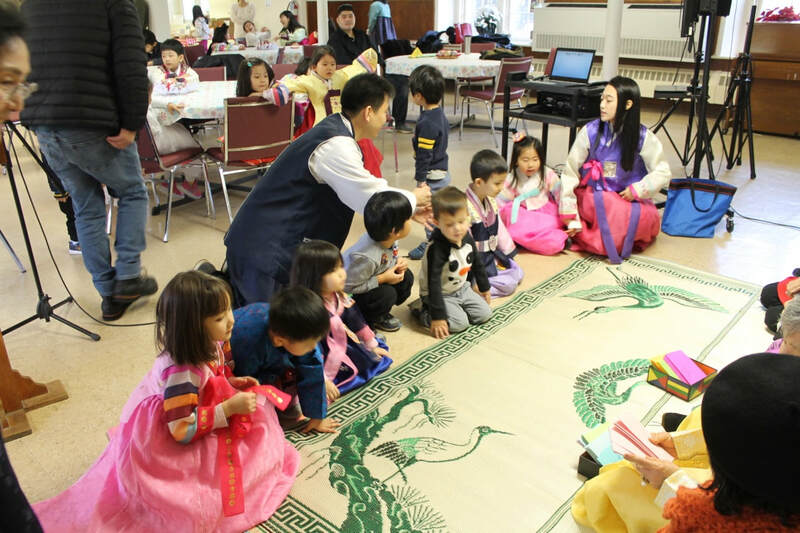 ​4월 14일에 프린스톤 한국학교 고급반 학생들은 역사 강의를 들으며 삼국 시대로 돌아가는 귀한 기회를 가졌습니다. K Chizhova 교수님 (김안톤 모친)이 '삼국유사' 강의를 해 주셨습니다. 학생들은 귀 기울여 듣고 질문하고 생각을 나누는 시간을 가졌습니다. 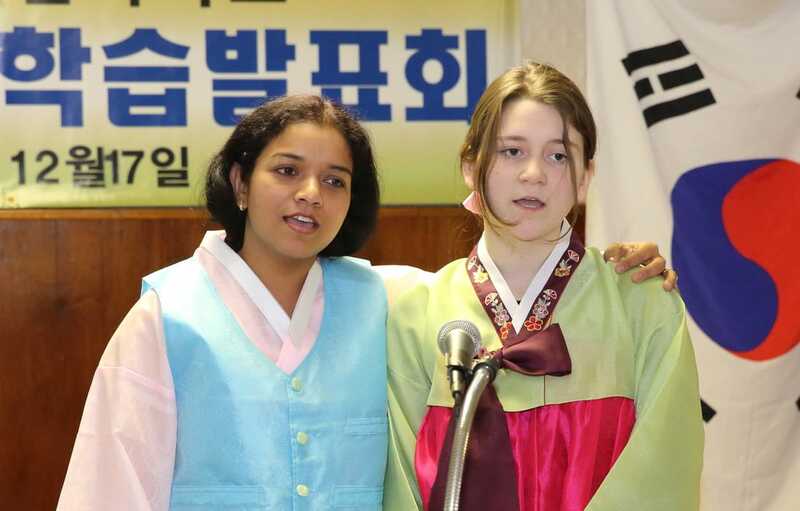 아주 좋은 강의 고맙습니다. 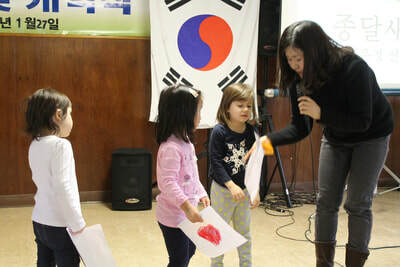 Students greeted one another with Korean greetings that they just learned. 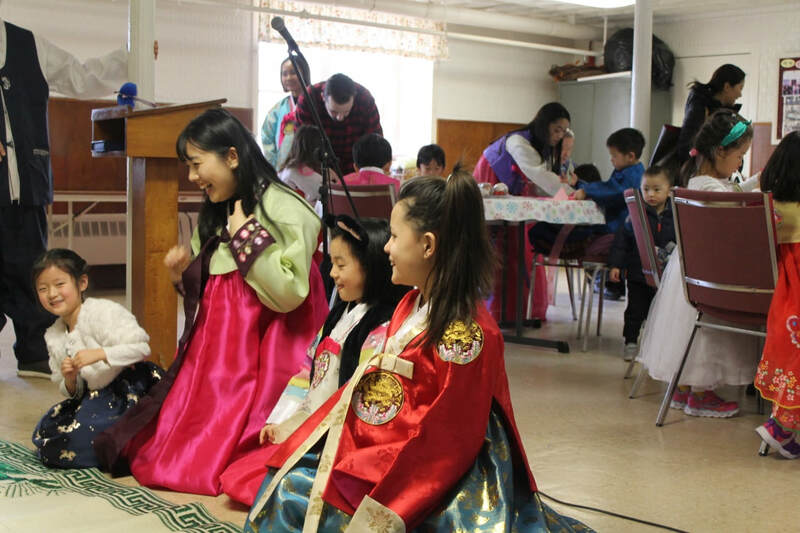 While they were singing songs together, playing traditional games, and doing se-bae, parents prepared rice-cake soup in the kitchen. 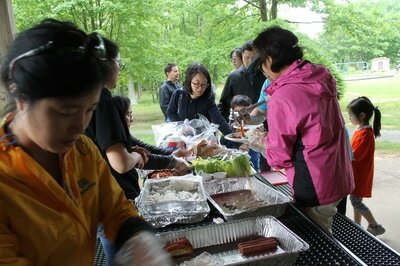 The aroma of the food made everyone hungry. It is always a lot of fun to wear colorful han-bok, enjoy Korean traditional cookies (han-gwa), and eat ttuck-kuk. '새해 복 많이 받으세요!' 학생들은 새로 배운 설 인사를 합니다. 부모님들께서 부엌에서 떡국을 끓이는 동안 학생들은 모여서 설 노래를 부르고 전통 게임을 하고 세배도 합니다. 떡국의 맛있는 냄새가 모두를 배고프게 합니다. 예쁜 한복을 입고 한과를 맛보고 떡국을 먹는 설날은 아주 재미있습니다. 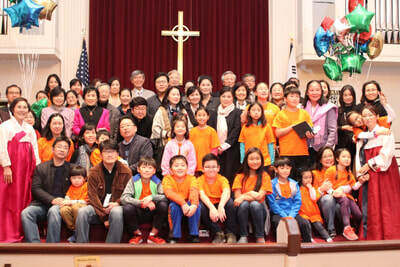 The Korean school started the spring semester by introducing one another in Korean before the KAIP family. The youngest students held the microphone with their teacher's help and spoke; however, we all know they will grow in confidence. The school is blessed with many reliable teaching assistants this semester. 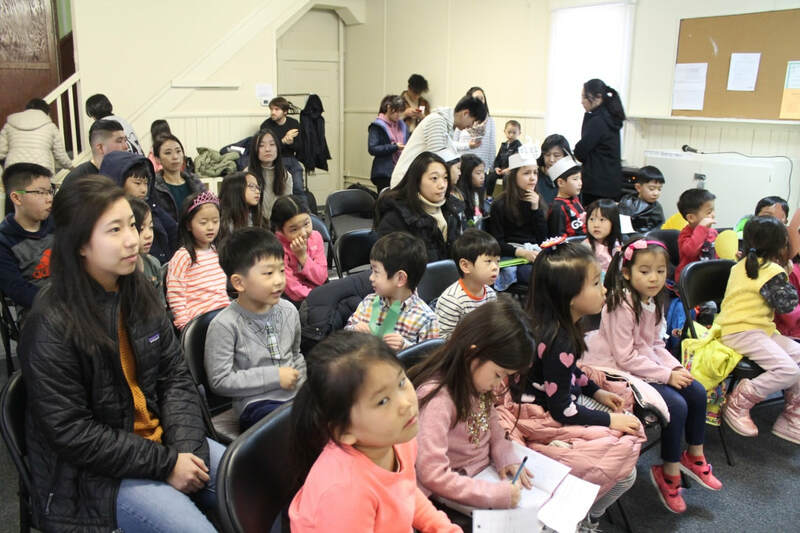 We look forward to a fruitful semester with enriching experiences of learning the Korean language and culture. 프린스톤 한국 학교 봄학기 시작은 친구와 가족 앞에서 한국말로 자기 소개를 하는 것으로 시작되었습니다. 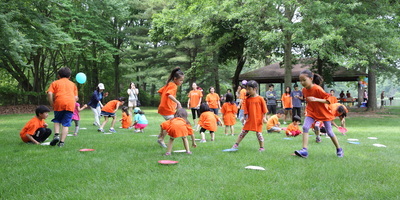 어린반 학생들은 지금은 선생님의 도움으로 마이크를 잡고 말하지만 곧 자신감이 넘치는 학생으로 자라날 것입니다. 이번 봄학기 우리 학교는 훌륭한 조교들이 많이 지원해 주었습니다. 한국어를 배우고 문화 체험을 통해서 풍성하고 알찬 학기가 되기를 기대합니다. Thank you for all your continued support !! 계속 후원하여 주셔서 고맙습니다!! 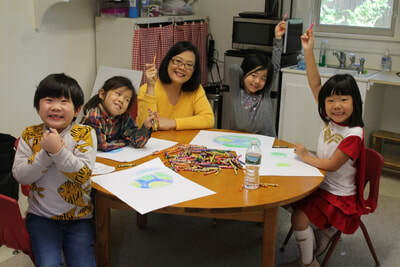 Today is the day of drawing and writing. 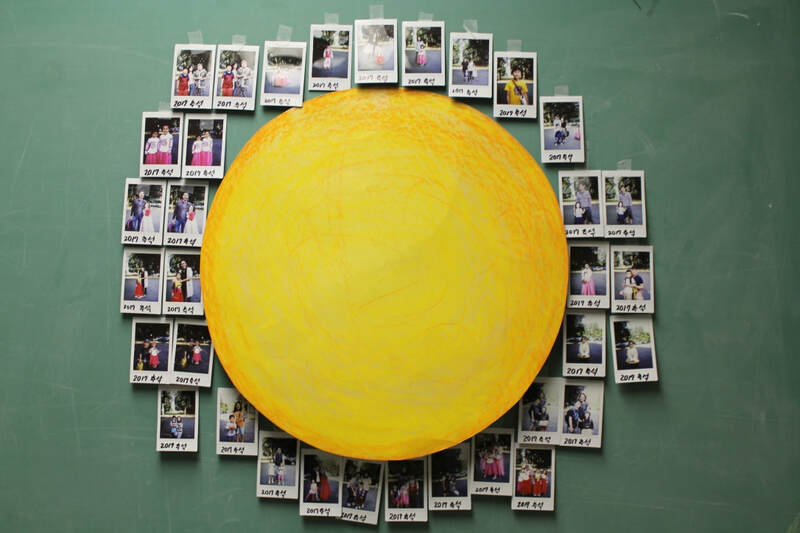 We draw the beauty of what we see. We write out what we hold in our beautiful mind. 오늘은 글과 그림의 날이에요. 우리가 보는 예쁜 세상을 그림으로 그려요. 우리가 생각하는 아름다운 마음을 글로 적어요. 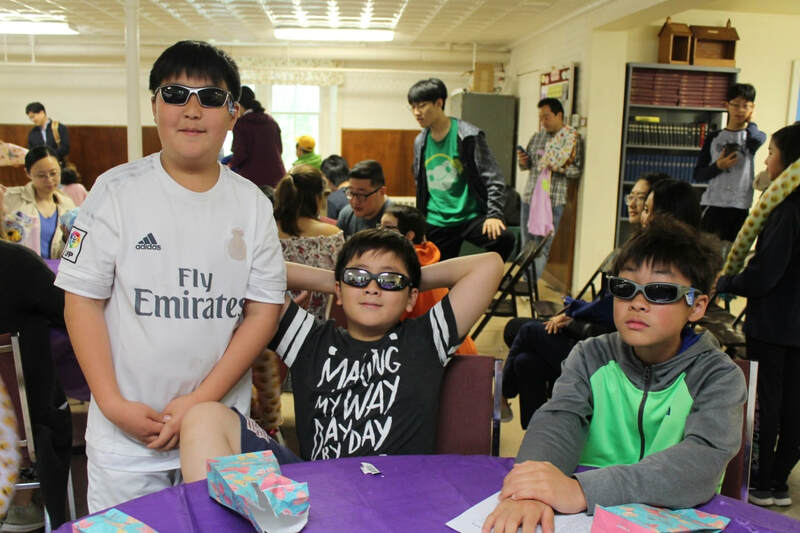 ​더도 말고 덜도 말고 한가위만 같아라! 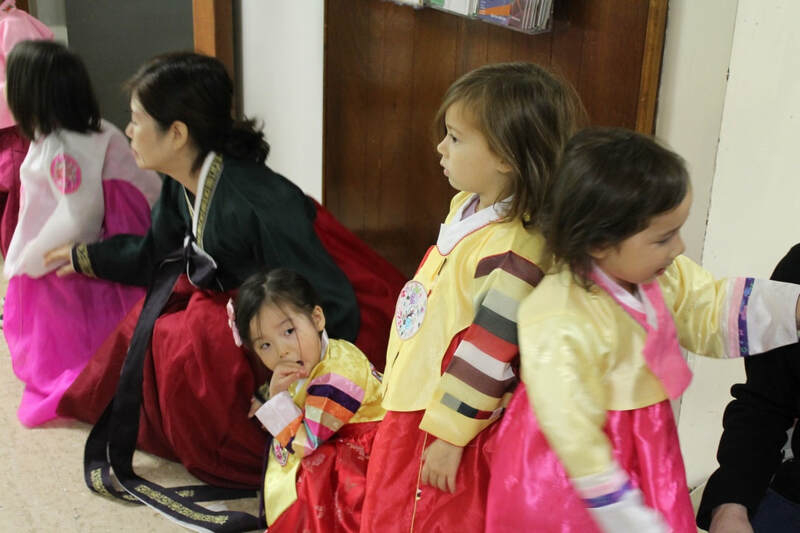 Let it be like Chuseok everyday; doesn't have to be more or less! Do you see those happy faces? 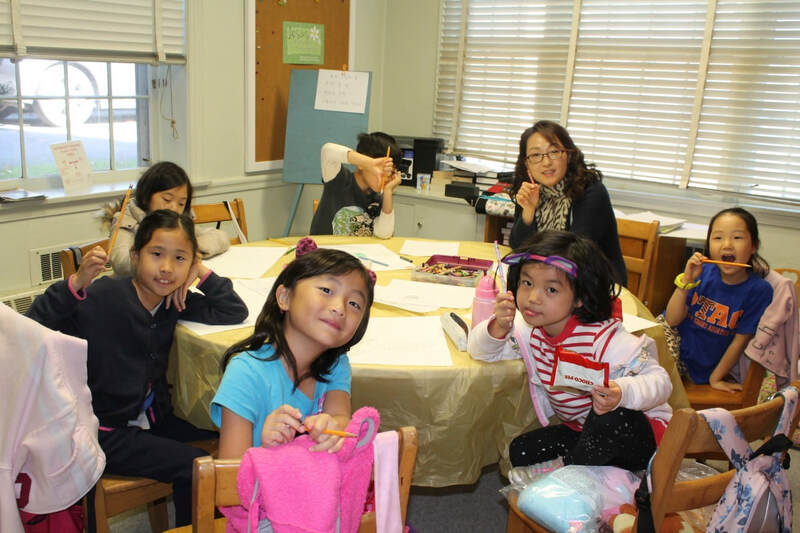 Do you hear the joyful giggles from Princeton Korean School? 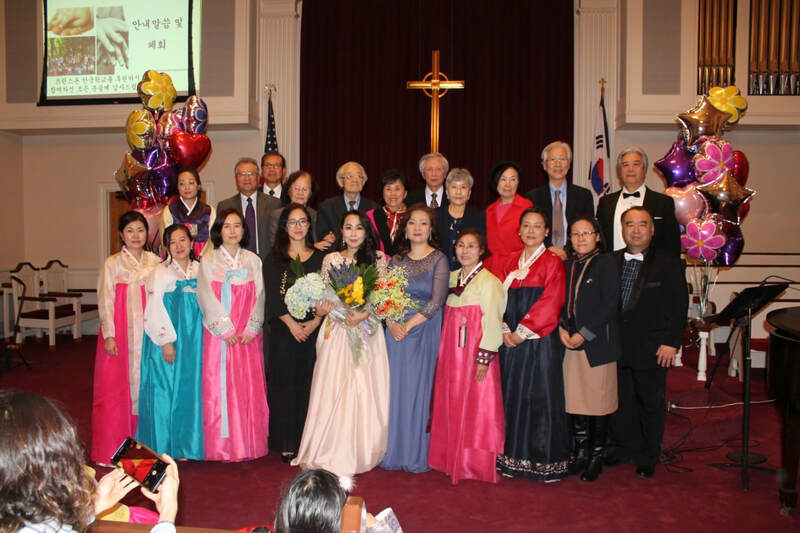 On October 7th, the KAIP family gathered together to celebrate Chuseok once again this year. 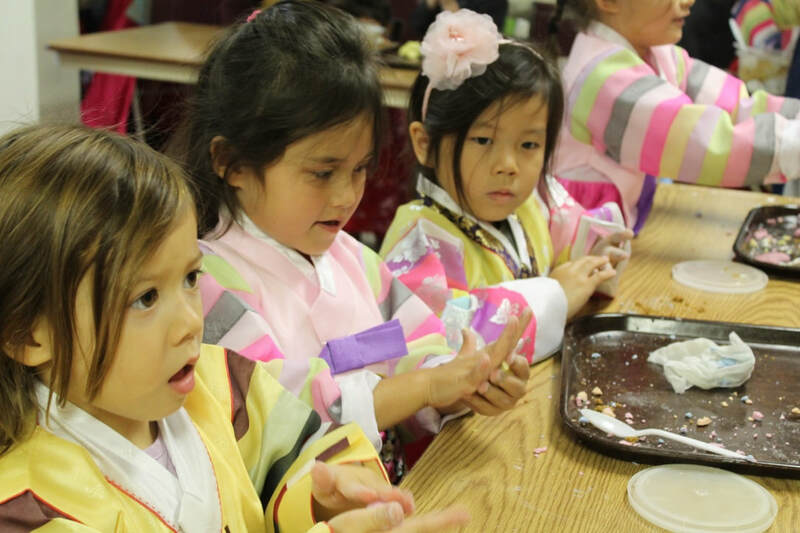 Students were looking forward to making song-pyun and enjoying what they made. It is so much fun to celebrate this rich cultural event. 행복해 하는 얼굴이 보이십니까? 기뻐 떠드는 소리가 들리십니까? 프린스톤 한국학교 가족들이 2017년 추석 잔치를 하기 위해 다시 모였습니다. 학생들은 송편을 예쁘게 빚어 맛있게 먹을 생각으로 들떠있습니다. 함께 추석을 경험하고 배우는 것은 참 즐거운 일입니다. 2017 Fall Semester Starts! 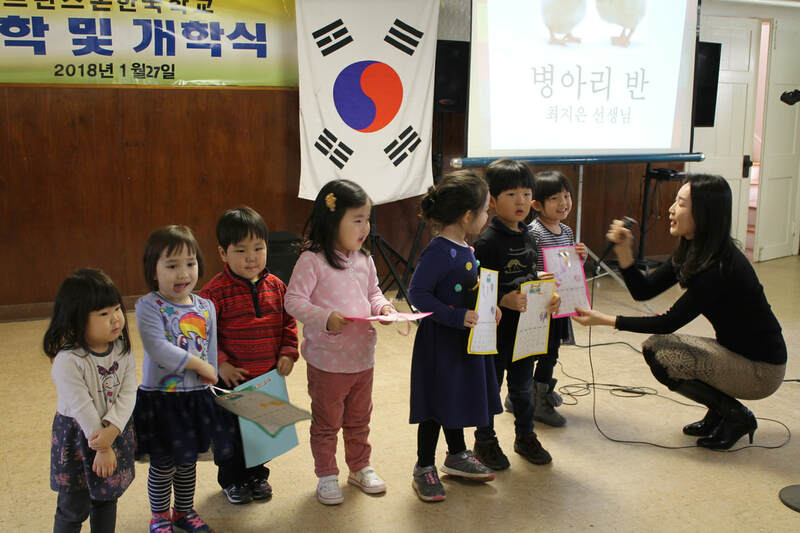 Let us introduce ourselves in Korean. 2017년 가을 학기 시작합니다! 한국말로 자기 소개를 하세요. 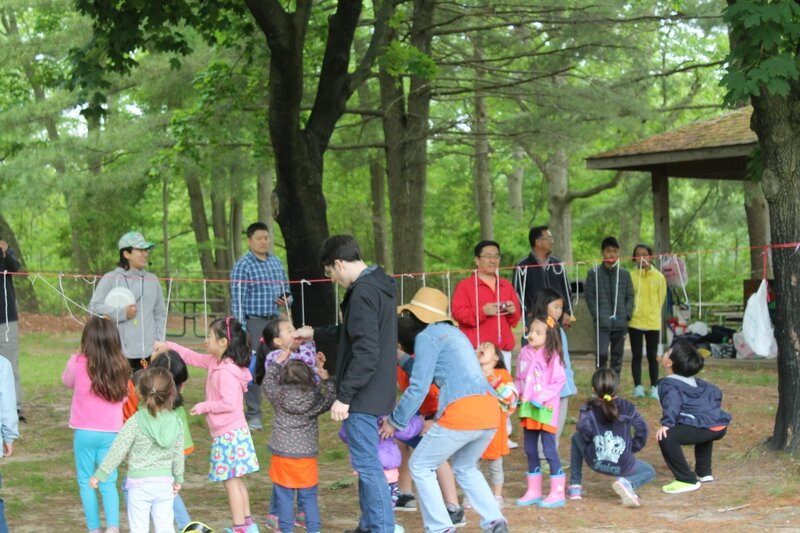 It was very cold for May in Van Nest Park in West Windsor on May 20th 2017. Everyone had to wear a jacket over an orange school t-shirt. 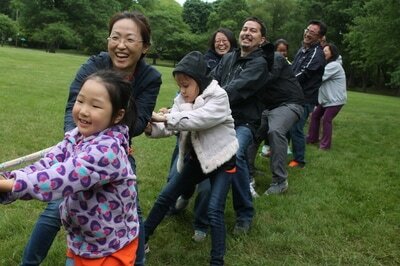 This cold weather did not affect the spirit of the Princeton Korean School family. 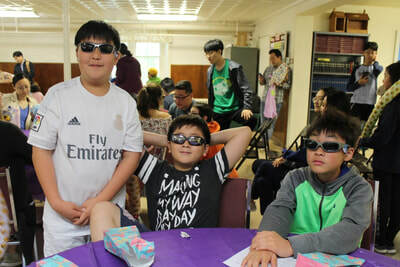 The students were very happy getting many prizes, playing team sports and eating delicious lunch with their family and friends. 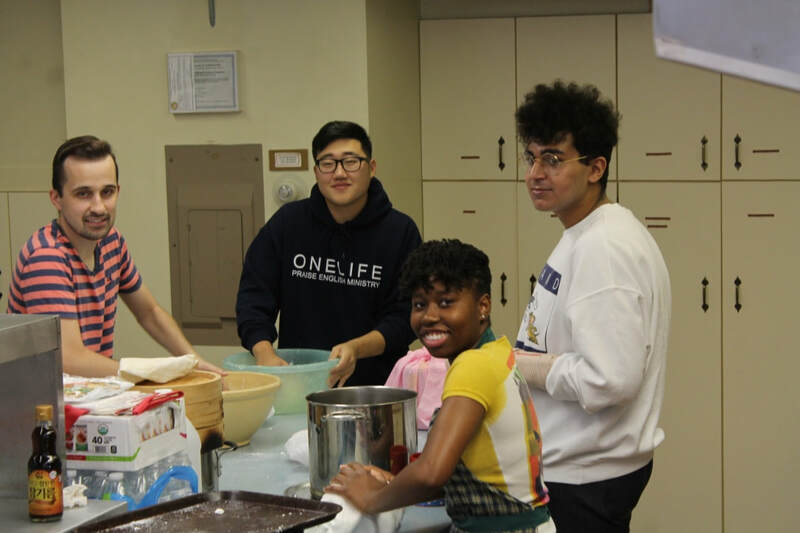 All wished one another a great and safe summer and will see each other again on the first day of fall semester on September 9th, 2017. 5월 20일 웨스트 윈저 반 네스트 공원은 오월의 날씨 치고는 꽤 추웠습니다. 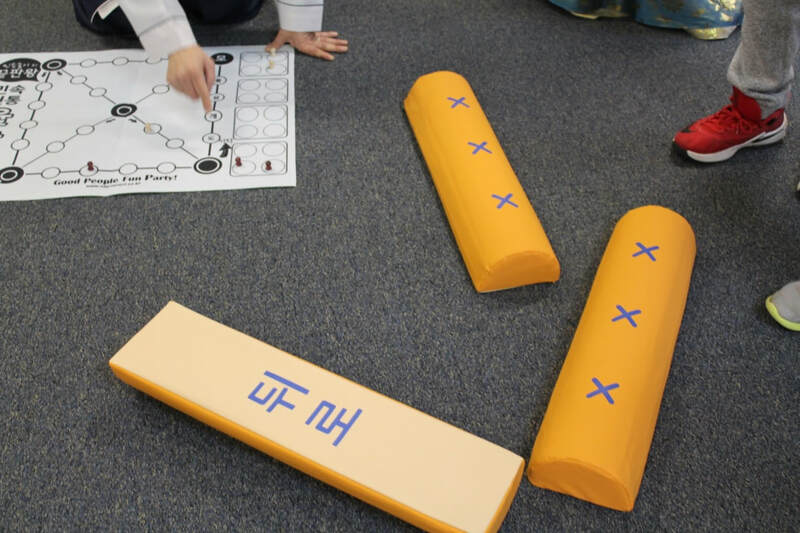 참가한 사람 모두 오렌지 색 학교 셔츠 위에 따뜻한 코트를 입었습니다. 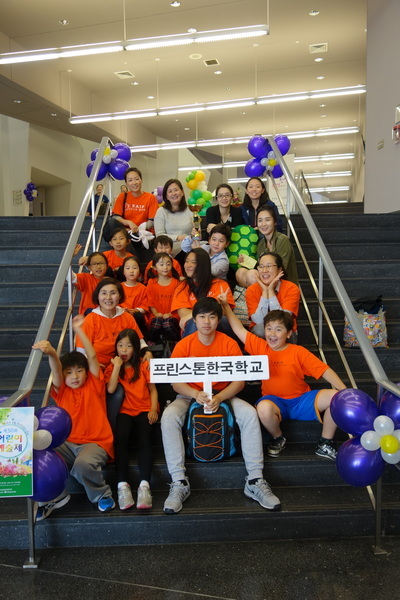 날씨는 춥고 비도 왔지만 프린스톤 한국학교 학생들과 가족들은 즐겁기만 했습니다. 학생들은 여러가지 상을 받으며, 그룹으로 운동을 하며, 또 맛있는 음식을 가족과 친구들과 같이 먹으며 행복해 했습니다. 서로 여름 방학을 잘 보내고 9월 9일 가을 학기 첫날에 다시 만나기를 약속하며 헤어졌습니다. 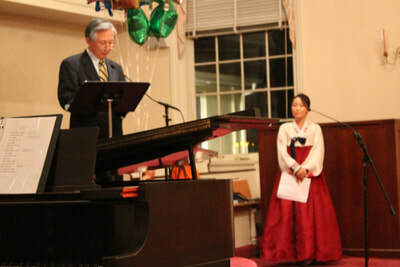 May 6th was the day of the great music festival at Princeton Korean School. Eleven solo contestants, nine family singers, and the five class choruses presented their talents in singing. The nine family singers entertained audience with songs along with the guitar, dancing, and rap music. The program ended with the adult class's kim-bap song with the K-pop style dance. The audience were very supportive with cheering and clapping after every performance. The singing day made everyone happy. 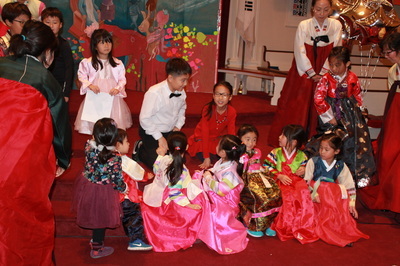 5월 6일은 프린스톤 한국 학교의 노래 잔치의 날이었습니다. 열한 명의 독창, 아홉 가족의 가족 노래 그리고 다섯 반이 합창을 하며 고운 목소리를 자랑하였습니다. 특히 가족들의 노래에서는 기타와 춤 그리고 랩 음악을 하며 모두를 즐겁게 해 주었습니다. 어른반의 '돌돌 말아 김밥'과 케이팝 춤으로 순서를 마쳤습니다. 관중들이 노래가 끝날 때 마다 환호와 박수를 치며 격려를 아끼지 않는 모습이 참 좋았습니다. 노래 부르는 날은 모두를 행복하고 즐겁게 만들었습니다. 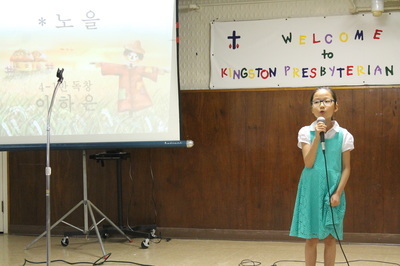 Ha-eun Lee and Dan-bi Ko from KAIP participated in the storytelling contest held in Long Island, NY. 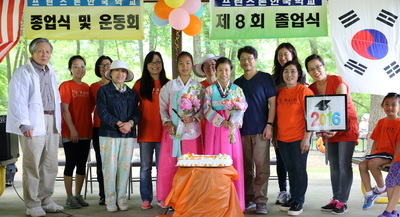 Ha-eun Lee was awarded the 4th place, and Dan-bi Ko with a participant trophy. Congratulations! 이하은 학생과 고단비 학생이 뉴욕 롱아일랜드 한국학교에서 열린 동화구연대회에 프린스톤 한국학교를 대표하여 참석하였습니다. 이하은 학생은 장려상을 고단비 학생은 참가상을 수상하였습니다. 축하합니다! 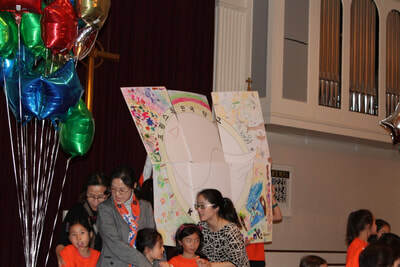 All students who participated in the Story Telling Contest today were winners! 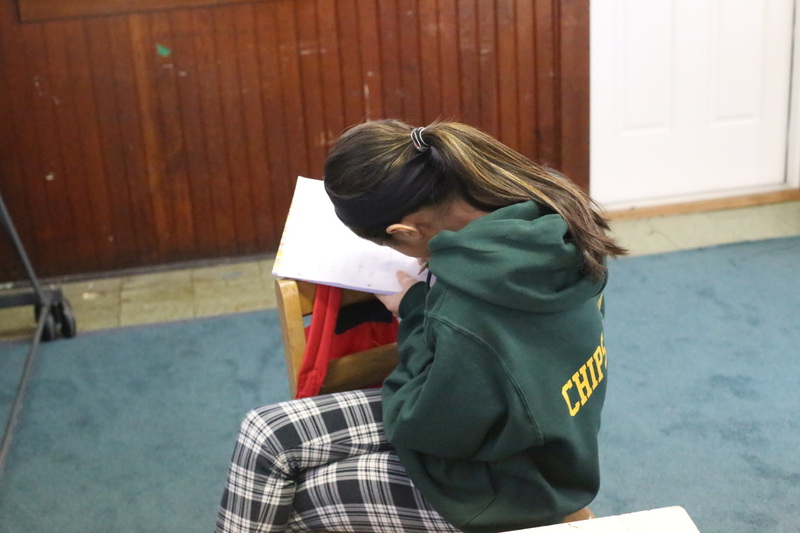 It took many hours to practice and memorize long and short stories. 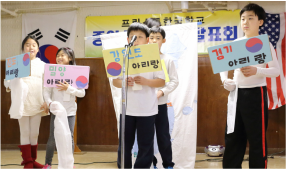 The students demonstrated a great deal of courage to stand in front of other students, parents and teachers and recite their story. 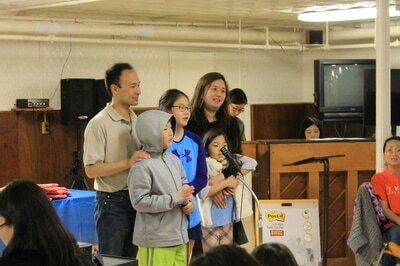 Special thanks to parents who encouraged their children to be a part of this Story Telling Contest. 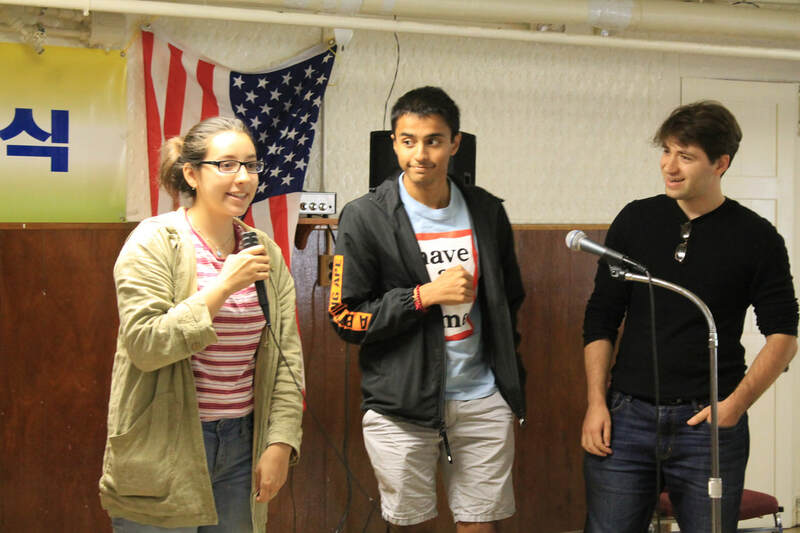 All participants, you are great story tellers! 오늘 이야기 대회에 참가한 모든 학생들 참 잘 했습니다. 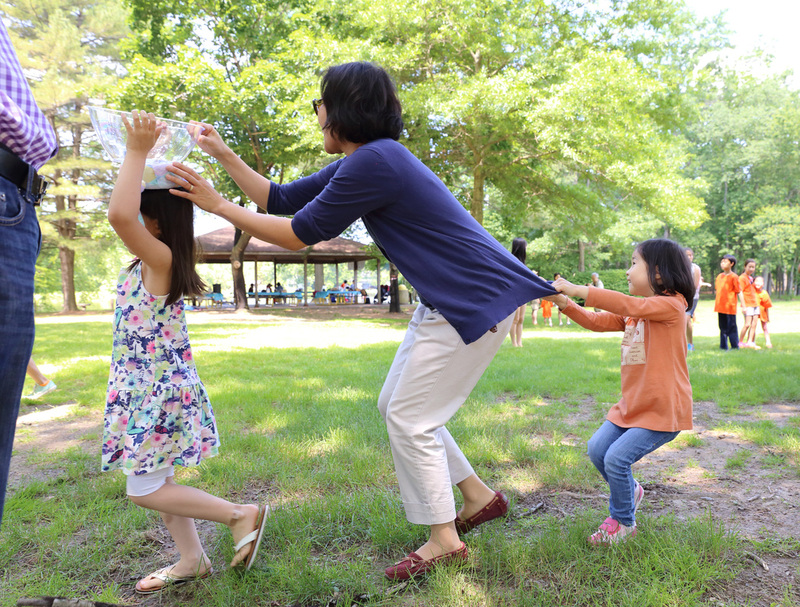 긴 이야기 뿐 아니라 몇 줄의 짧은 이야기를 외우는 것도 많은 시간과 노력이 필요합니다. 특히, 어린 학생들이 다른 학생들과 부모님 그리고 선생님들 앞에 서서 이야기를 하는 것은 쉬운 일이 아닙니다. 이야기 대회에 참여할 수 있도록 도와 주시고 애쓰신 부모님들 고맙습니다. 우리 학생들 잘 했어요! Today is the first day of the spring semester and New Year's Day. The KAIP students were very excited to meet new friends and see old classmates after a long winter break. 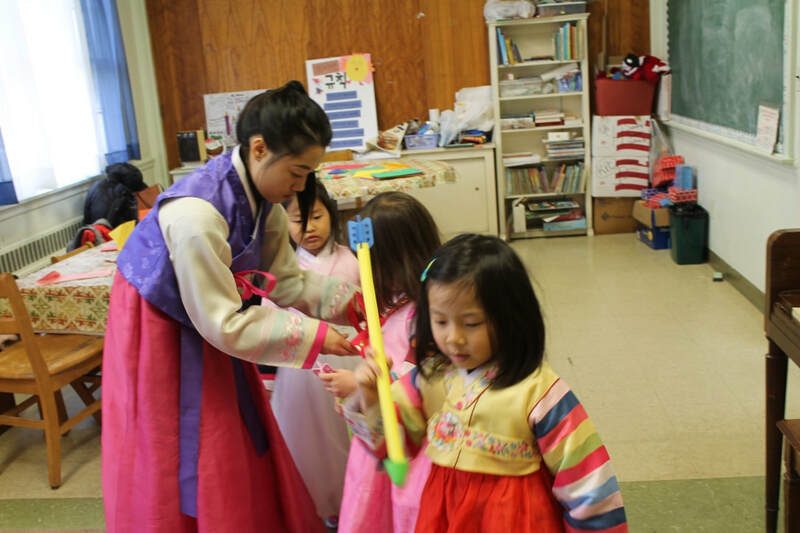 Many students arrived wearing pretty han-bok to celebrate the New Year's Day. 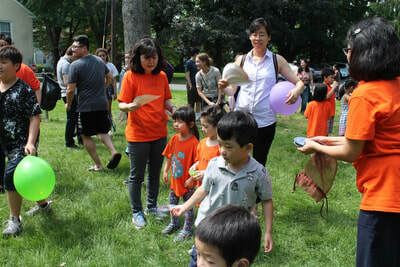 The teachers were thrilled to greet the returning and new students and teach the meaning of the old tradition. In the kitchen, moms' hands were moving fast to make ttuck-gook (rice cake soup) for the KAIP family. 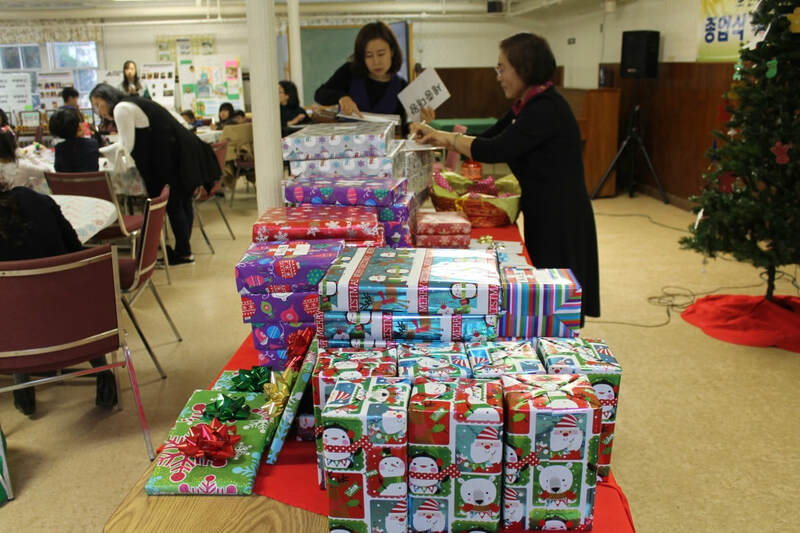 It takes so much effort to keep the tradition going, and New Year's Day spirit made everyone happy and joyful. 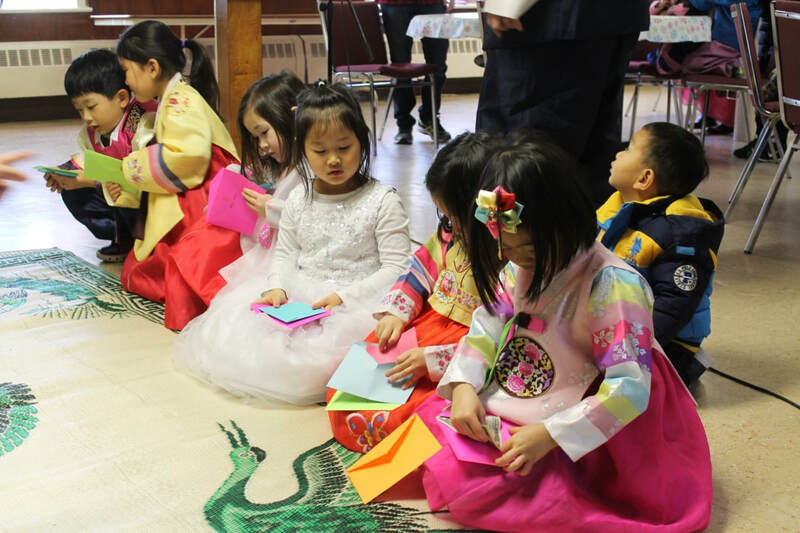 Thank you every one who gave a hand to make this tradition alive. 오늘은 봄학기 개학식과 설날입니다. 프린스톤 한국학교 학생들은 긴 방학을 마치고 학교에 와서 아는 얼굴 그리고 새로 학교에 온 친구들과 인사를 했습니다. 많은 학생들은 설날을 맞아 예쁜 한복을 곱게 차려 입고 학교에 왔습니다. 선생님들은 돌아온 학생들과 또 새로 학교에 온 친구들을 기쁘게 맞이하고 우리 전통 설을 가르치기에 분주했습니다. 부엌에서는 떡국을 준비하시는 어머님들의 손길들이 아주 바쁘게 움직였습니다. 우리의 전통 설을 학생들에게 경험시키기 위해 많은 분들이 애를 쓰셨고 설 잔치를 하는 우리 모두는 행복하고 즐거웠습니다. 설 잔치를 위해 애 쓰신 손길들 고맙습니다. KAIP first opened its school doors on February 17th, 1996. On the night of November 12th, the school celebrated its 20th Anniversary with songs and music. 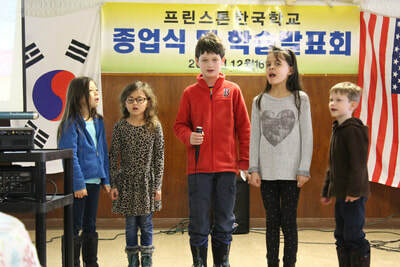 The highlight of the celebration was the students' performance of the musical 'Happy Birthday Princeton Korean School' with a traditional tune. 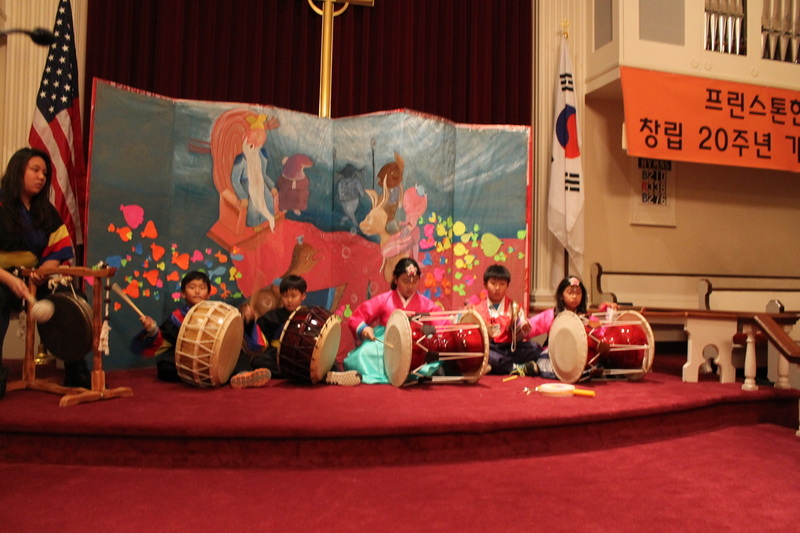 The students delivered an amazing performance, singing songs and playing traditional instruments. KAIP thanks all of the board members, parents, and guests for their support and dedication. 프린스톤 한국학교는 1996년 2월7일에 학교 문을 열었습니다. 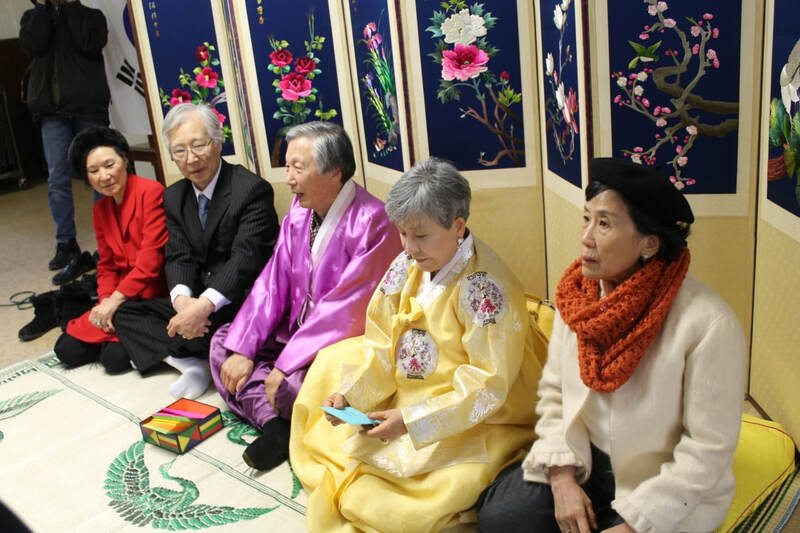 개교 20주년 축하 기념 행사를 지난 2016년 11월12일 밤에 노래와 음악으로 했습니다. 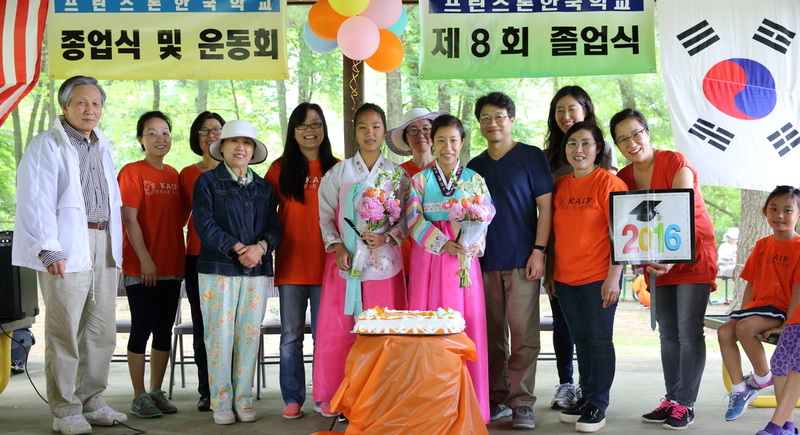 축하 행사의 하이라이트는 학생들의 국악 뮤지칼 '생일 축하해요, 프린스톤 한국학교!'였습니다. 학생들의 노래와 연주는 흠잡을 데가 없이 아주 훌륭했습니다. 20년동안 학교를 사랑하여 주시고 후원해 주신 이사장님, 이사님들, 학부모님들 진심으로 감사드립니다. 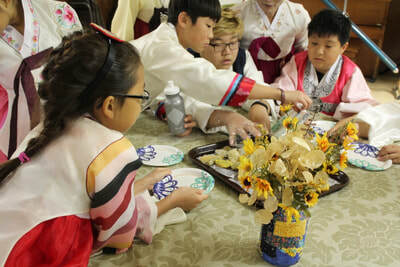 Chuseok!! 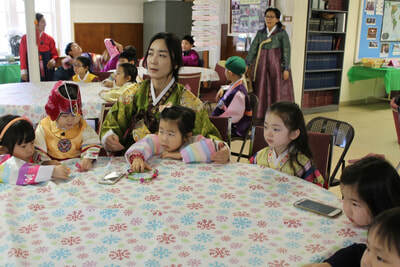 How beautiful and colorful Han-bok the students were wearing! 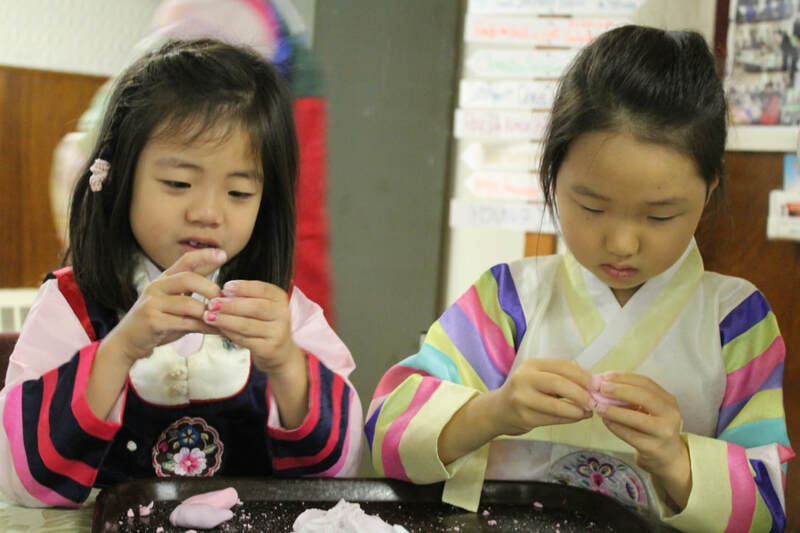 How exciting it was to make Song-pyun in the shape of the moon! 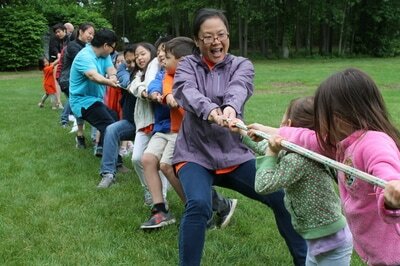 How much fun were the games we all played together! 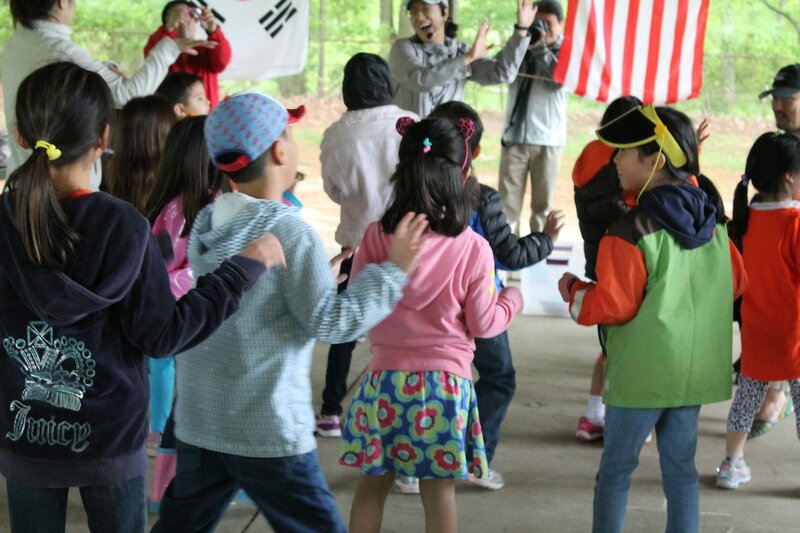 How unified was the dancing of kang-kang-sul-rae we did together in hand in hand! It was a memorable chuseok celebration!! 추석!! 고운 색의 한복은 얼마나 아름다웠는지요! 반달 모양의 송편 만드는 것도 얼마나 재미있었는지요! 같이 어우러져서 했던 놀이는 얼마나 좋았는지요! 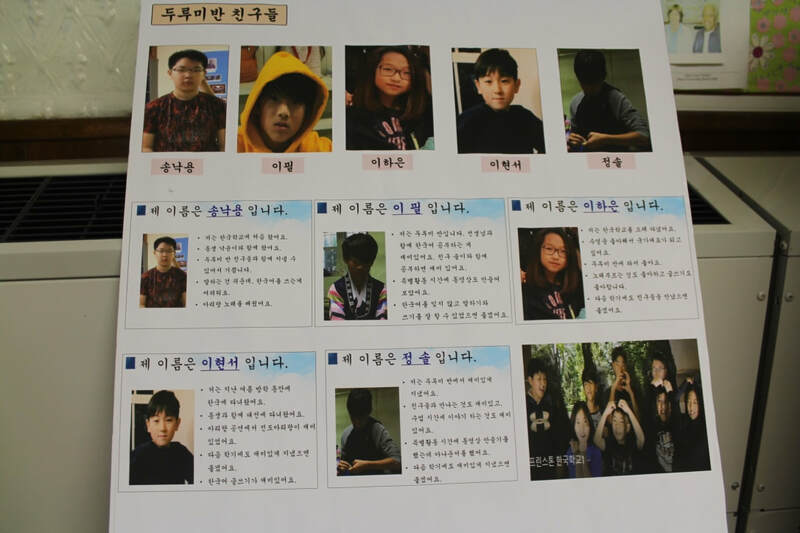 손에 손을 잡고 강강수월래를 추면서 우리는 하나가 되었습니다. It was September 10th, the first day of the fall semester. 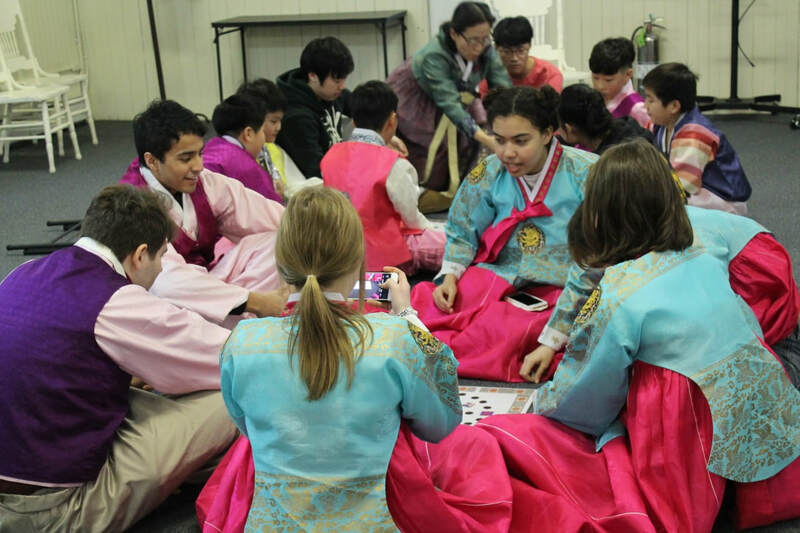 It was unusually warm, but the students came to the Korean school to learn the language and culture. 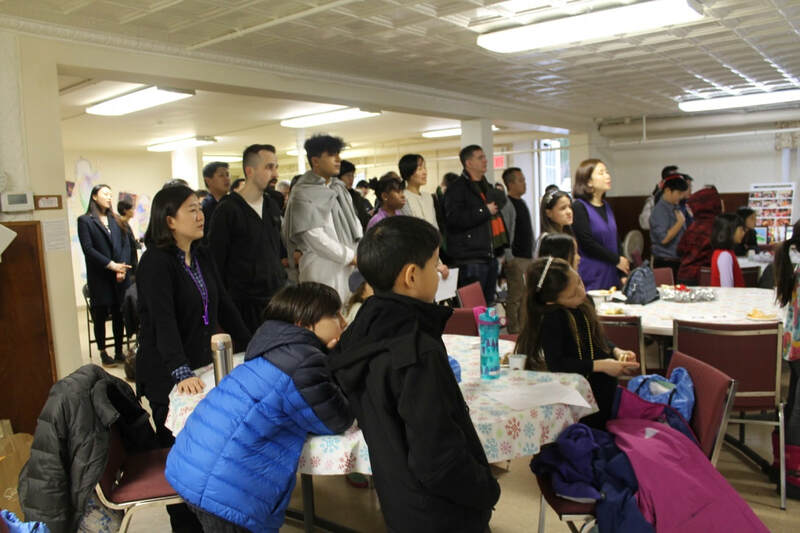 The students, the parents and the teachers got together in the assembly room to greet one another and met the Korean school family after the class orientation. Younger students were very much excited to introduce themselves with the microphone, and the parents patiently waited for them to finish the sentences. 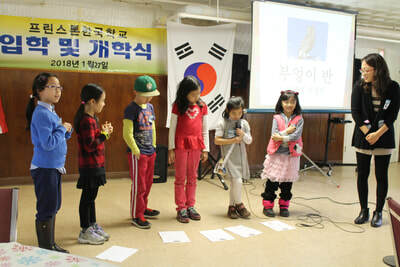 Now let's learn Korean!! 9월 10일 개학하는 날입니다. 조금 더웠지만 학생들은 한국어와 한국 문화를 배우려고 학교에 왔습니다. 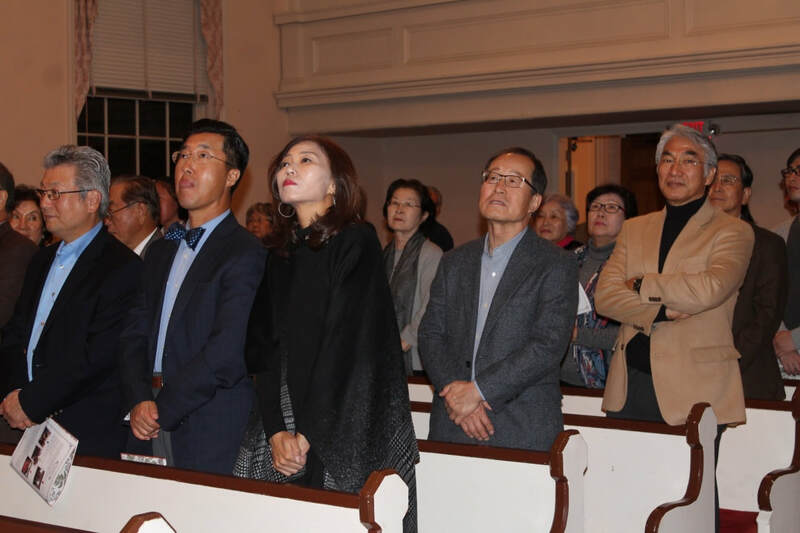 각 반에서 수업 후에 모두 강당에 모여 개학식을 했습니다. 어린 학생들은 선생님이 잡아주는 마이크에 자기 소개를 하고 부모님들은 잘 들어 주셨습니다. 자, 우리 모두 이제 한국말을 배웁시다! 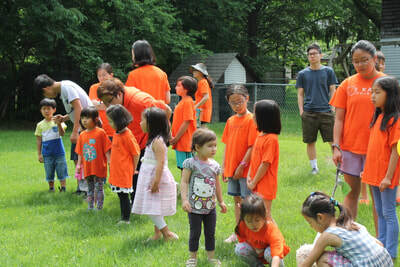 Everyone loved the field day and picnic. 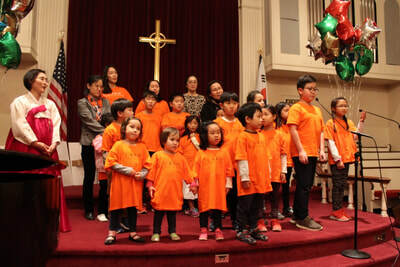 All the students and teachers wore orange school shirts to celebrate the end of school year. 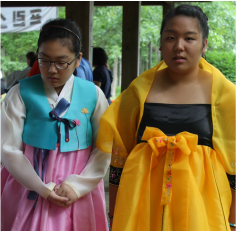 Two graduates were dressed in pretty han-bok. 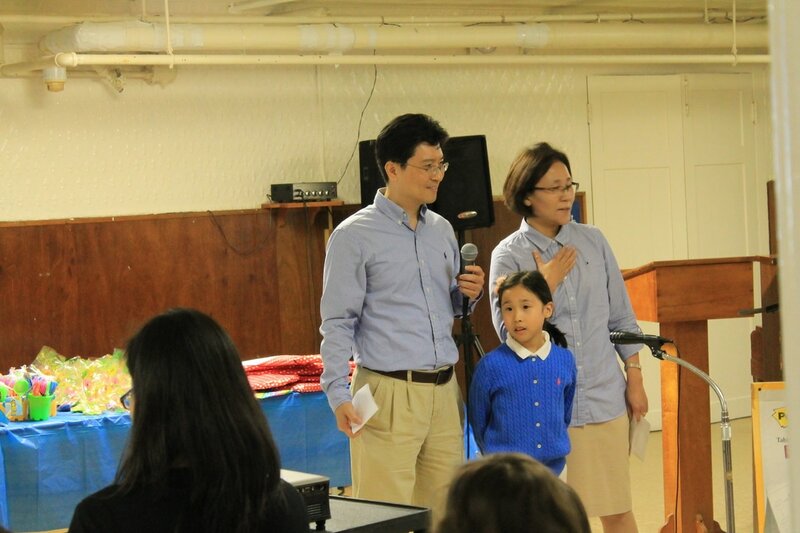 The KAIP family congratulated Eun-suh and Ji-hee and they promised to come to the school as teaching assistants. 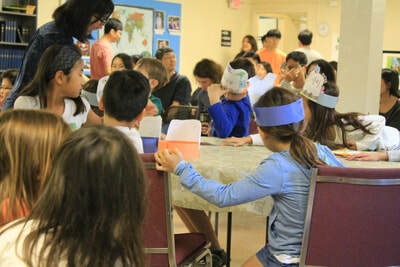 After the ceremony, the students enjoyed with many games while parents were preparing food. 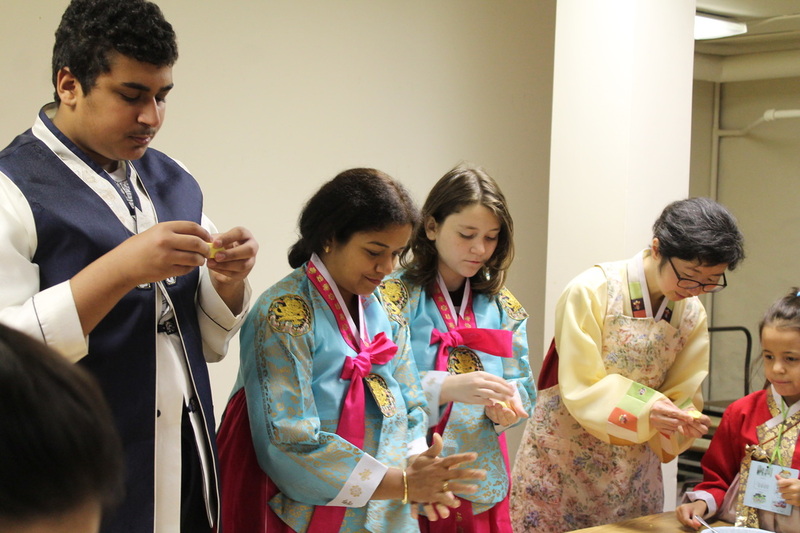 The fun day ended with eating delicious Korean food. ​우리 모두기다리던 운동회의 날입니다. 학생들과 선생님들은 주황색 학교 셔츠를 입었습니다. 두 졸업생들은 예쁜 한복을 입었습니다. 프린스톤 한국 학교 가족들은 졸업을 하고도 계속 학교에 와서 조교를 하겠다는 지희와 은서를 축하했습니다. 종업식과 졸업식 후에 학생들이 재미있게 운동을 하는 동안 부모님들은 맛있는 음식을 준비하셨습니다. 오늘의 즐거운 하루는 맛난 음식을 먹고 마쳤습니다. 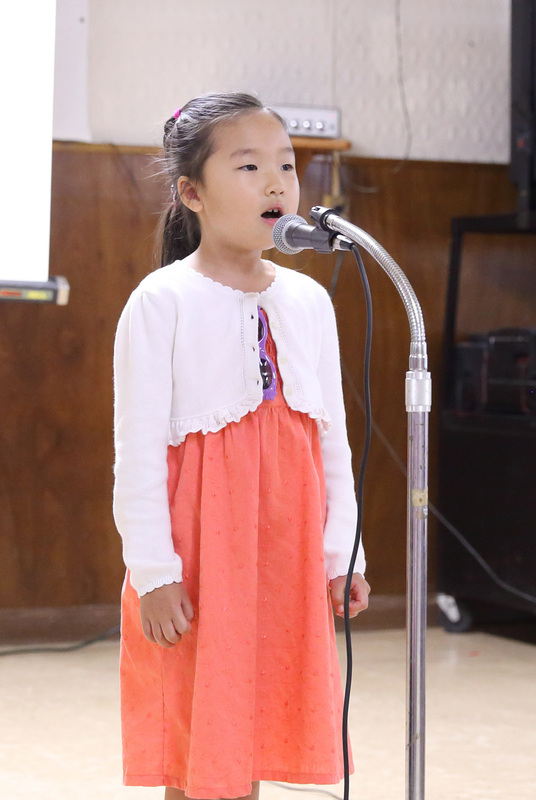 It was a very nice spring day to sing our favorite songs with a perfect pitch! The program opened with 'The Milk Song' performed by the adult class and everyone joined the singing with a happy clapping. 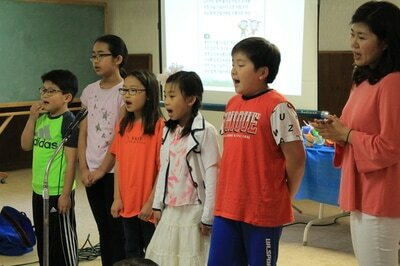 Followed by the solo sung by students who were little nervous but mastered the lyrics and tunes. 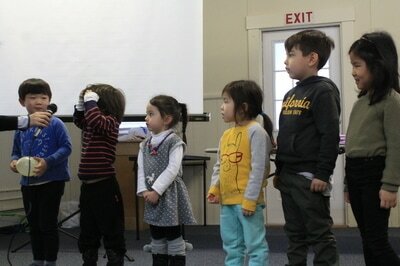 Among the class choruses, the youngest class was a hit and had to do an encore song. 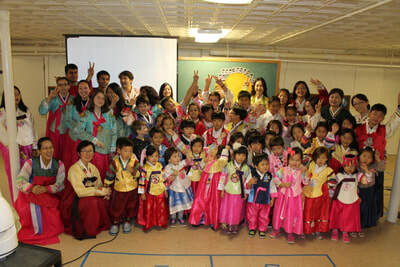 All students who participated in the program did a wonderful job!! 오늘은 목청껏 자기가 좋아하는 노래를 부르는 날로 완벽한 봄 날씨였습니다. 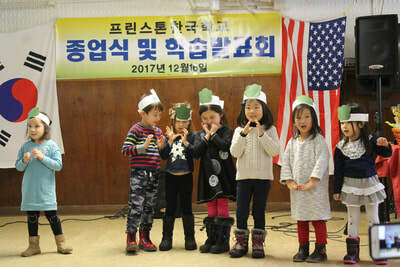 성인반이 첫 곡으로 부른 우유 송은 절로 흥이 나게 하는 노래로 듣는 사람들이 모두 박수로 흥겹게 박자를 맞췄습니다. 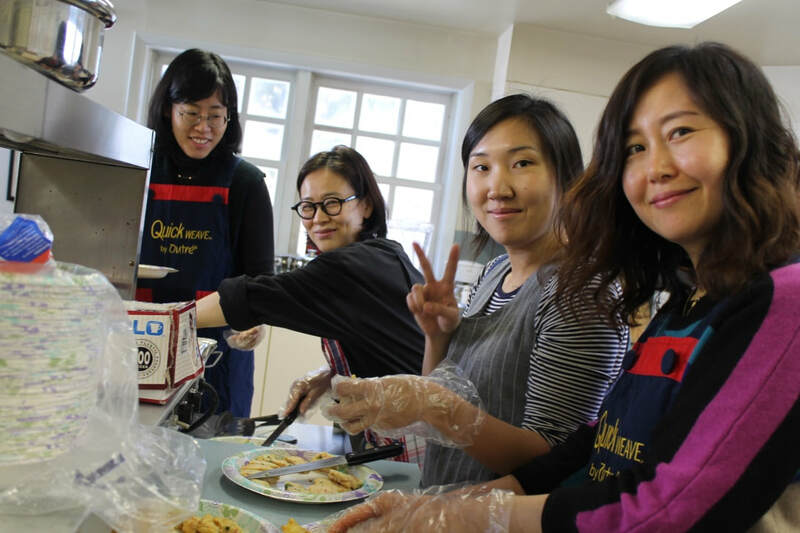 바로 이어 독창을 부른 학생들은 다소 떨리는 듯 했지만 그 동안 익힌 노랫말과 음에 맞춰 노래를 아주 잘 불렀습니다. 각 반의 합창과 중창, 그 중에 제일 어린 반 학생들의 노래는 '한 번 더' 요청을 받기도 했습니다. 참석한 모든 학생들 아주 잘 했습니다!! 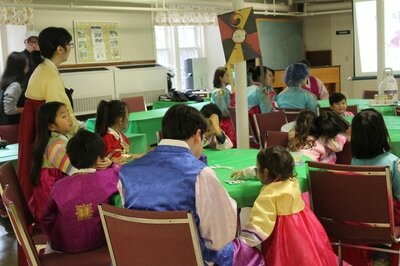 All the participants of the story telling contest were busy up to the last moment memorizing the stories. 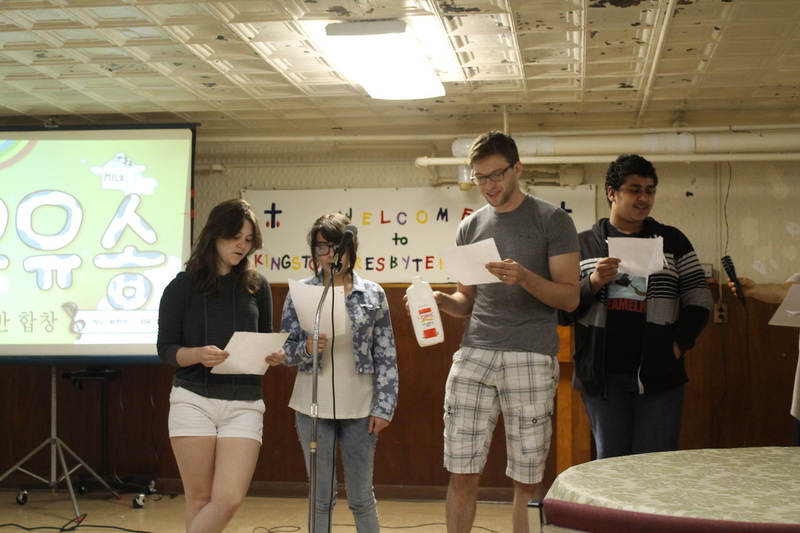 It was wonderful to hear many new stories recited by the students. 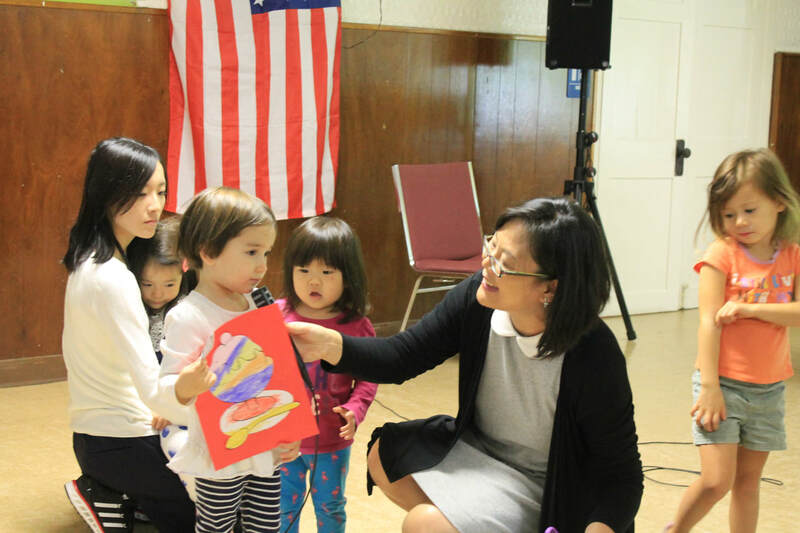 This year's program included something new. 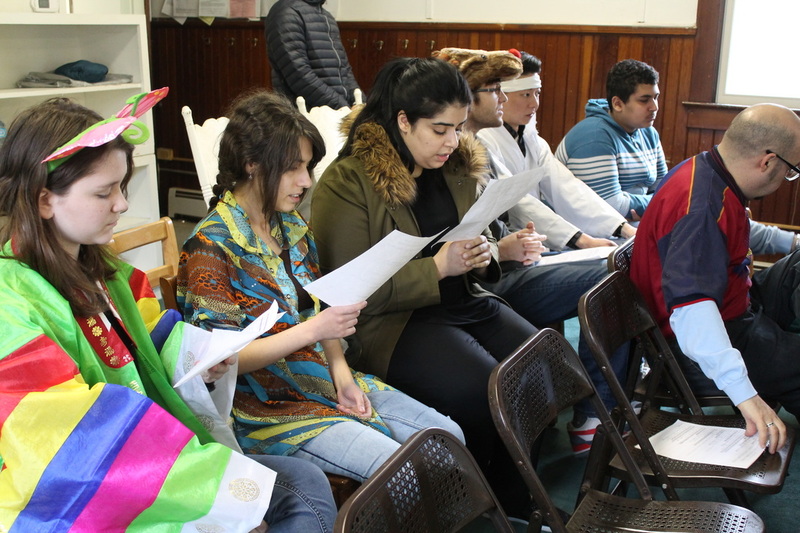 Adult Class presented 'The Woodcutter and The Fairy', dressed in colorful custume. 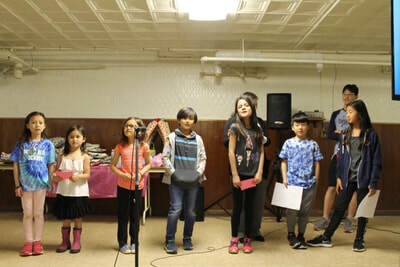 You all did a great job!! 이야기 대회에 참가하는 학생들은 마지막 순간까지 이야기를 외우느라 바빴습니다. 학생들이 준비한 새로운 이야기로 아주 즐거운 시간이었습니다. 올해 이야기 대회에 다른 점이 있다면 어른반의 참여였습니다. 어른반은 '나뭇꾼과 선녀' 이야기를 나뭇꾼과 선녀 그리고 사슴으로 분장하고 나와서 들려 주었습니다. 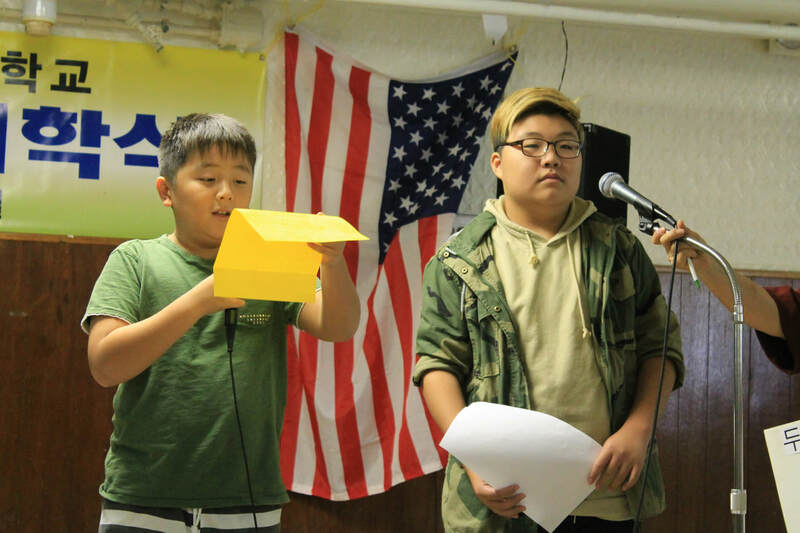 참가한 학생들 잘 했어요!! 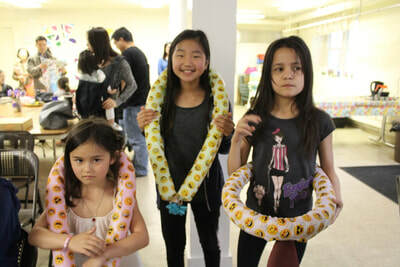 ​ The KAIP PTA's bazaar was very successful! Thank you for all the volunteers for picking up and distributing the mandu, kimchi, jjinpang, etc... your hard work and support makes our future bright! Thank you again!! 학부모회 바자를 잘 마쳤습니다. 하루종일 만두, 김치, 찐빵 등을 가지고 와서 나눠주시고 도와주신 학부모님들 진심으로 감사합니다!! 올해는 '붉은 원숭이해'랍니다 처음 세배해요 투호놀이, 몇 개 넣을 수 있어요? 그동안 잘 지내셨지요? 올해는 겨울 같지 않은 포근함이 계속되더니 엊그제부터는 제법 인디애나다운 칼바람이 옷깃을 파고들어 정신을 번쩍 차렸답니다. 선생님들께 안부 편지 한번 드려야지 마음먹은 지 오래인데 게으름을 피우다 보니 추수 감사절을 맞닥뜨려 시간을 보내고 다급하게 다가오는 연말에 쫓기며 이제야 안부를 여쭙니다. 우리 가족이 인디애나에 이사 온 지 벌써 사 년째에 접어들었어요. 이곳도 적응하며 지내다 보니 별 불편한 점 없이 살기 좋은 곳이긴 하지만 프린스턴에 두고 온 좋은 인연들과 추억들이 아직 많이 그립습니다. 시작할 엄두가 나지 않아 송편도 없이 추석을 보내며 '지금쯤 알록달록 추석 송편 빚기를 하겠구나', 또 11월 초가 다가오면 '기금 모금의 밤 행사 준비로 바쁘시겠구나, 아! 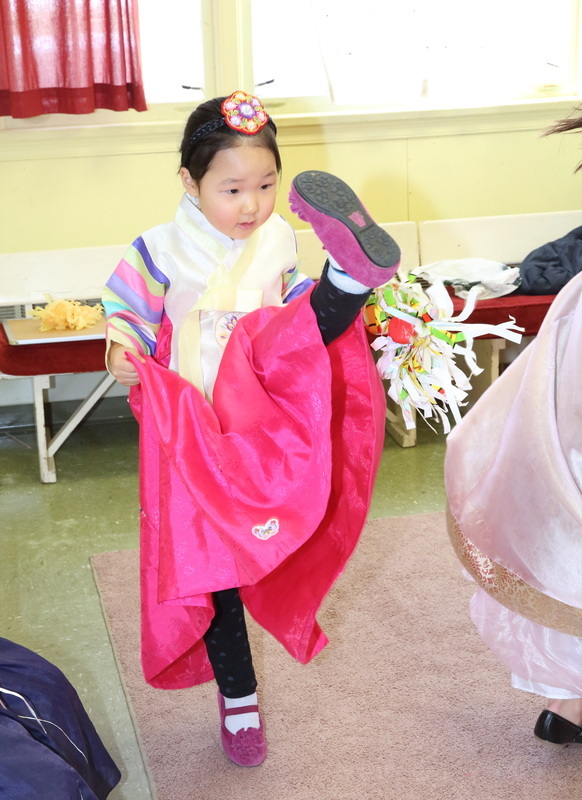 그리운 가곡!' 등 문득문득 학교 행사가 떠오릅니다. 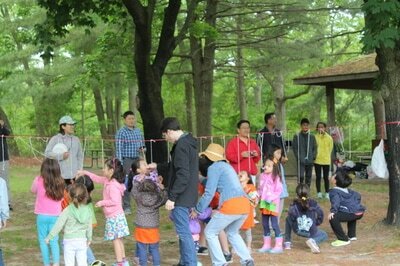 특별히 올해에 프린스턴 한국학교가 개교 20주년을 맞은 것으로 알고 있어요. 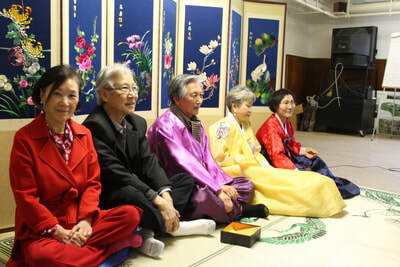 늦었지만 축하합니다. 그리고 무궁한 발전이 있기를 멀리서 응원합니다. 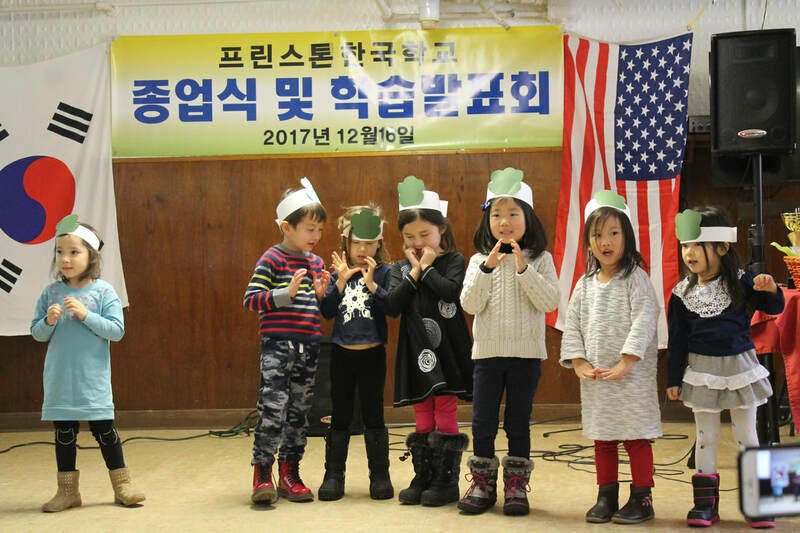 수린이 아빠와 저는 흰머리가 늘긴 했지만, 덕분에 별일 없이 잘 지내고 있어요. 아이들이 각자 바빠지니 저는 일상이 오히려 한가하고 단조로워요. 그래서 무료함을 달래고자 근처에 있는 장애인 Day Care Center에서 매주 화요일마다 종이접기를 가르치고 있어요. 그분들이 흥미를 느끼고 따라올 수 있도록 매번 아이디어를 짜내려니 종종 귀찮은 생각이 들 때가 없는 건 아니지만 제가 사는 커뮤니티와의 작은 소통이 반복되는 일상에 긍정적 리듬이 되어 줍니다. 지난주에는 올해의 마지막 수업이라 브라우니를 구워가서 나눠 먹었어요. 언제까지 하겠다는 기약 없이 시작하였는데 벌써 일 년이 다 되었네요. 현성이는 키가 훌쩍 커서 우리 집에서 제일 큰사람이 되었어요. 코밑의 솜털도 제법 거무스름해져서 올 크리스마스엔 면도기를 선물로 주려고 준비해 두었답니다. 현성이가 프린스턴 한국학교에 입학할 때가 세 살이었는데 벌써 수염을 깎을 때가 되었다니 정말 세월이 빠르지요? 얼마 전에는 운전면허를 따서 주말엔 종종 혼자 운전을 하기도 해요. 11학년이 되었으니 어떤 전공을 하고 싶은 지 얘기하고 있는데 아직 방향이 자주 바뀌고 있어요. 예린이는 내년 봄 졸업을 앞두고 이번 학기에 이탈리아에 교환학생으로 가 있어요. 파스타를 좋아해서 이탈리아로 정했다며 가방 두 개를 꾸려서 훌쩍 떠나더니 유럽 대륙을 정복이라도 할 듯한 기세로 부지런히 여행을 다니고 있어요. 이제 학기가 끝나서 수린이와 제가 내일 로마로 가서 예린이를 만나 며칠 구경하고 12월 말에 함께 돌아오려고 해요. 수린이는 지난여름에 샌프란시스코에 소재한 연방 법원에서 인턴을 하였고 아직 세 학기가 남았지만, 졸업 후에는 뉴욕에서 일하게 될 것 같아요. 회사법보다는 소송관련 분야가 재미있다고 하는데 앞으로 공부하며 더 구체적인 길을 찾아가겠지요. 선생님들께서는 지금쯤 종업식을 마치고 달콤한 방학을 즐기고 계시겠지요? 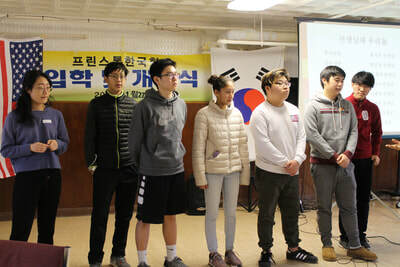 전에는 학생들만 방학을 기다리는 줄 알았지만, 이제는 선생님들도 못지않게 방학을 고대한다는 것을 알아요. 하지만 휴식이 길어지다 보니 휴식은 짧을 때 달콤하다는 깨달음을 얻습니다. 부디 몸도 마음도 넉넉히 쉬시고 새로운 에너지 많이 충전하시기 바랍니다. 올해도 학생들 가르치시느라 수고가 많으셨을 우리 선생님들, 연말 잘 보내시고 새해에는 더욱 건강하고 기쁜 한 해가 되시기를 기원합니다. 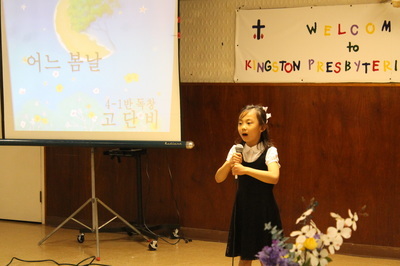 The highlight of the Annual Fundraising Night is student’s performance. 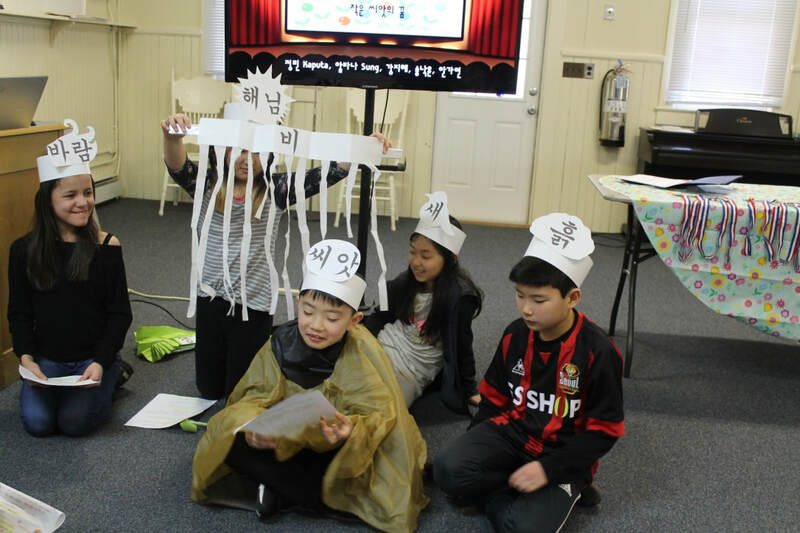 The KAIP students worked very hard to demonstrate that they are learning Korean language and the culture very well. 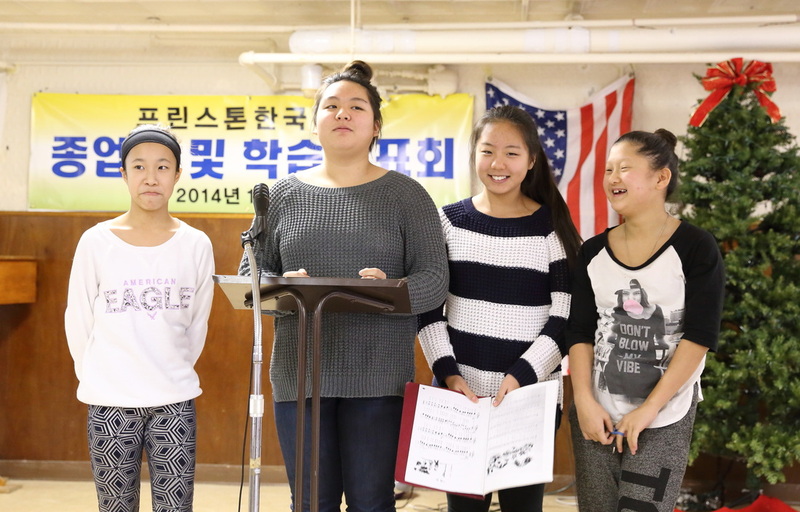 This year it was held on November 14th , 2015, and the students impressed the audience with the Samulnori and the chorus. 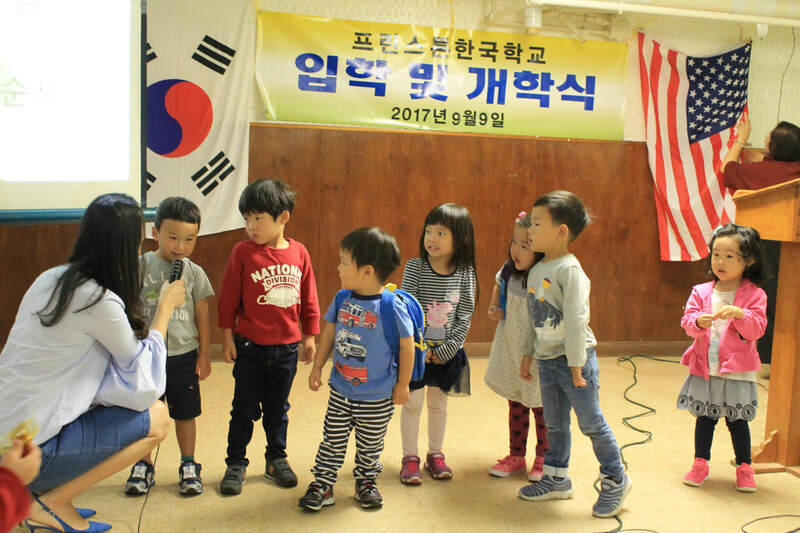 Who would think the little students made such a harmony with the traditional Pungmul sound together with jangu, buk, Jing and Qoenguari! It was a great performance!! 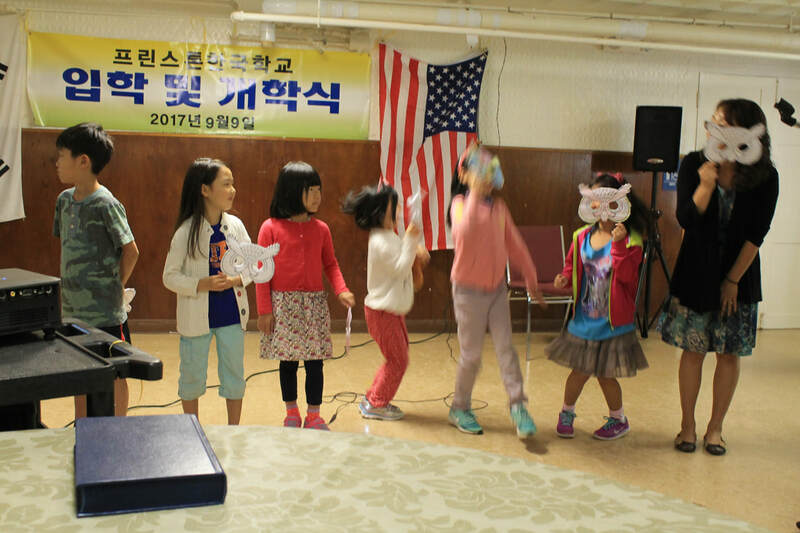 기금모금의 밤은 학생들의 발표의 날이기도 합니다. 프린스톤 한국학교 학생들이 학교에서 한국말과 문화를 잘 배우고 있다는 것을 보여주는 날이기 때문입니다. 이번 11월 14일에 우리 학생들은 사물놀이와 합창으로 참석하신 많은 분들을 감동시켰습니다. 누가 어린 학생들이 우리의 전통 풍물인 장구,북, 징 그리고 꽹과리로 일치된 소리를 낼 줄 생각했겠습니까? 아주 훌륭한 연주였습니다!! 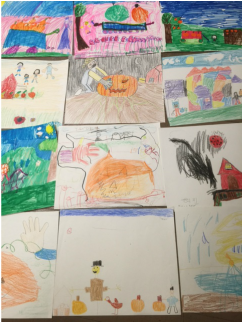 October 3rd was an annual Writing and Drawing Contest. 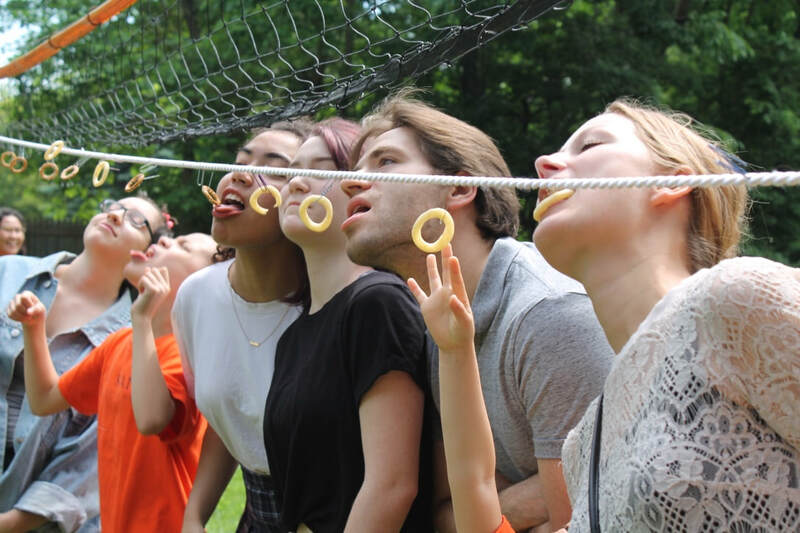 The posted themes were Pumpkin Picking and Snickers. All KAIP students participated in the contest to express their thought and ideas through drawing, writing or both. All participants did a good job! 10월 3일은 프린스톤 한국학교 글 그림 대회였습니다. 이 날 발표된 주제는 '호박 따기'와 '운동화' 였습니다. 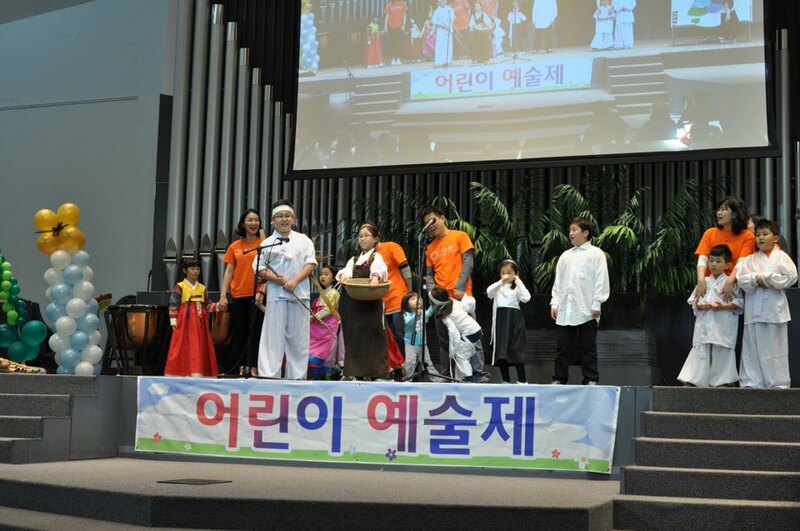 프린스톤 한국학교 전제 학생들이 참가한 이 대회는 모두의 창의적인 생각을 글과 그림으로 표현하였습니다. 모든 학생들의 작품은 아주 훌륭하였습니다! 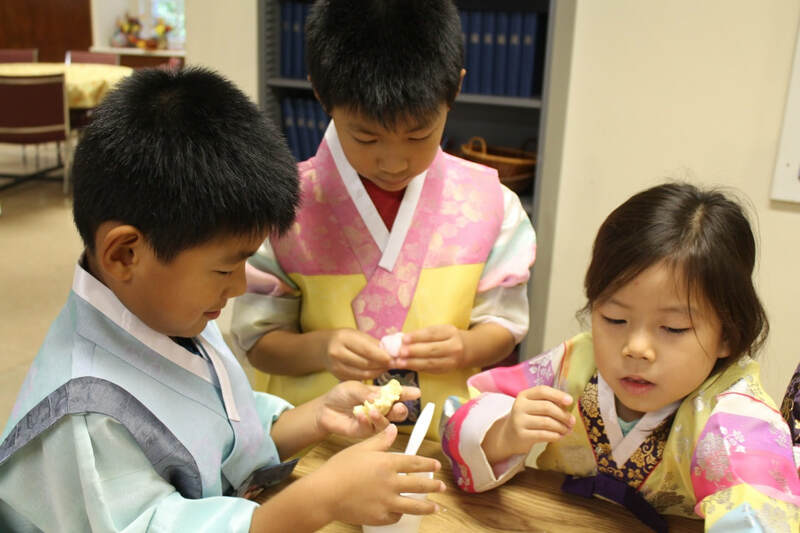 Some students know how to make song-pyun but others may not know what is Chuseok, the Korean harvest festival. 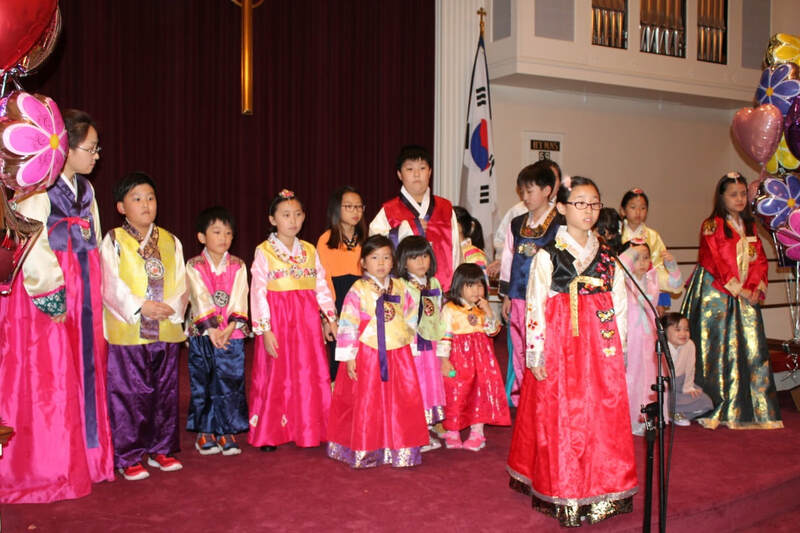 For many years, KAIP has been celebrating Chuseok, making song-pyun and enjoying it together. 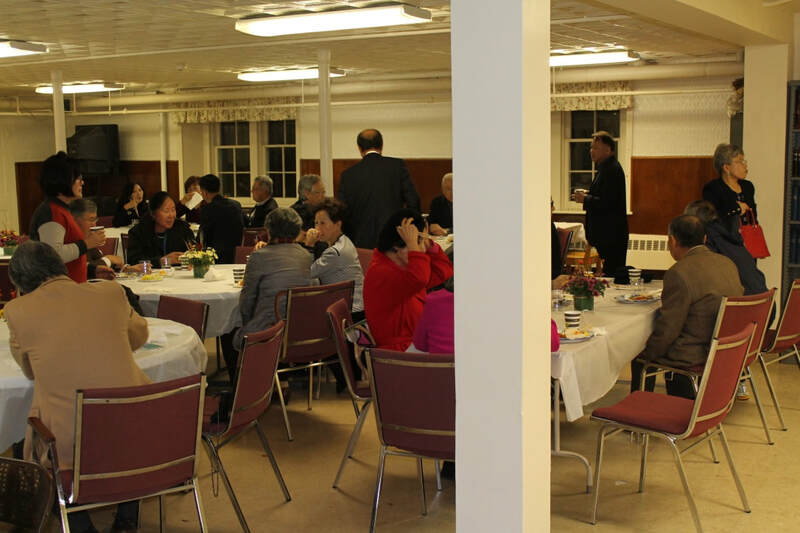 The busiest place in this celebration is the kitchen. 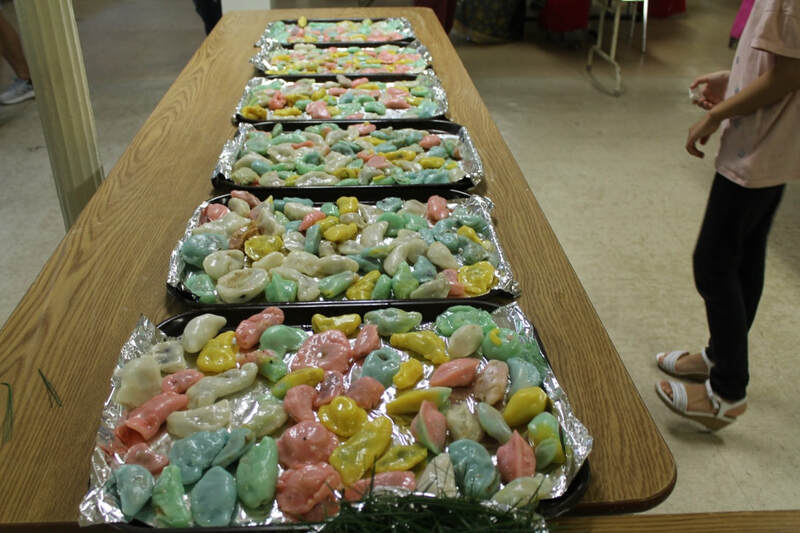 In the kitchen, the parents' hands move fast, preparing dough, washing pine needles(! ), steaming the song-pyun the students made, and apply sesame oil to the steamy song-pyun for a finishing touch. 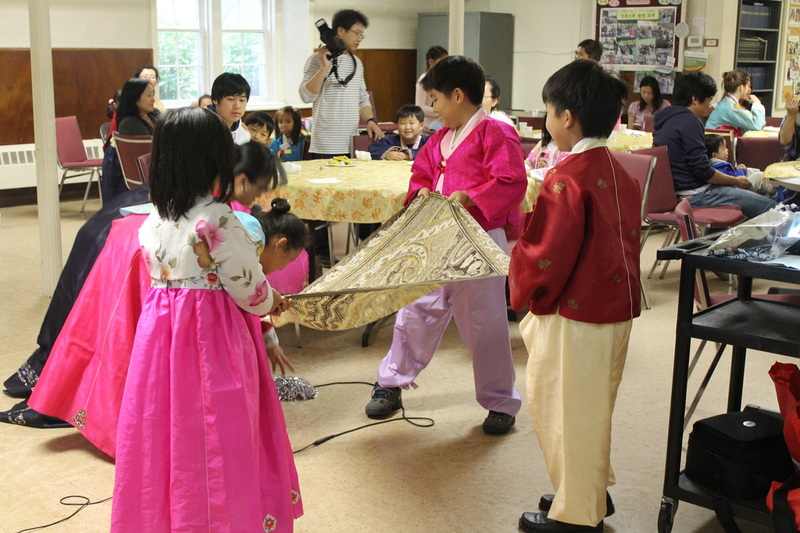 This years Chuseok celebration was fun. It was memorable too! 어떤 친구들은 송편을 어떻게 만드는지 잘 알지만 어떤 친구들은 추석이 무엇인지도 모릅니다. 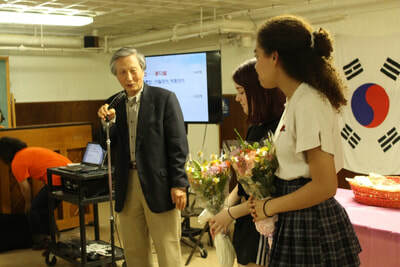 우리 프린스톤 한국학교에서는 송편을 예쁘게 만들어 나누어 먹으며 추석잔치를 합니다. 추석 잔치을 할 때 제일 바쁜 곳은 부엌입니다. 부엌에서 부모님들은 아주 바쁩니다. 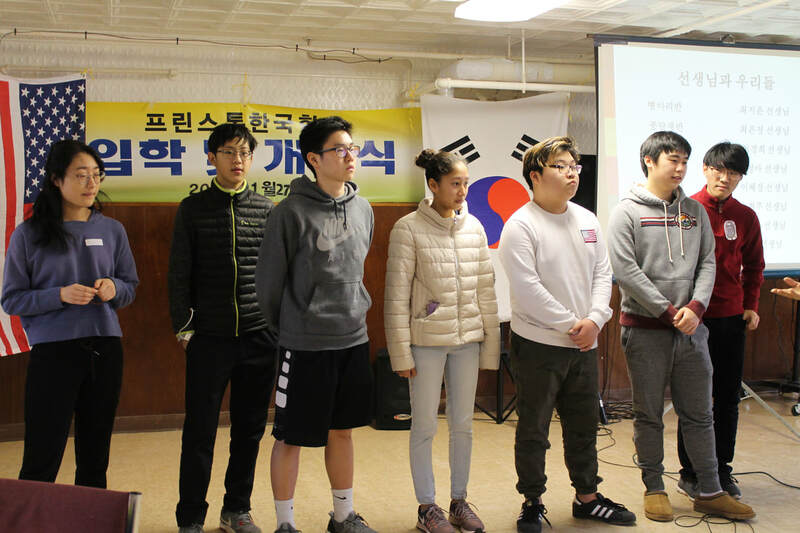 쌀가루를 반죽하고 솔잎을 씻고 학생들이 만든 송편을 찌고 잘 익은 송편에 참기름을 발라 마무리 합니다. 올해의 추석 잔치도 기억에 남을 만큼 아주 재미있었습니다! 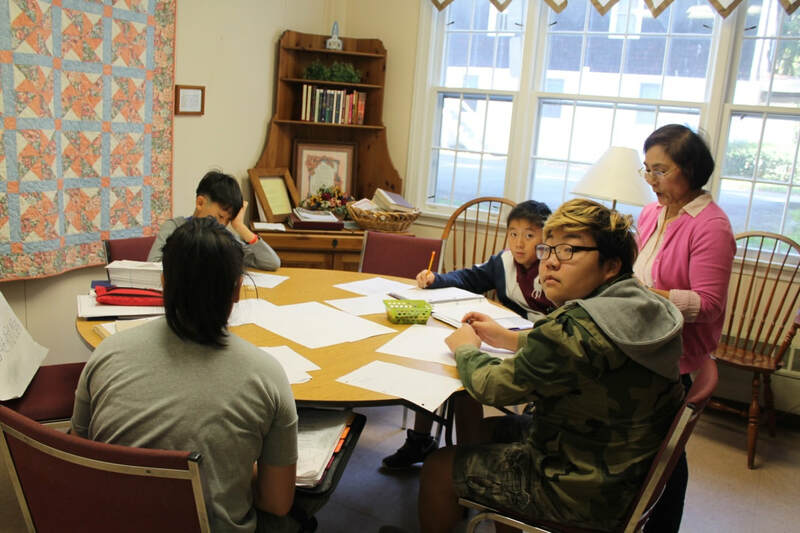 The Princeton Korean School is in session after a long summer break! The teachers and parents greeted each other on the first day of school. We all wish a fruitful fall semester!! 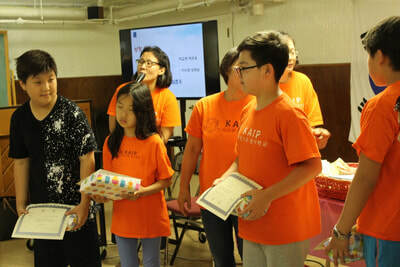 The two devoted KAIP teachers participated in the three day conference for Korean school teachers from July 16th to 18th in Teaneck New Jersey. They had a great learning experience listening to the lectures from experts and participating in many workshops. Thank you! 프린스톤 한국학교 두 선생님들께서 7월 16일부터 18일까지 티넥에서 열린 전국 학술대회에 참석하셨습니다. 두 선생님들께서는 많은 강의와 웍샵을 통해 새로운 것을 배우고 또 경험하고 오셨습니다. 고맙습니다! 이 초복 더위에 어찌들 지내시는지요. 비 오는 거리를 내다 보면서 카페에 앉아서 이메일을 쓰고 있어요. 커피 한 잔 마시고는 오래 앉아 있기가 눈치 보여서 곧 따나려고 해요. 여기는 거리에나 식당에나 극장에나 전람회장이나 가는 곳마다 마스크 안한(?) 사람들로 넘쳐나고 있습니다. 어제는 혼자서 자하문 밖의 '윤동주기념 문학관'을 찾느라고 쌕을 매고 경복궁 앞의 1020 버스를 기다리며 버스 노선 지도를 살피고 있는데 누가 뒤에서 <교장 선생님 아니세요? >해서 뒤로 돌아보니, 글쎄 이회여대 국제대학의 노상호 박사이셨어요. 우리 학교 역사 교사이시기도 했고 프린스턴에서 학위 끝내시고 귀국하실 무렵에 한겨레에서 강연 연사로도 수고하셨었지요. 어쩌면 그렇게 약속 없이 우연히 만날 수 있었는지 참 신기하더라니까요. 버스가 금방 와서 귀여운 따님과 가족의 안부도 나누지 못하고 헤어졌는데 곧 온 가족이 방학을 보내러 프린스턴에 가신다고 하는 것 같았어요. 윤 동주 문학기념관은 아주 예쁘게 만들어졌어요. 후꾸오까 감옥에서의 고통을 실감할 수 있는 실습도 하면서요. 백 선생님이 열심히 가르치신 윤동주의 '새로운 길' 과 '별 헤는 밤'을' 다시 읽으면서 우리가 가졌던 한겨레 강좌 때의 현 봉학 선생님을 떠올리기도 했어요. 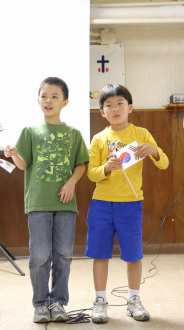 그리고 사직공원으로 내려가는 숲속의 등산로도 참 좋더라구요. 선생님과 같이 거닐던 프린스턴의 캐널을 삼삼히 그리워하다가 모처럼 아름다운 이 숲길을 발견하고는 정말 즐거운 시간을 보냈어요. 그런데 또 하산 길에서 누구를 만난 줄 아세요? 산보하러 나오신 김길자 총장(이승만 홀 명명식에 오셨던 경인대학 전총장)을 만났다는 것 아닙니까. 세상은 아니 서울은 참 좁은 곳이더라구요. 강원도 평창에도 다녀왔지만 있을 만한 방을 찾을 수 없었어요. 가뭄에 물이 없어서 손님을 받을 수 없는 곳이 강원도라니까요. 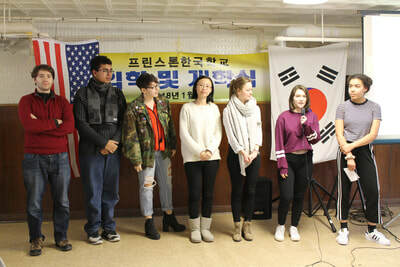 이번 비로 해갈이 되었는지 모르겠어요. 곤지암도 다녀왔고 설악에는 김영숙 선생님과 다음주에 같이 가서 머믈다 올 거예요. 저는 모처럼 곳에 따라 시간이 느리게 흘러갈 수도 있다는 것도 알게 되었지요. 그래서 '연평도' 영화도 보고 불란서 영화 ' 알로 슈티'라는 재미있는 영화도 보았어요. (불란서 사람 1/3이 보았다는 영화입니다. 꼭 한번 보세요.) 그리고 곳곳의 전람회장에도 들리며 말로니에 공원의 연극 구경도 가려고 마음 먹고 있어요. 친 구와 제자들에게 당분간 제소재를 알리지 않고 지내고 있어요. ( 어디서 어떻게 알았는지 남자 제자들이 전화를 해 와서는 그만 이대부고졸업생들에게는 탄로가 났지만 국문과 제자들에게는 극비로 지내고 있지요.) 자유롭게 제 마음대로 옛날의 서울 고샅 고샅을 돌아다니는 즐거움을 만끽하고 난 다음에 친구들과 옛 동료들과 만나는 기쁨을 천천히 누려보려고 시간을 아끼고 있어요. 제가 살던 신촌 동회에도 찾아가 보려고 해요. 인터넷을 못하니까 다 물어물어서 다니는데 전철료가 1250으로 올랐어요. 학 교가 방학 동안에도 잘 돌아가고 있어 선생님들께 제 감사한 마음을 전합니다. 저는 이메일을 자주 하지 못해요. 카페라는 곳은 젊은 아이들 차지라서 머리 하얀 노인네는 앉아 있을 수도 없고 컴퓨터를 할 만한 곳은 서로 기다리는 판이라서요. 우 리 선생님들, 온 댁내 건강하시고 여름 동안 평안하시기를 서울에서 빕니다. 백 선생님과 남 선생님, NAKS 학술대회에 가셔서 공부 많이 하시고 돌어오셔서 가르쳐 주시기 바랍니다. 제 아이패드는 작동이 중지되어 쓰지 못합니다. 안녕히 계십시오. The second annual singing contest on May 16th was a great success. 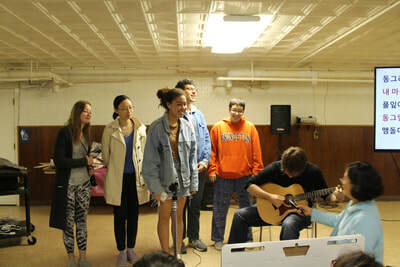 There were solos, duets, chorus and class presentations and more. 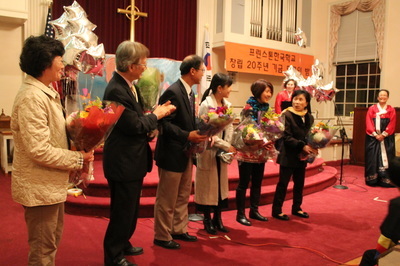 Ko, Danbi and Lee Haeun got the first and second places in this event. 제2회 노래부르기 대회를 아주 잘 마쳤습니다. 독창, 중창, 합창 그리고 각 반의 노래등으로 즐거운 시간이었습니다. 고단비 학생과 이하은 학생이 상을 받았습니다. 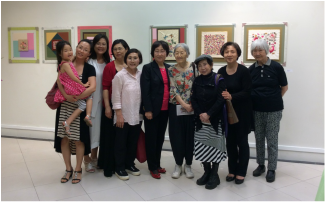 KAIP teachers visited Nabi Museum in Teaneck to see the exhibit of the Korean Traditional Knot Art by Ms Hur. 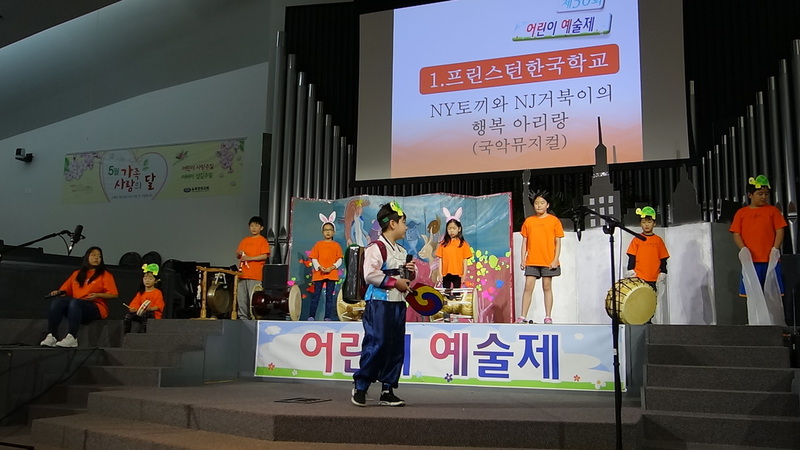 한국학교 선생님들은 나비 박물관 (Teaneck, New Jersey)에 전시된 허낭자 선생님의 전통 매듭 전시회에 다녀왔습니다. 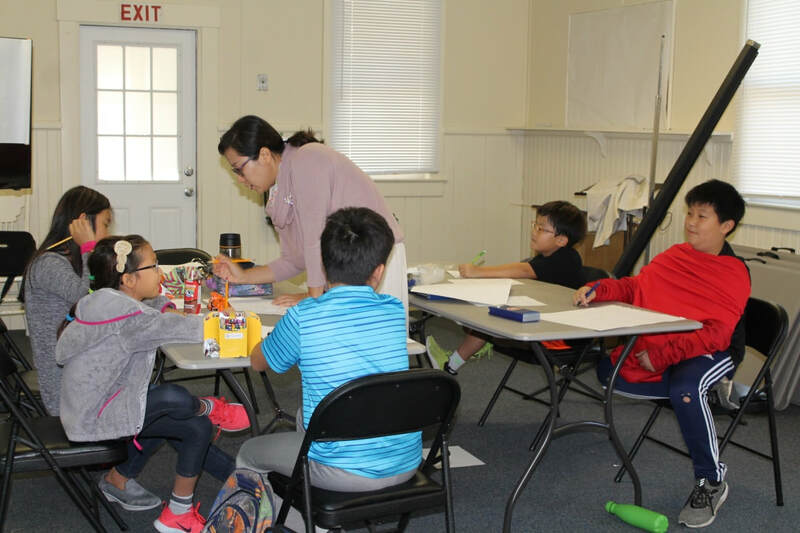 KAIP teacher recognized in NAKS! 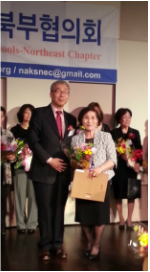 Ms. Eun-ok Lee was recognized in NAKS-NE on April 9, 2015. She has been teaching in Princeton Korean School more than ten years. 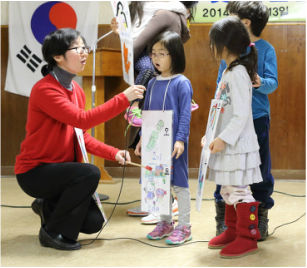 She teaches not only Korean language but also calligraphy and music. 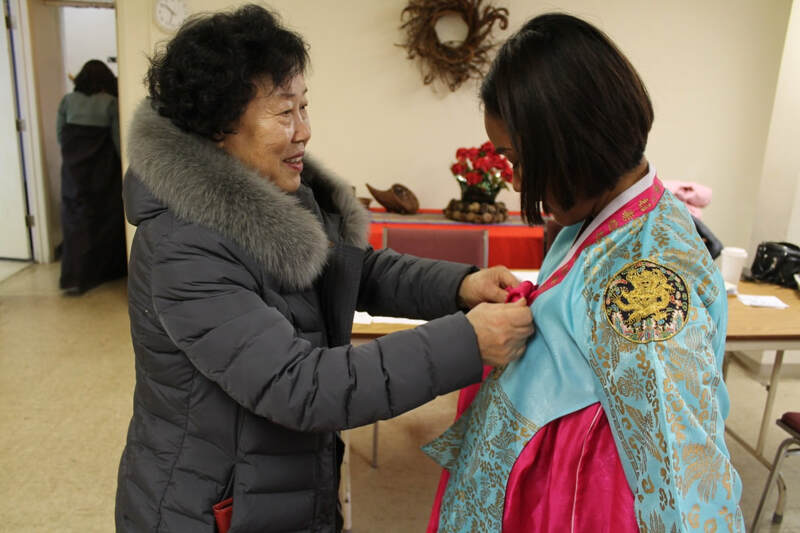 She is also devoted herself enhancing Korean culture in Princeton area. She deserves the prize. Congratulations sunsaengnym!! 2015년 4월19일에 프린스톤 한국학교 교사 백은옥 선생님께서 동북부 교사 협의회에서 공로상을 받으셨습니다. 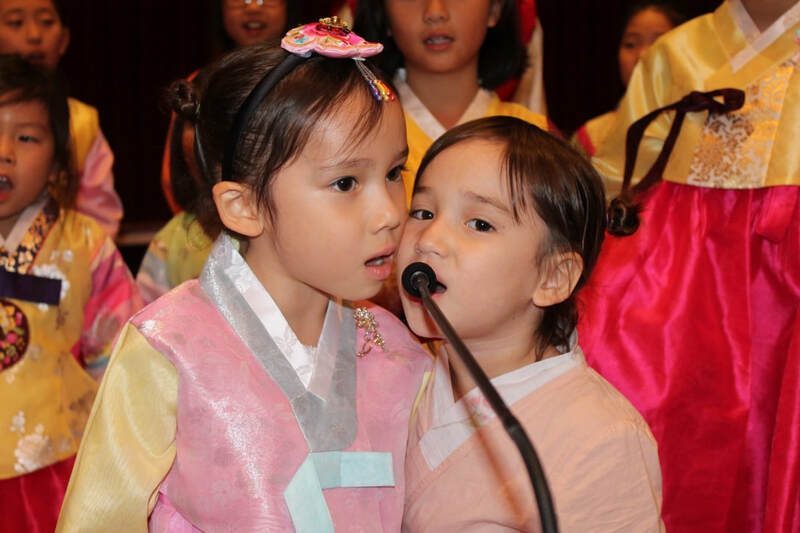 백선생님은 10년 이상을 프린스톤 한국학교에서 한국말뿐 아니라 붓글씨와 음악을 지도하시고 계십니다. 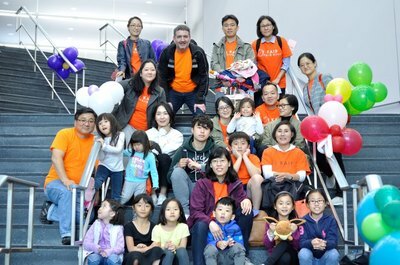 백선생님은 한국 학교와 지역사회에서 한국 문화를 알리시는데 애를 많이 쓰셔서 상을 받으셨습니다. 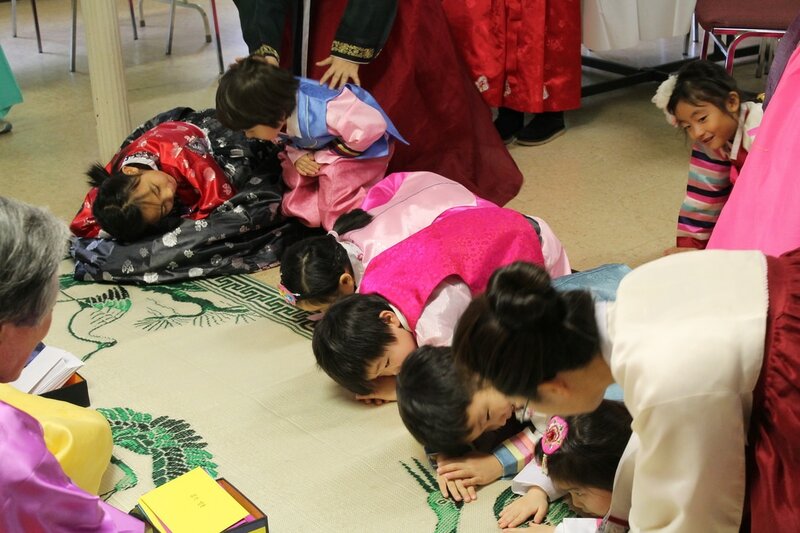 백선생님, 축하합니다! 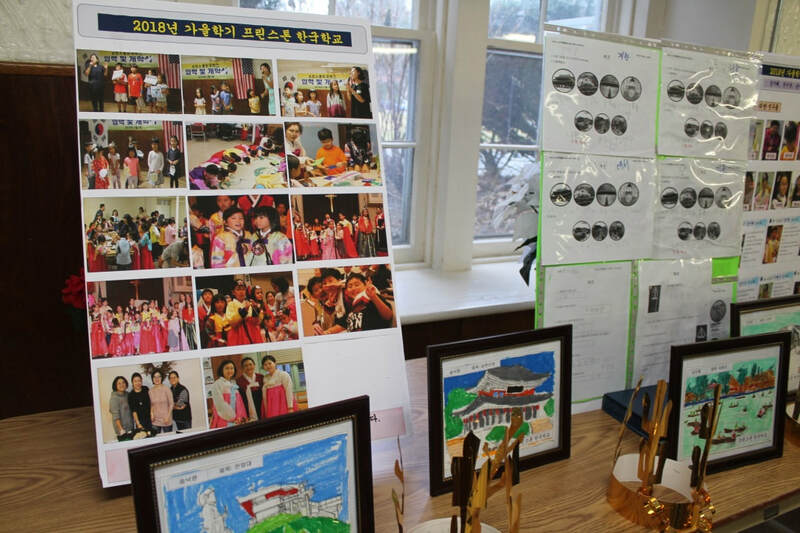 우리 학교 이하은 학생(1학년)이 동북부 이야기 대회에서 상(Bronze Trophy)을 받았습니다. 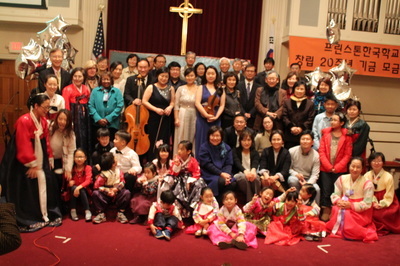 축하합니다!! 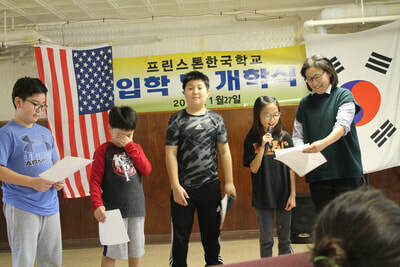 동영상으로 이하은 학생의 재미있는 이야기 '호랑이를 이긴 토끼' 를 직접 보세요. 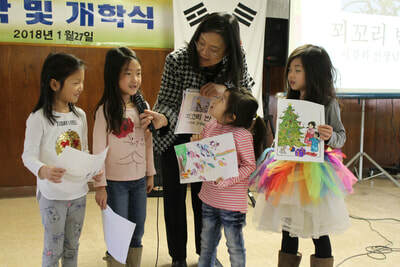 Ha-eun Lee (1st grader) from KAIP was awarded the Bronze Trophy in NAKS Storytelling Contest. Many congrats!! 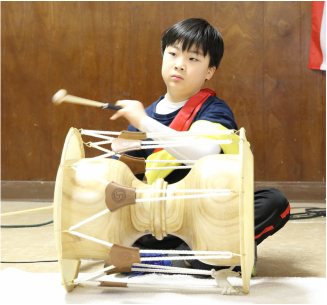 You can watch Ha-un Lee's story telling performance in KAIP's Youtube channel. Click here. 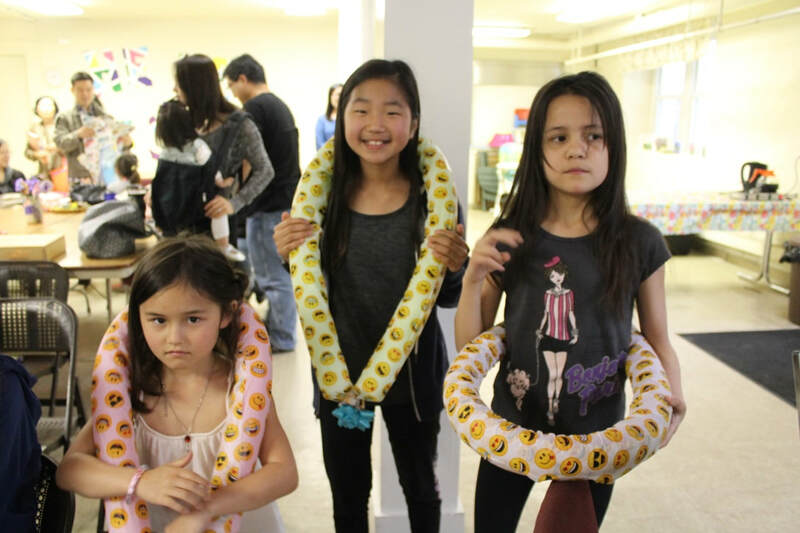 Treasures from the KAIP's story pouch were revealed on this rainy spring day! It was wonderful to hear many stories recited by the KAIP students. The youngest contestant, four years old, memorized and told very smoothly the story, 'The Farmer Who Chased The Monster Away' and got the most attention. 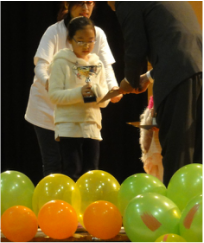 Of course, she won a prize for her talent. 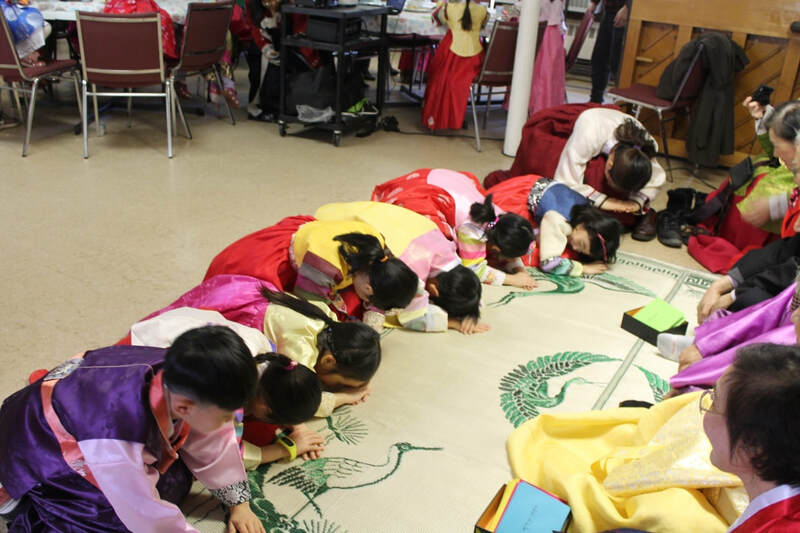 We all know the efforts and stress involved in memorizing and reciting the stories. 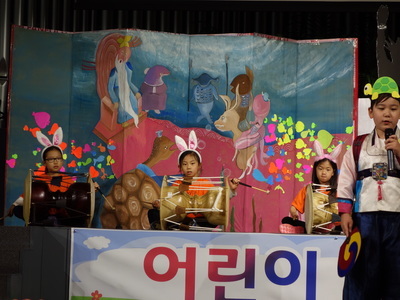 Thanks to the parents and the teachers who encouraged the students to learn the language and give a wonderful public performance. Job well done!! 프린스톤 한국학교의 이야기 보따리가 봄비 내리는 날에 활짝 열렸습니다. 학생들이 외워서 들려주는 이야기는 아주 재미있었습니다. 네 살의 가장 어린 학생이 '도깨비를 물리친 농부' 이야기를 모두 외워서 거침없이 말 할 때는 듣는 모든 사람들이 깜짝 놀랐습니다. 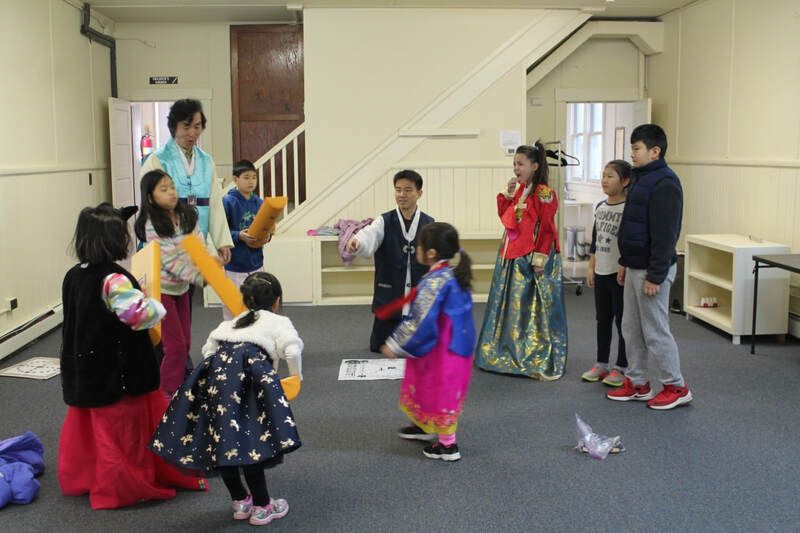 물론 그 학생은 인기상을 받았지요. 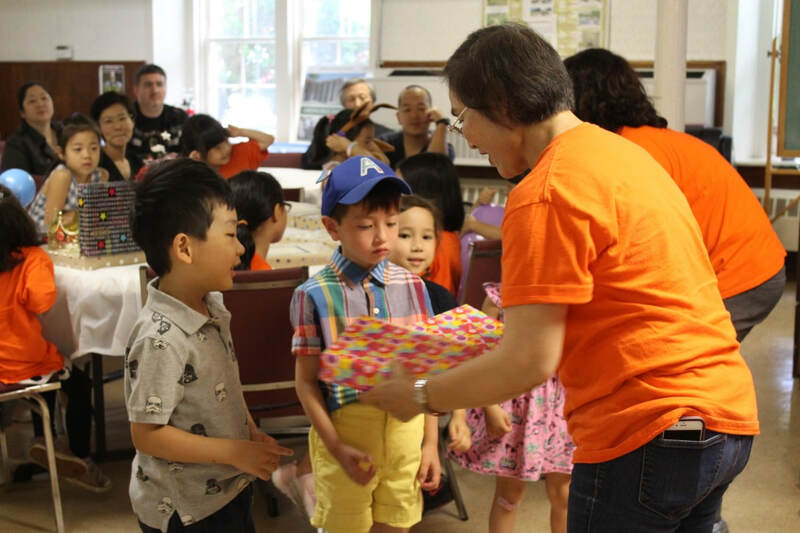 학생들이 이야기를 외우고 많은 사람들 앞에서 외우는 것은 참 어렵습니다. 이야기를 연습시켜 주신 부모님들 그리고 선생님들 고맙습니다. 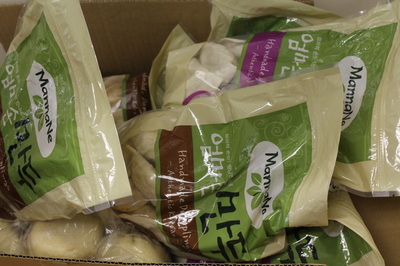 아주 잘 했습니다!! Who would believe we only had less an hour to practice for the performance? 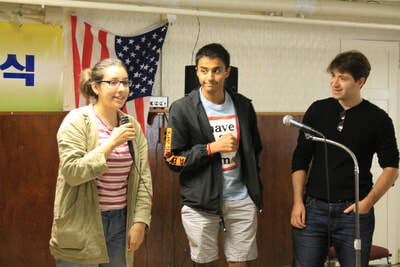 We rocked it! 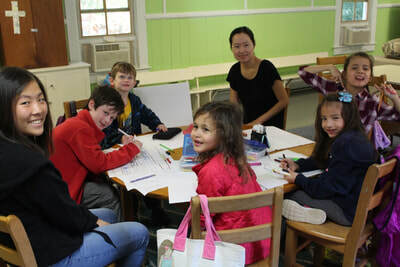 I sincerely thank all the students--especially our four older students who graciously came to help our younger ones. 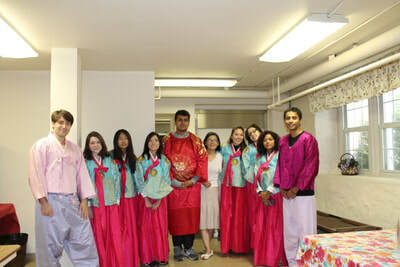 Our performance was amazing. The younger students had the entire semester to learn how to play these instruments but the older students have never even played these before. Thanks to their hard work and the support of the parents and teachers, we gained the confidence to perform. Thank you! 우리 사물놀이 팀이 공연 바로 전에 만나서 한 시간 정도 같이 연습하고 무대에 올라가서 연주를 했다면 누가 믿을까요? 우리 학생들, 특히 네 언니/누나들이 어린 학생과 함께 아직 배우지도 않은 악기들을 함께 연주해 주겠다고 기꺼이 나서주어서 얼마나 고마웠는지 모릅니다. 어린 반 학생들은 지난 학기에 한국 악기를 배웠지만 고급반 학생들은 괭과리, 징, 북, 장구를 배우지도 않았습니다. 그렇지만 우리 학생들은 할 수 있다는 확신과 부모님 그리고 선생님들의 확실한 뒷바침으로 무대에 섰습니다. 열심히 해 주어서 고맙고 잘 해서 정말 훌륭합니다. 좋은 팀웍으로 이뤄진 공연이었습니다. 고맙습니다. We have learned so much! We have achieved the ability to communicate with others in Korean. 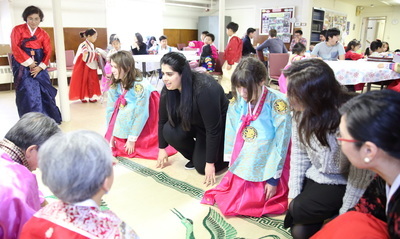 We have also learned much about the culture; the calligraphy, the arts, the music, and so much more! 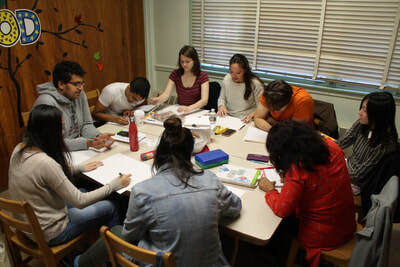 We look forward to learning more in the spring semester. 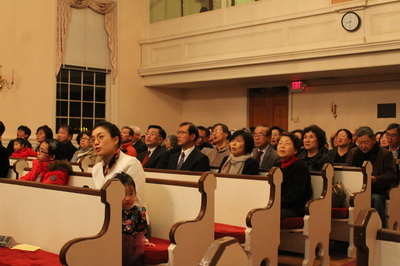 우리들은 한국말로 말하고 쓸 수 있어요. 우리들은 봄학기에 더 많이 배울거예요. 멋진 준성이와 인혁 그리고 예쁜 선생님! Showing off the arts! 내가 제일 잘 그렸지요? How are my drawing?우리 그림 어때요? Colors, colors everywhere! 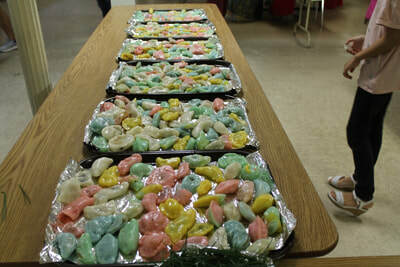 The younger classes had so much fun making flour play-dough before the drawing contest. 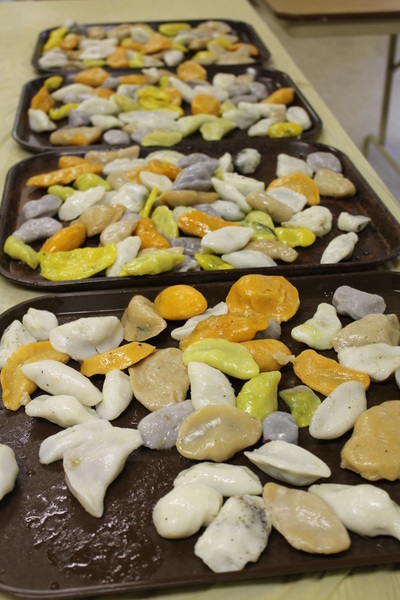 They made six colors and even more by mixing the dough together! For the drawing contest, the students tried their best to transfer their imagination into their entries, which included writing and drawing. 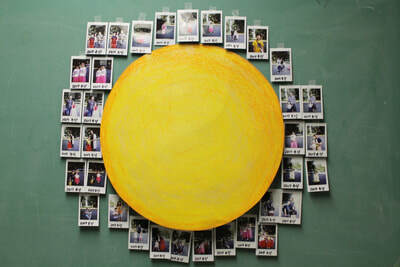 Today's subject was to choose from one of his/her favorite seasons; spring, summer, fall or winter. 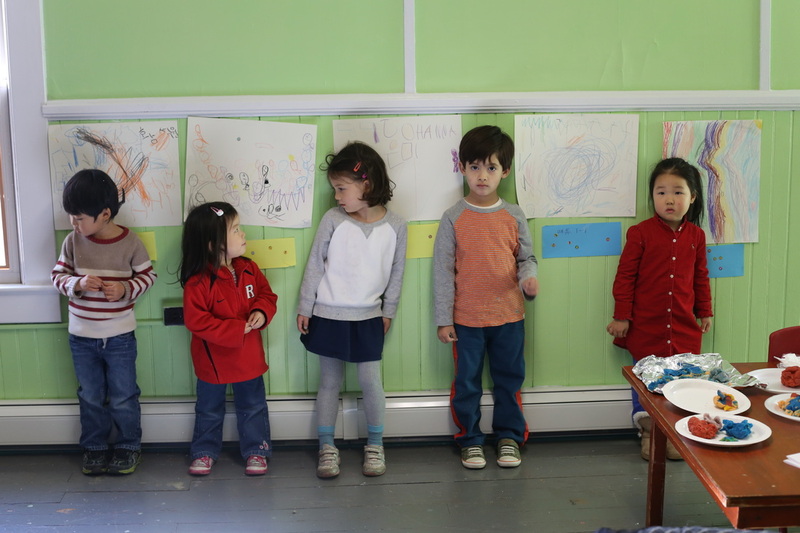 It was very cold outside but we enjoyed colors and words inside. 빨강, 파랑, 노랑, 초록, 보라, 주황! 어린 반 학생들은 그림 그리기 대회를 시작하기 전에 모두 모여 밀가루 찰흙을 만들었어요. 여섯 가지의 색을 만들었는데 찰흙을 섞다 보니 더 많은 색이 나왔어요. 그리고 우리 학생들은 열심히 그림을 그리고 글을 썼어요. 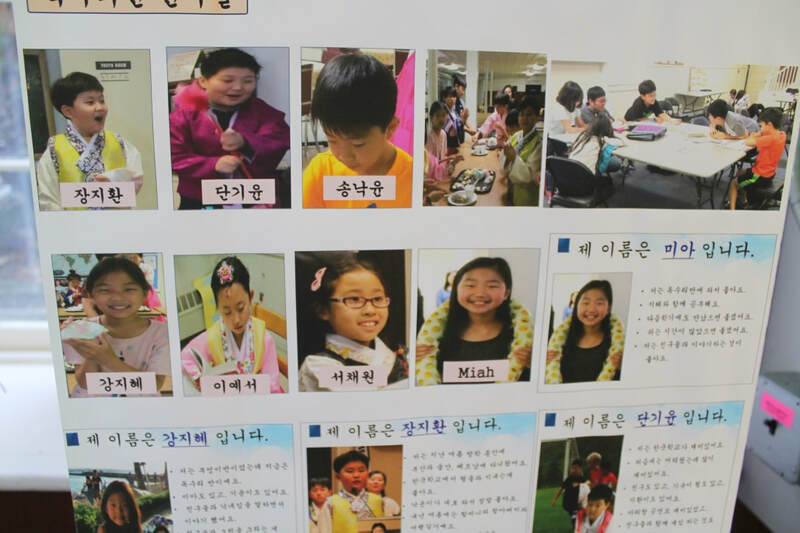 창의적인 생각을 글로 옮기고 그림으로 표현 했어요. 오늘의 주제는 봄, 여름, 가을, 겨울 중에서 자기가 제일 좋아하는 계절을 골라서 글로 쓰고 그림으로 그렸어요. 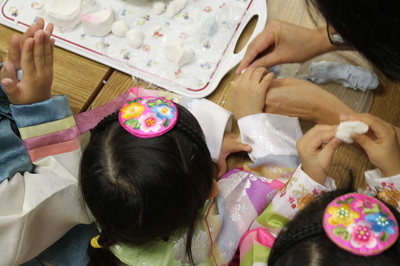 밖은 아주 추웠지만 색과 글로 아주 즐거운 하루였어요. I did my best! 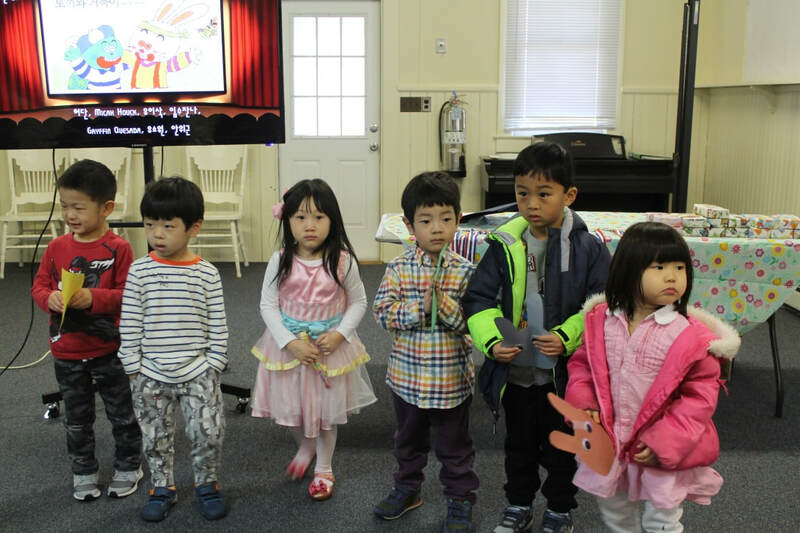 작은 손으로 그렸어요! No desk only thinking chair! 의자에서 생각을 모아! 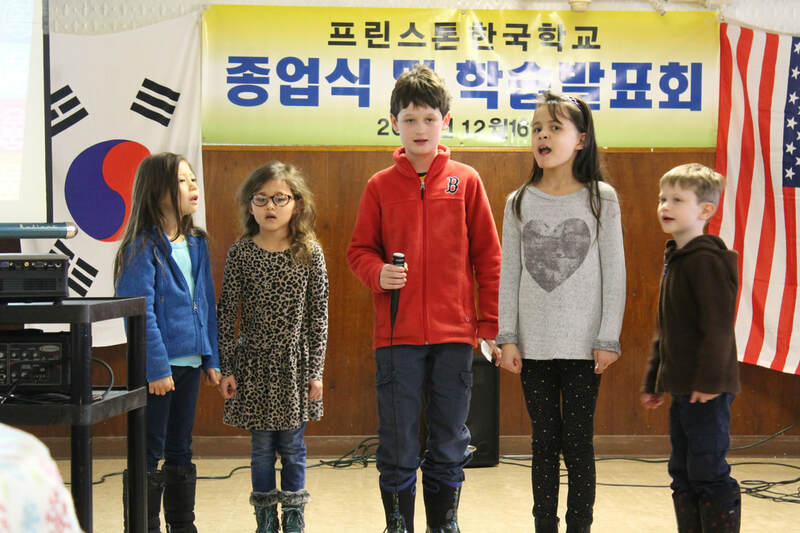 November 8th is FUNDRAISER NIGHT for the Princeton Korean School. 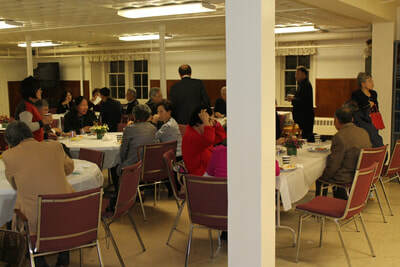 The students, parents, teachers and school board members work so hard making this night memorable. 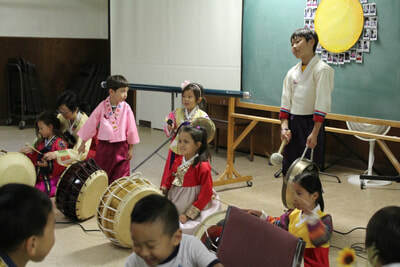 The students are practicing 'Heungbu and Nolbu' to perform before the music program starts. 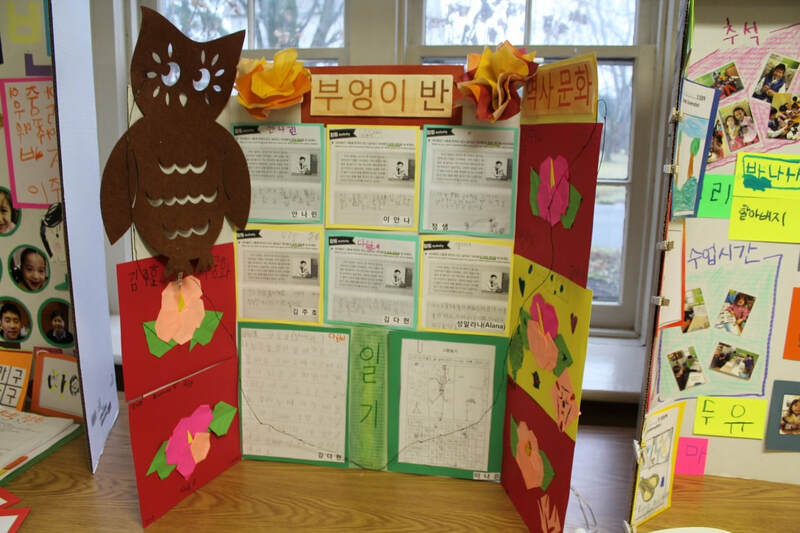 Some of students are fluent in Korean, some are limited, and others have no knowledge of Korean. 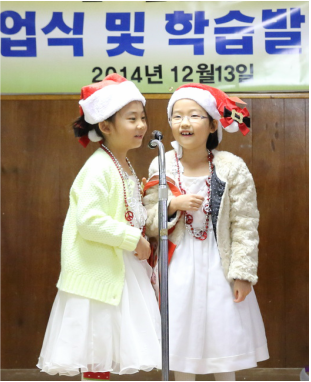 They will be performing together. 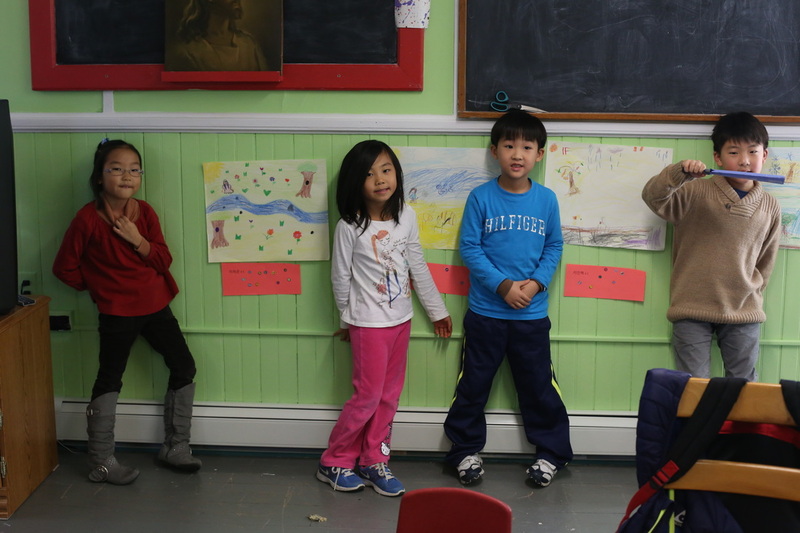 The teachers work together putting the lines in the student's shy voices. 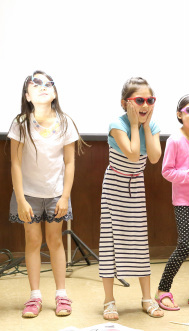 Someday one of those student may remember the night as 'one of the most memorable stage experiences' when he or she grows up. 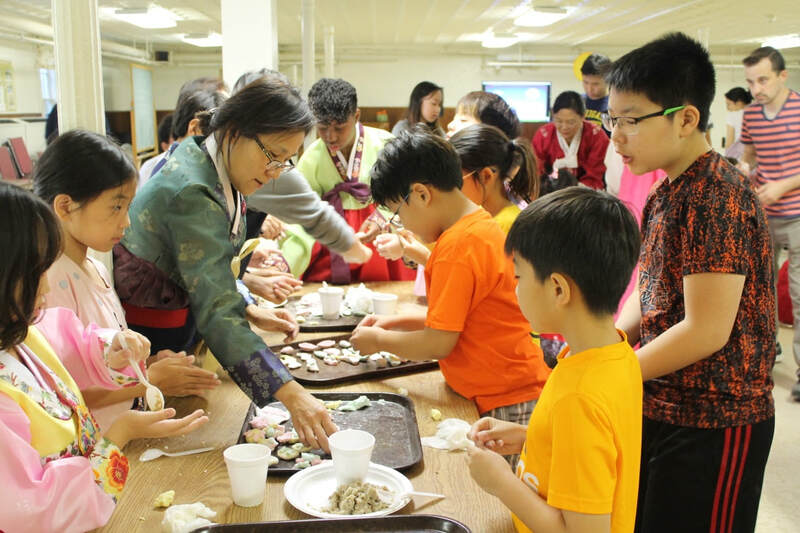 KAIP family wishes that whoever loves our Korean school come and enjoy the event and support the school. And also cheer for the students who try so hard to learn to say the Korean words. Please mark the calendar and join us!! 11월8일은 기금 모금의 밤입니다. 학생, 학부모, 교사 그리고 이사님들은 기억에 남을 아름다운 밤을 만들기 위하여 모두 노력하고 있습니다. 학생들은 '흥부 놀부' 연극을 음악 순서에 앞서 공연하기 위해 연습을 하고 있습니다. 한국말을 잘하는 학생, 한국말이 서투른 학생 그리고 한국말을 한 마디도 못하는 학생들이 모여서 연극을 합니다. 교사들은 무대 경험이 없는 학생들에게 대사를 연습 시키기 위해 많은 애를 씁니다. 이 학생들 중에는 훗날 커서 이 밤을 '영원히 잊지 못할 무대'였다고 생각하는 학생이 있을지도 모릅니다. 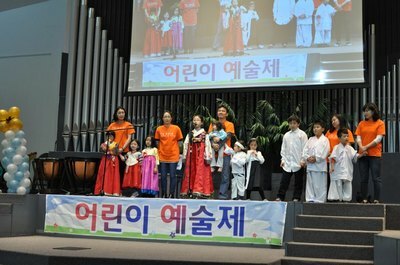 저희들은 한국학교를 사랑하는 많은 분들이 오셔서 한국 가곡과 아리아를 즐기시고 학교를 후원해 주시기를 바랍니다. 또한 한국말을 배우려고 열심히 노력하는 학생들을 격려하여 주는 아름다운 가을 밤이 되기를 기대합니다. 프린스턴 한국학교 학생들이 9월 13일 학교에서 추석 송편 빚는 모습입니다. 이것은 한국문화 체험 학습의 일환으로 가을 학기에 행해지는 학교 행사입니다. 매해 학부모회에서 쌀가루와 솔잎을 준비하고 교사들이 송편에 넣는 소를 만들어 와서 당일 학생들이 앞치마를 치고 송편을 빚습니다. 그리고 부엌에서 송편이 익는 동안 학생들, 학부모님들, 또 교사들이 모두 손을 잡고 원을 그리며 '강강술래' 춤을 춥니다. 떡이 다 쪄져서 참기름 냄새 고소한 송편 쟁반이 식탁에 날라지면 학교 식구들 모두 함께 들러 앉아 송편을 먹습니다. 이것이 송편 빚기 학교 행사입니다. 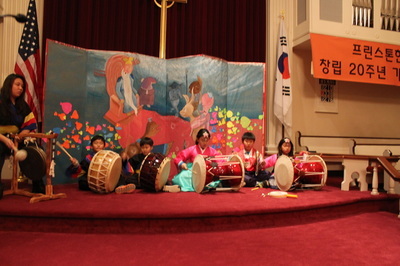 Students celebrating Chu-seok on September 13th in Princeton Korean School. 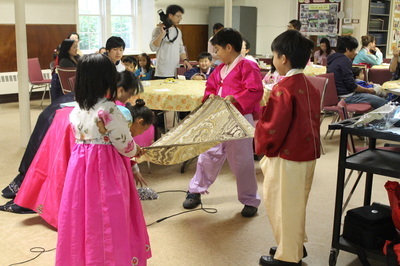 This celebration is an annual fall cultural event. 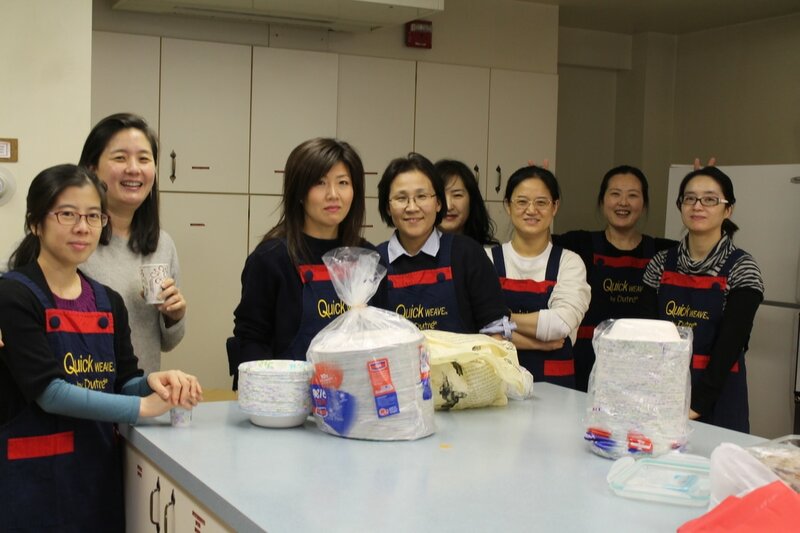 Every year, the KAIP PTA prepares rice powder and pine leaves and teachers make the filling. 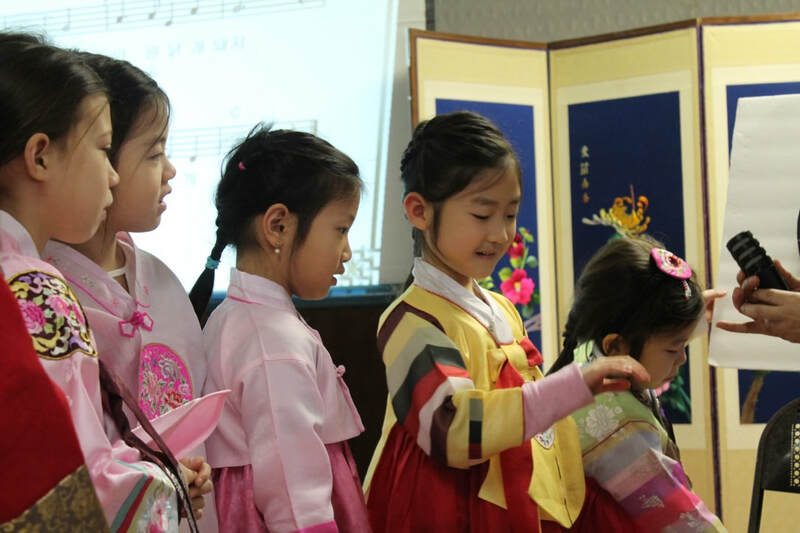 Students wear hanboks with aprons and make the moon-shaped song-pyun. 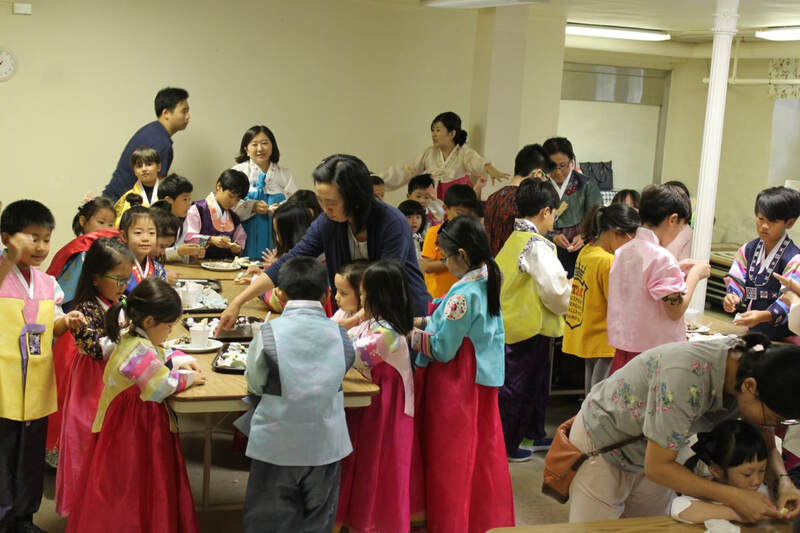 While the song-pyun steams in the kitchen, the students, parents and teachers hold hands and dance kang-kang-sul-rae in one big circle. 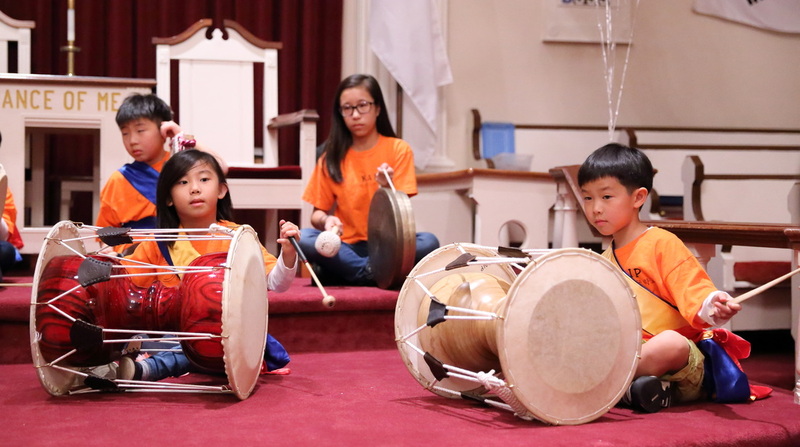 When the song-pyun is done you can smell the pleasant aroma. 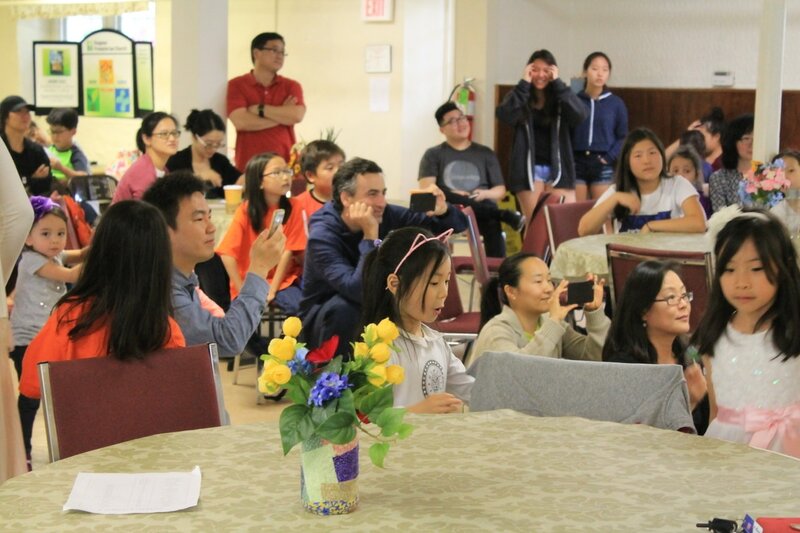 The KAIP family then eats the song-pyun around a table. 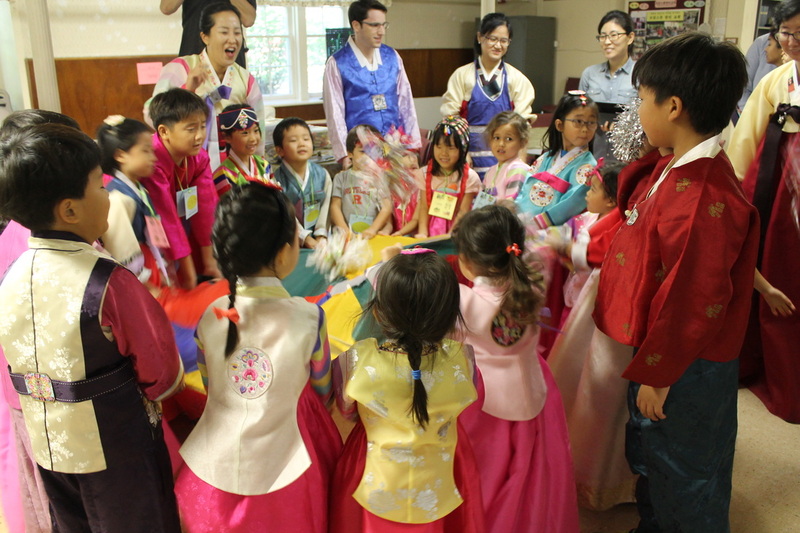 This is our celebration of Chu-seok. The KAIP's 25th NEWSLETTERS are being printed and will be sent home of the enrolled students by August 25, 2014. 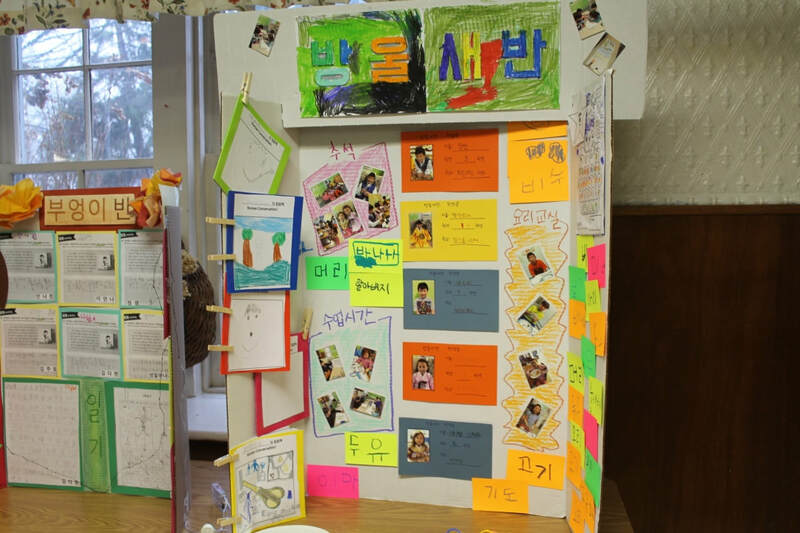 If you are not in the mailing list, and want to receive the printed newsletter, send us your home address at weteachkorean@gmail.com. We will see you on September 6th! 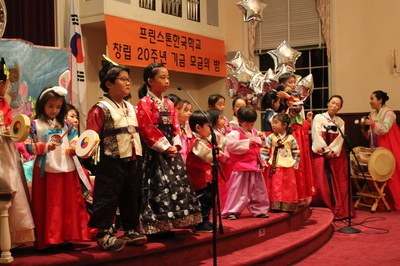 제25회 프린스톤 한국학교 소식지가 2014년 8월25일까지 프린스톤 한국학교 학생들 집으로 우송 됩니다. 혹 소식지를 받아보시기 원하시는 분은 집 주소를 weteachkorean@gmail.com으로 보내 주십시오. 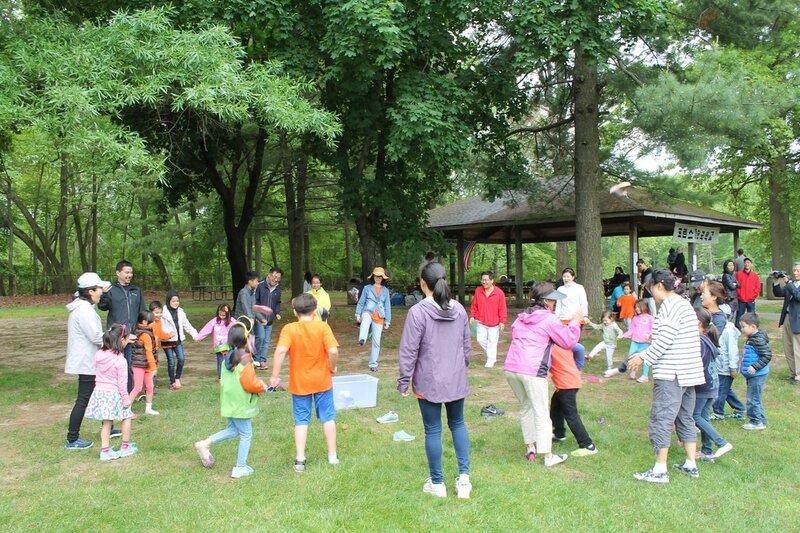 The closing ceremony of 2014 spring semester was held on June 7th in Van Nest Park in West Windsor. The KAIP family had a great time playing together the games like 'catch and eat the pretzels', 'carrying the water bowl', 'running with partner', 'relay' and 'tuck of war' followed by eating delicious bulgogi barbecue!! See you all in fall semester, begins on September 6!! 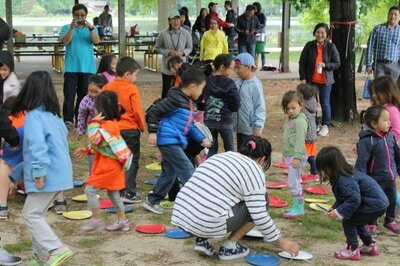 KAIP 프린스톤 한국학교는 6월 7일에 West Windsor의 Van Nest Park에서 학생, 학부모님, 이사님과 교사님들이 함께 모여 종업식을 가졌습니다. 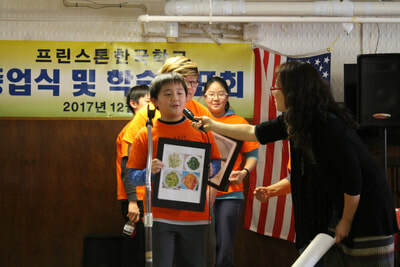 그리고 이어서 '과자 따 먹기', '물동이 이고 달리기', '두 발 묶고 뛰기', '리레이'와 '줄다리기' 로 재미있게 운동회를 마치고는 한국학교의 온 식구들이 불고기 바비큐 파티로 봄 학기를 맺음하였습니다. 9월 6일 가을 학기에 뵙겠습니다. 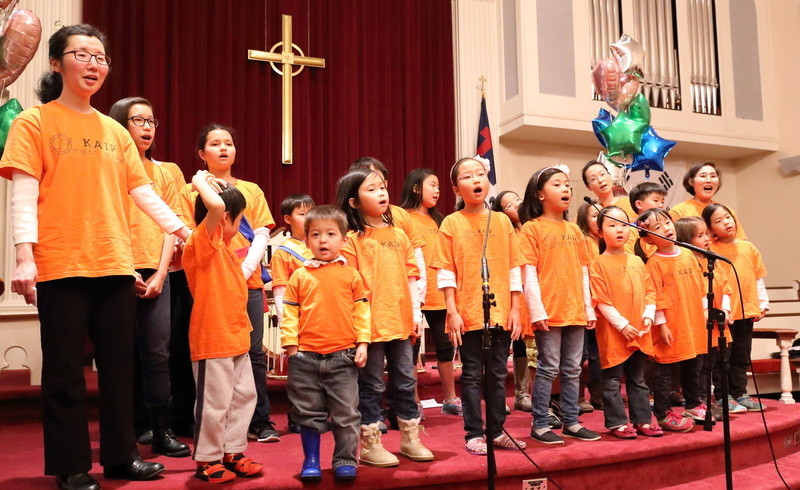 The KAIP's very first singing children's song day on May 31st was fantastic! 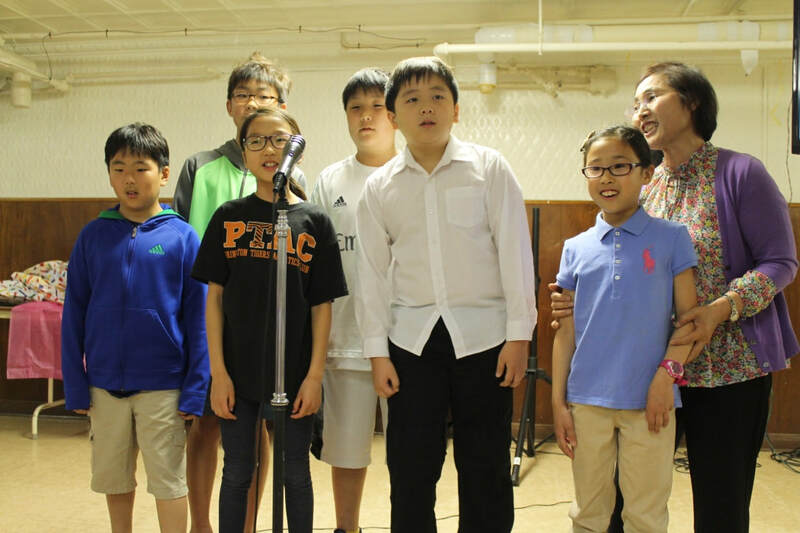 The students, parents and teachers sang solos, duets and more! The fun day ended with singing the song 'Paran maum Hayan maum' together. 5월 31일에 있었던 동요 부르기 날은 아주 재미있었습니다. 학생들, 부모님 그리고 교사들은 독창, 중창, 합창을 부르며 즐거운 시간을 가졌고 참석한 사람 모두 함께 동요 '파란 마음 하얀 마음'을 부르며 순서를 마쳤습니다. 우리 프린스톤 한국학교 교사들은 큰 공연이나 발표를 앞두고 늘 장난처럼 ‘우리 학생들은 무대 체질이니까!’ 라는 말을 한다. 물론 충분한 준비와 연습을 못 했을 때 염려와 기대를 하며 하는 말이다. 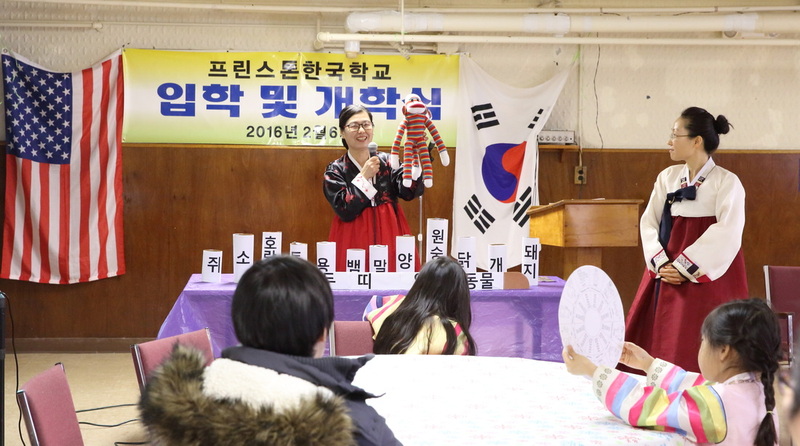 이번 예술제 공연 '흥부 놀부' 연극이 끝나고 우리 교사들은 즐거운 함성으로 ‘와, 정말 우리 학생들은 무대 체질이야!’ 라 말을 서로 주고 받으며 감탄했다. 5월17일 예술제가 열리는 날 뉴욕은 에이즈(AIDS) 걷기 외에도 뉴욕의 많은 대학들이 졸업식을 해서 차가 엄청나게 밀렸다. 두 시간이 넘는 덜컹대는 버스 여행이었는데 여섯 명의 어린 반 학생들 조차도 아무 불평도 없이 잘 견디어 주었다. 지치고 배가 고파 공연장에 도착하니 박이사님 부부께서 김밥과 국 그리고 치킨너겟을 준비하여 먼저오셔서 기다리고 계셨다. 우리 학생들, 부모님, 조교, 교사, 이사님 모두 뉴욕에 소풍을 온 것처럼 김밥을 맛있게 먹고 행사장으로 향했다. 단체 사진을 꼭 찍으려는 백선생님의 의지로 멀리서도 누구나 알아볼 수 있는 화려한 주황색 학교 셔츠를 입은 우리들은 무조건 무대 앞으로 나가서 준비하는 분들의 나중에 사진을 찍으라는 말과 눈치를 받으며 “우리 학교는 일찍 떠나니까요” 말하며 단체 사진을 찍었다. 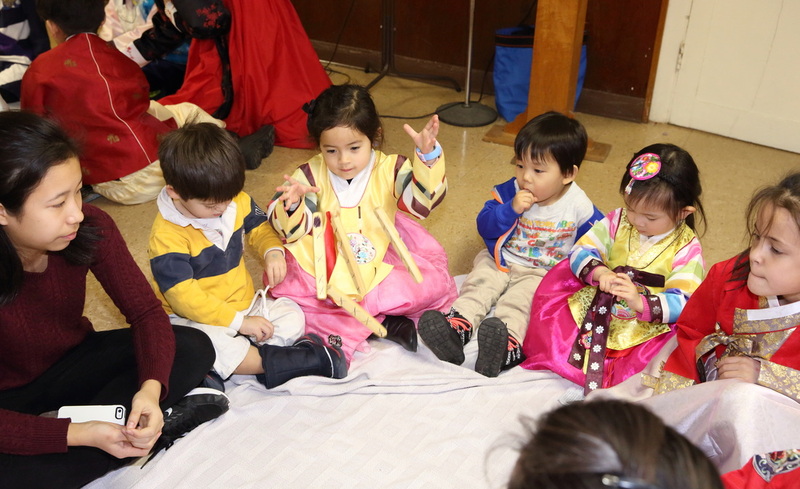 벌써 많은 학교들이 행사장에 도착하여 무대 위에서 리허설을 준비하고 있어서 우리 학교도 그 틈에 끼어 무대 배치와 학생들이 서 있어야 할 위치를 1분 파악하고 무대에서 내려 왔다. 다섯 번째의 우리 순서가 올 때까지 우리 학교 '흥부놀부' 연극이 어떻게 진행이 될지 누구도 예측을 할 수가 없었다. 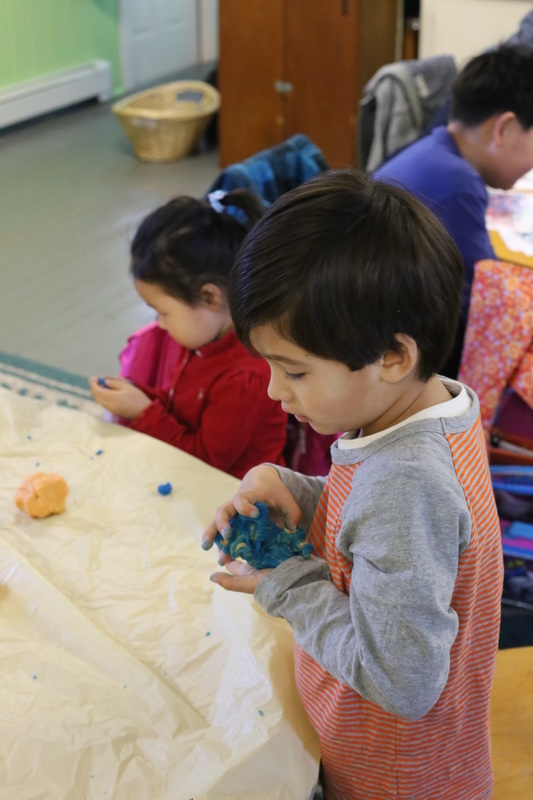 우리 학교 순서가 되자 몇 초만에 기와집과 초가집이 무대 위에 한옥 마을의 집처럼 멋지게 세워지고 놀부의 집 앞에 쌀밥상이 차려지자 주원이와 우리가 무대 앞에 섰다. 시작을 알리는 노래가 나오고 지은이의 또박또박한 해설에 이어서 놀부 주원이가 크고 우렁찬 목소리로 ‘부인, 밥 먹읍시다.’ 라는 대사가 나오자 “와, 됐다!” 하는 생각이 들었다. 흥부 은서의 매끄러운 대사, 흥부 부인 지희의 받는 말, 양념처럼 짤막하게 끼어드는 하은, 민희, 주현, 진아의 멋진 대사들, 너무 잘 나는 제비 주호, 무대를 완벽하게 만들어 주었던 우리 합창 단원 학생들, 연극은 무대 체질 프린스톤 한국학생들의 것이었다. 주최측에서 주는 공짜 삼각 김밥이 도착하기 전에 떠나야 하는 아쉬움이 있었지만 모두들 돌아오는 버스 속에서는 긴장이 풀어진 즐거운 소리들이 버스를 꽉 채웠다. 잘 했어요, 프린스톤 한국학교 학생들!! KAIP goes to New York on May 17th 2014. Please mark the calendar. Parents and siblings are welcomed. The KAIP students will perform ' HEUNG-BU AND NOL-BU', the famouse Korean folk tale of two brothers. 프린스톤 한국학교 학생들은 5월 17일 (토요일) 뉴욕에서 열리는 동북부 어린이 예술제에 참가합니다. 우리 학생들이 '흥부와 놀부' 노래극을 합니다. 학부모님들께서는 달력에 표를 해 두시고 그 날 예술제에 꼭 참석해 주십시오. 공연을 앞에 두고 항상 고민스러운 것은 무대 배경 만들기다. 이번 예술제 참가를 위해 흥부네 초가집과 놀부네 기와집을 어떻게 지을 것인지 교사들이 많은 궁리를 하고 아이디어를 모았다. 하루 모여 벽을 세우고 문을 만들어 붙였는데 지붕을 덮지 못한 집이 걱정 되어 비오는 날 교장 선생님께선 "비 안 새도록 큰 비닐이라도 덮어 두라"고 걱정스런 이멜도 보내셨다. '기와집은 스프레이 페인트로하고 초가집은 카드보드를 잘라서...' 머리를 모아 계획을 세우기도 했다. 그런데 '장인'이 나타났다. 멋진 놀부네 기와집과 흥부네 초가집 두 채가 눈깜짝할 사이에 지어졌다. 이하은의 아버님이 오셔서 누구의 도움도 없이 그리고 자르고 붙이고 끼우니까 훌륭한 기와집과 초가집이 서는 것이 아닌가!!! 이제 멋진 무대가 만들어졌으니 우리 학생들은 열심히 연습을 해서 훌륭한 흥부 놀부 연극을 해야겠다. 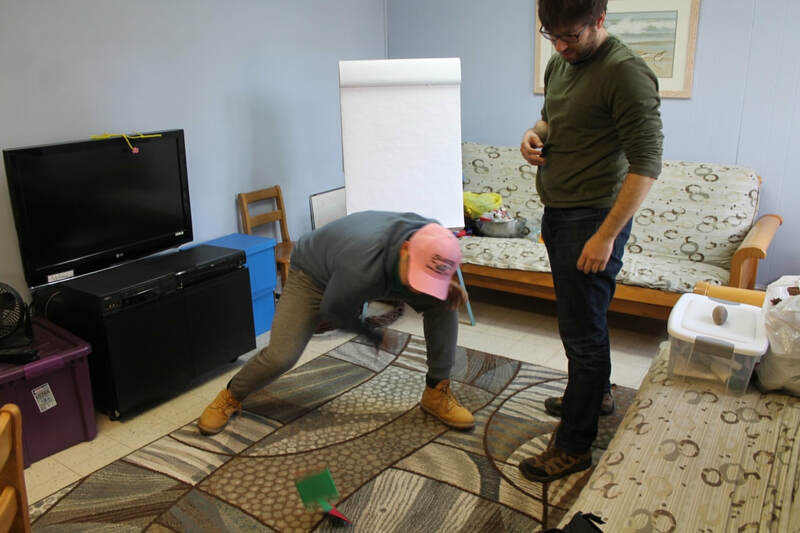 Making the background prop for the play is always a challenge. 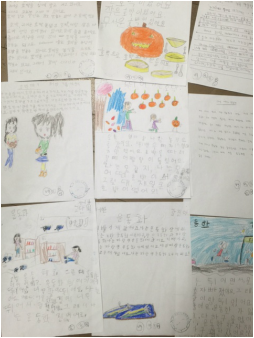 We all teachers collected the ideas about how to build a nice sturdy brick house for Nol-bu and a shabby straw roof house for Heung-bu. 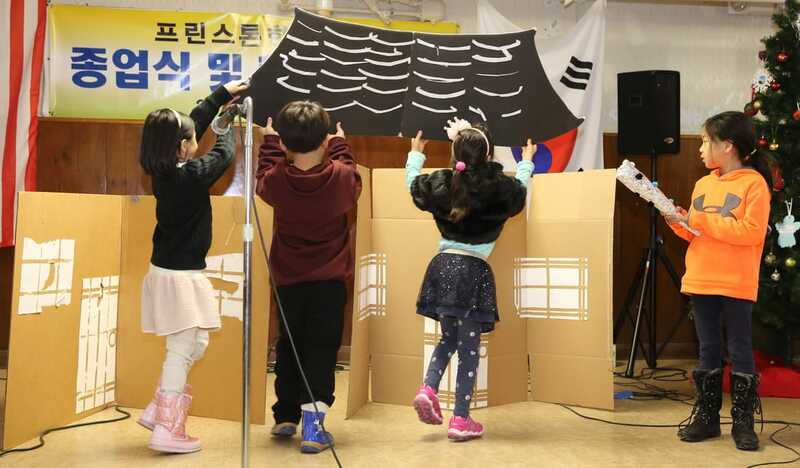 One Saturday, the teachers built the cardboard houses without roof and Ms Lee,principal, sent the message on a rainy day saying "Cover the roof with vinyl" via email. 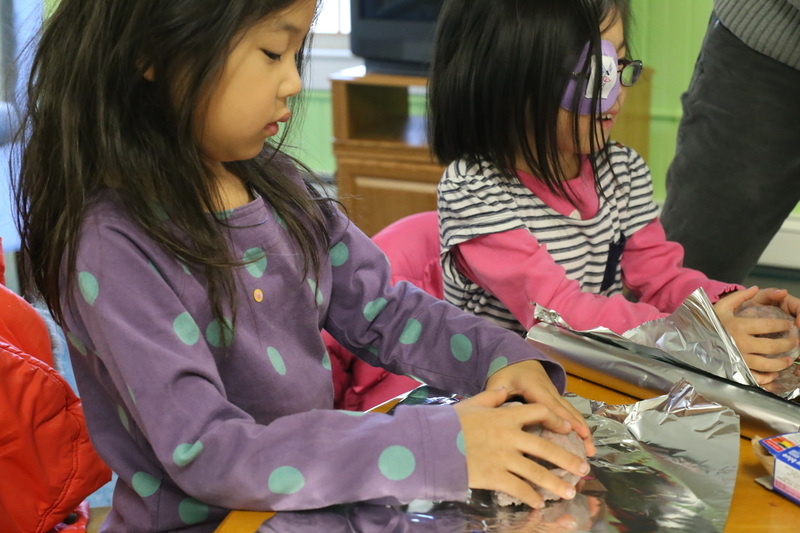 The discussion kept going: "Should we spray paint to make the roof or use cardboard?" However the expert appeared. 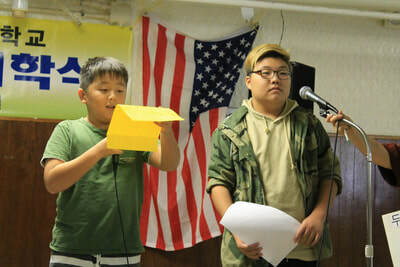 In the blink of an eye there were Heung-bu's straw roof house and Nol-bus brick roof house. 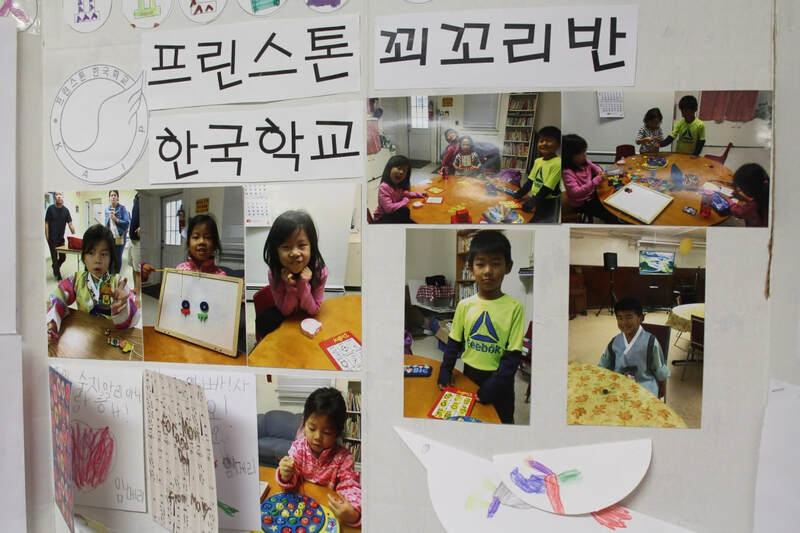 Ha-eun's father came and worked alone, drawing, cutting, pasting and putting it together. VOILA`! Perfect houses!! Now we have a set for the play. 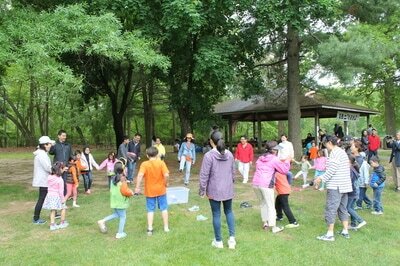 We have to practice the parts and make a fun playing Hueng-bu and Nol-bu. 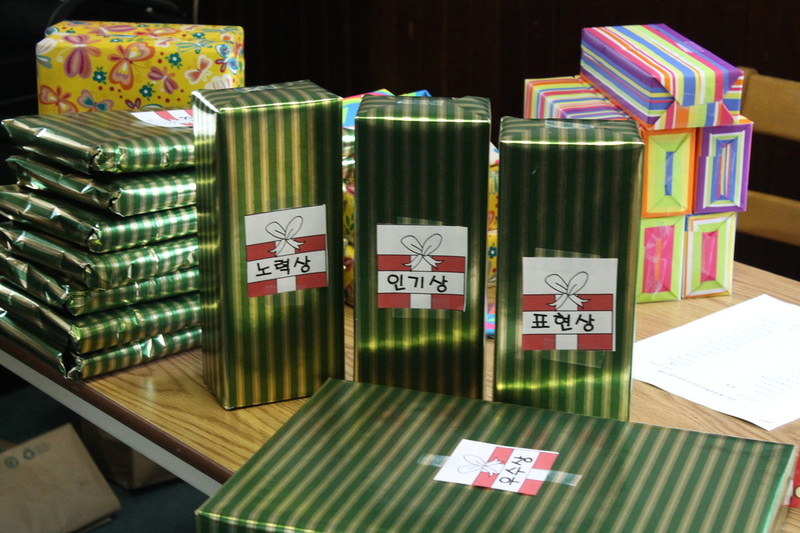 Mr. Lee (Ha-eun's father), thank you so much!! 주말인데다가 날씨가 좋아서 많은 사람들이 박물관 계단에 또 스쿠클 강가에서 여유로운 시간을 보내고 있는 오후에 나도 가족과 박물관에 갔다. DOLOMITE 돌로 지어진 필라 박물관 입구의 웅장한 그리스 풍 기둥 사이로 붉은 천에 쓰여진 K.O.R.E.A를 바라보며 높은 계단을 올랐다. 유럽의 여러 나라에서 박물관을 돌아볼 기회가 있었기 때문에 가까운 필라델피아 박물관은 항상 다음으로 미루다가 별 기대를 하지 않고 조선왕조 유물들을 보러 갔다. 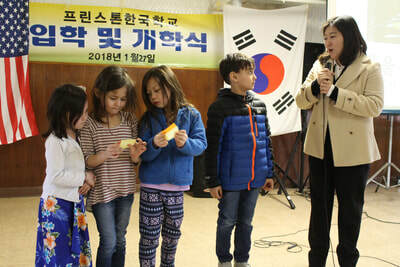 그런데, 역시 ‘영상 하면 한국이라!’ 감탄하며 많은 방문객들 틈에 끼어 스크린에 나오는 ‘어가 행렬’을 따라 방에 들어서자 한쪽 벽을 차지한 십장생도가 한눈에 들어왔다. 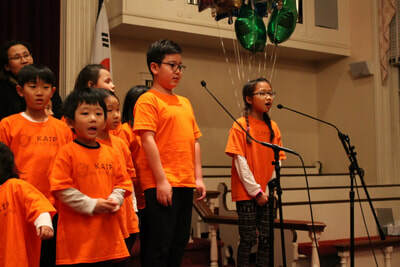 그 앞에서 “ 엄마, 사슴이 있다.” “거북이도 있네.” “와, 복숭아 참 맛있게 생겼다!”라고 아이들이 부모에게 하는 말들을 들으며 가까이서 십장생도, 모란도, 일월오봉도를 자세히 들여다 보고 교과서에서 보았던 김정호의 대동여지도를 딸들에게 자랑하며 같이 보았다. 사도세자의 죽책함을 들여다 보는 딸에게 영조할아버지와 정조 그리고 전시된 죽책함의 주인, 사도세자 이야기 해 주었다. 관리들의 초상화를 보며 딸들이 자기들의 조상 한씨를 찾았는데 불행히도 없어서 엄마의 성 조씨 성을 가진 관리를 찾아 보았다. 조선 백자와 재미있는 얼굴의 호랑이 그림, 불상, 여러 장신구들을 감탄하며 보았다. 마지막 방에 전시된 왕조 끝 무렵의 서양식 관리 옷과 노리다케 식기 세트는 어두웠던 시대를 보는 것처럼 서글펐고 문화 유산과는 어울리지 않는 것처럼 느껴졌다. 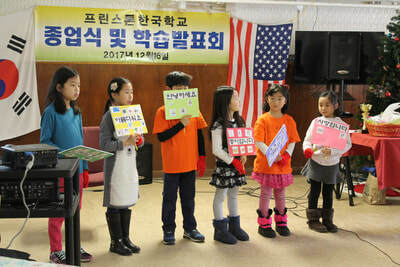 유물들을 다 보고 나오자 붓글씨로 자기의 이름을 스크린에 쓰려고 많은 사람들이 줄을 서 기다리고 있었다. “모두 우리 한국학교에 오면 진짜 붓글씨를 배울텐데…”라고 옆에 서 있는 딸에게 말했더니 “ 재미있겠다, 나도 한 번 써 봐야지.”라고 한다. 어느 박물관이나 꼭 거쳐서 나가는 곳 박물관 숍으로 안내 되었다. 숍에는 액자에서부터 전통 차 까지 예쁘게 진열되어 있었고 지난 학기에 우리 학생들이 특별활동 시간에 비슷하게 만든 전통 탈이 150불 가격표가 붙어 있었다. 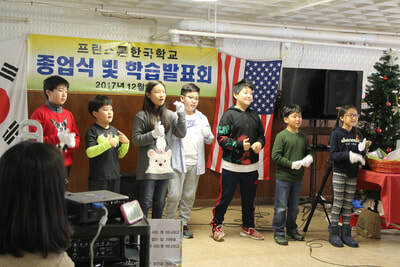 물건들을 들여다 보는데 박물관 문 닫을 시간이라고 한다. 곧 다시 방문하여 다른 예술품도 볼 계획을 하며 문을 나섰다. 박물관 주위의 잘 다듬어진 언덕에 놓인 벤치에 앉아 스쿠클 강을 바라보며 이야기를 나누다 집에 오는 길에 종가집에 가서 돌솥밥에 매운 순두부를 먹으니 맘도 부르고 배도 불러 참 행복했다. On a fine spring Sunday my family and I visited the Philadelphia museum. 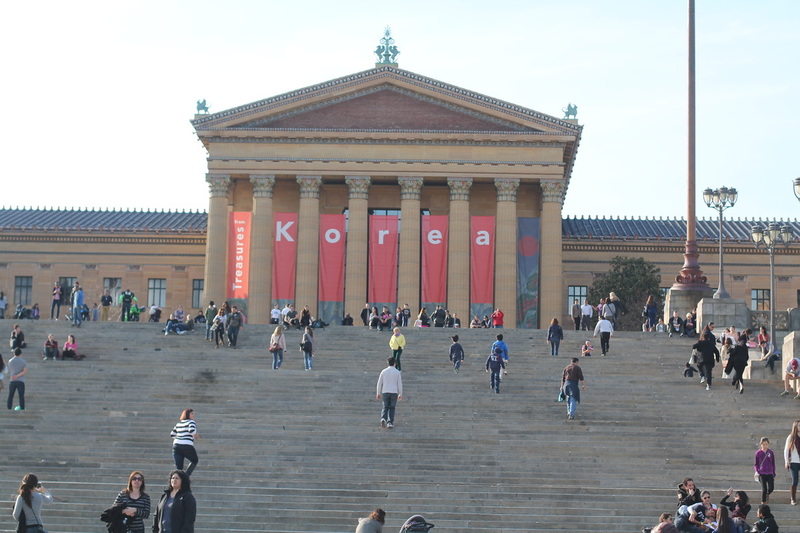 There were many people sitting on the long stair case in front of the museum or walking around leisurely. I stepped up to the museum, looking at the big red banner of K.O.R.E.A hanging between the Greek style dolomite columns. I have visited many museums in Europe, and frankly I didn’t expect much at this museum near home. As soon as I entered the exhibit of the Treasures from Korea, however, the large screen that filled up the wall with the animated ‘King’s Procession’ took me by surprise. 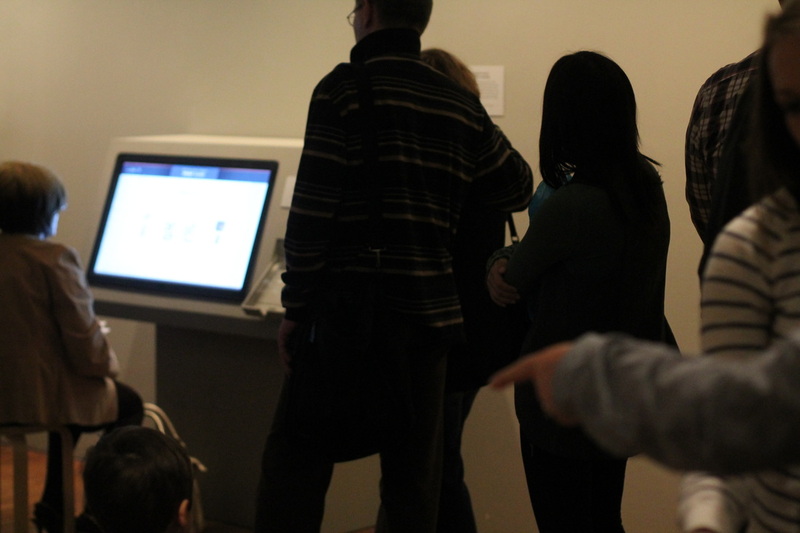 The enormous painting on the screen of the ‘Ten longevity Symbols’ captivated everyone’s eyes. The children called out to their parents and said, “I see the deer!” “There are turtles!” “Wow, the peaches look so yummy!” I looked closely the 10 fold screen of ‘Peonies,’ ‘Sun, moon and five peaks,’ and ‘Dae Dong Ye Map,’ which I saw only in my text book long time ago. I told the story of King Youngjo and Jungjo and the sad story of Prince Sado when my two daughters were looking at ‘Prince Sado’s ornate case’. My daughters tried to find their last name from the ‘19th century official candidates’ portrait’ but their last name was not there. I have found my maiden name and showed it to them. 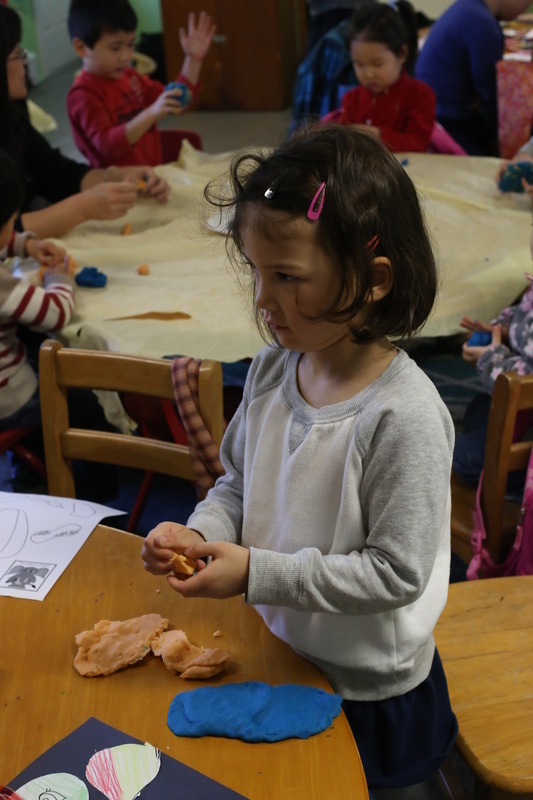 We were enjoying the beautiful ceramics, the painting of a tiger with a funny face, many statues and accessories. The last room of the Treasures was ‘The end of dynasty.’ The odd looking western style uniform and the Noritake dinner set seemed so out of place and made me sad thinking of the dark period of our history. 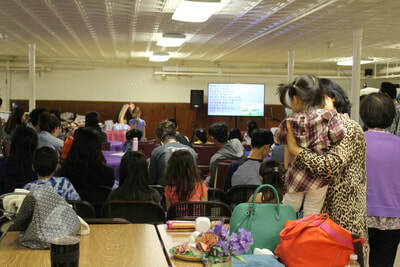 Where the display ended, there was a long line of people waiting for practice calligraphy on the screen. 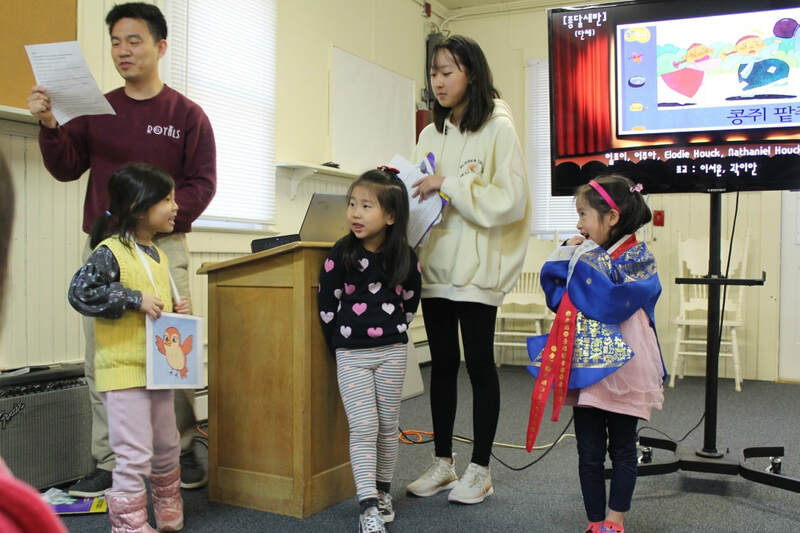 I told my daughter standing next me “If they come to Princeton Korean School, they would learn real calligraphy.” and my daughter answered me: “Writing on the screen would be a fun. I want to try.” Like any other museum you cannot exit the place without passing through the museum shop, where all kinds of objects were displayed very nicely. 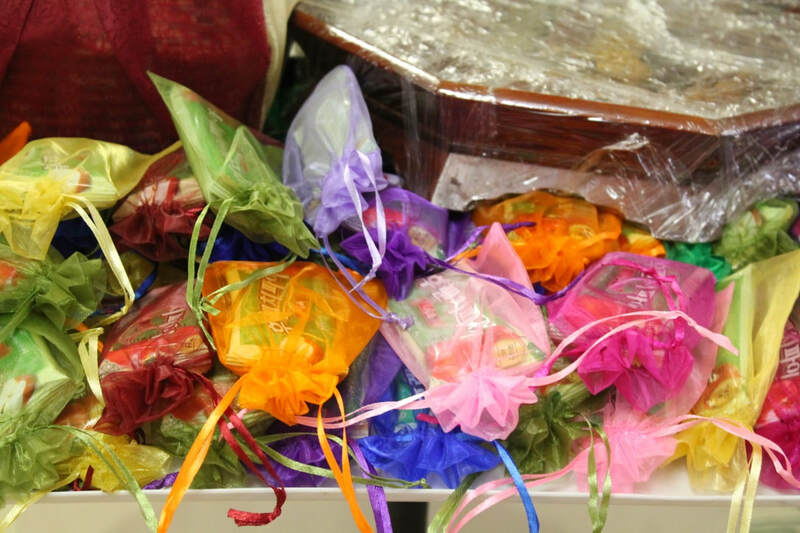 There were many like a pretty picture frame or a traditional tea set in a gift box. 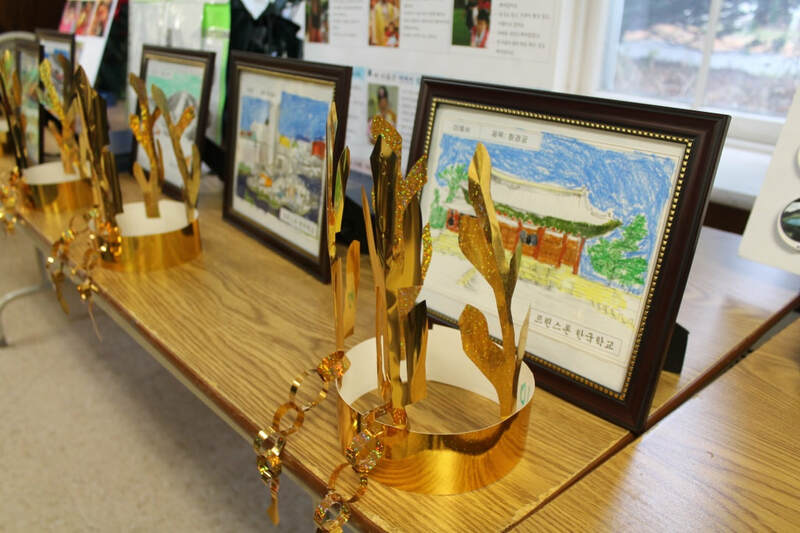 The kind of mask that the students in the Korean school made last semester was priced at $150.00. Because my family stayed too long looking at the artworks and the Treasures from Korea, the guide had to tell us about the closing time. My family was sitting on the bench overlook over Schuylkill River and chatted for awhile. 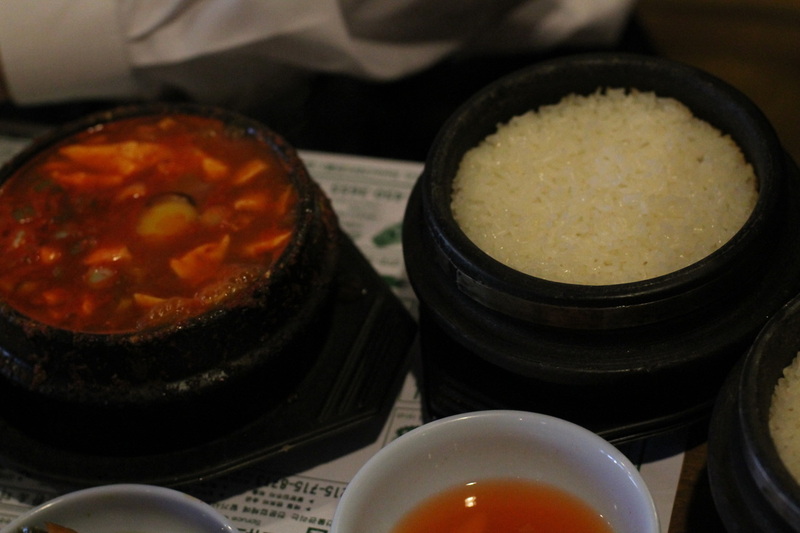 On the way home we stopped at Jonggagyp for the delicious hot sundubu and cooked rice in the stone pot. It was very happy day of your mind filled with the treasures and your stomach, with the good satisfying Korean food. My family and I had the most pleasant experience at the Princeton Korean school. Being a multicultural family attending the school helped us to bring more Korean culture into our family. We were welcomed with open arms by the staff. While my daughter attended class I would learn Korean at the adult class. 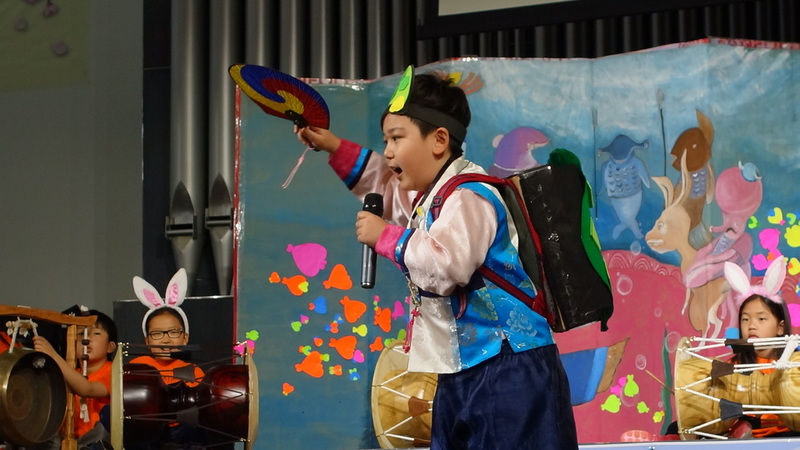 We really enjoyed the cultural events organized by the school. It helps keeping children interested in the Korean culture and it taught me many aspects of Korean tradition I hadn’t known yet. 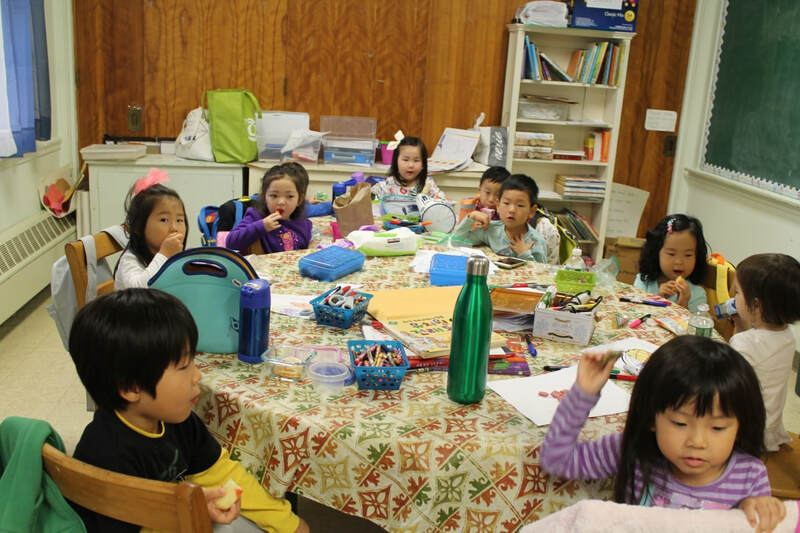 The fact that all classes are taught by Korean native speakers in a small class room environment is a big advantage. 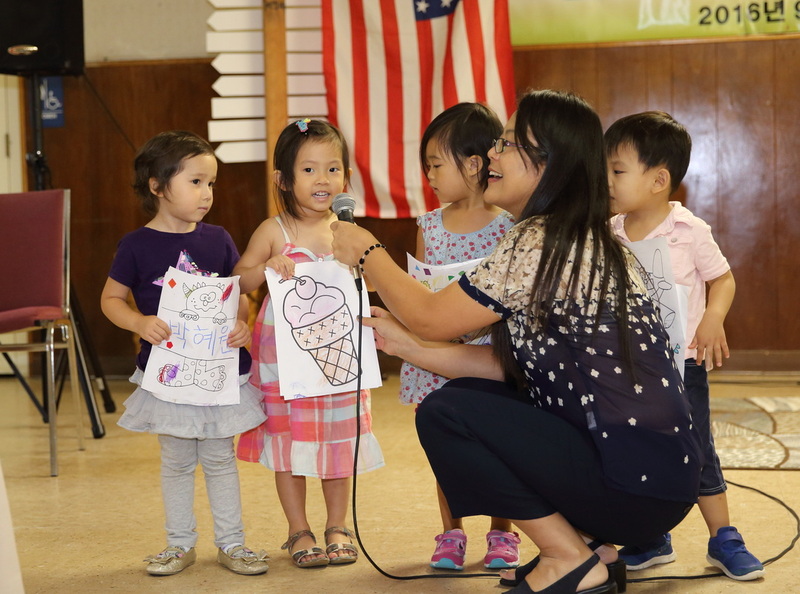 No other language school can offer that. 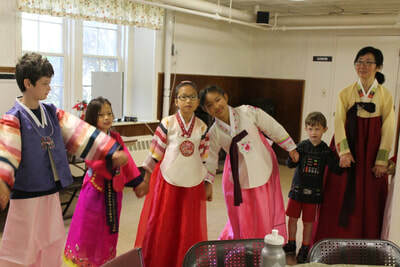 I highly recommend the Princeton Korean school to anyone interested in learning the Korean language in an authentic way. In a short time I learned to read and write. 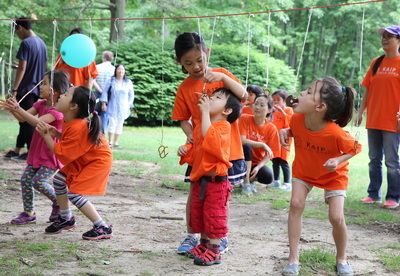 The Princeton Korean school works hard to bring together the Korean community in the area. We couldn’t thank them more for all the work. 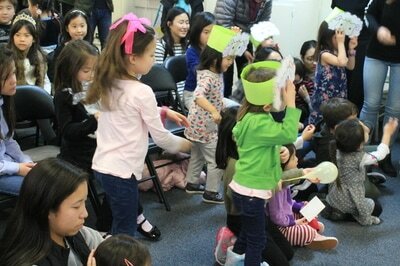 Story Telling Contest was a great success and fun! 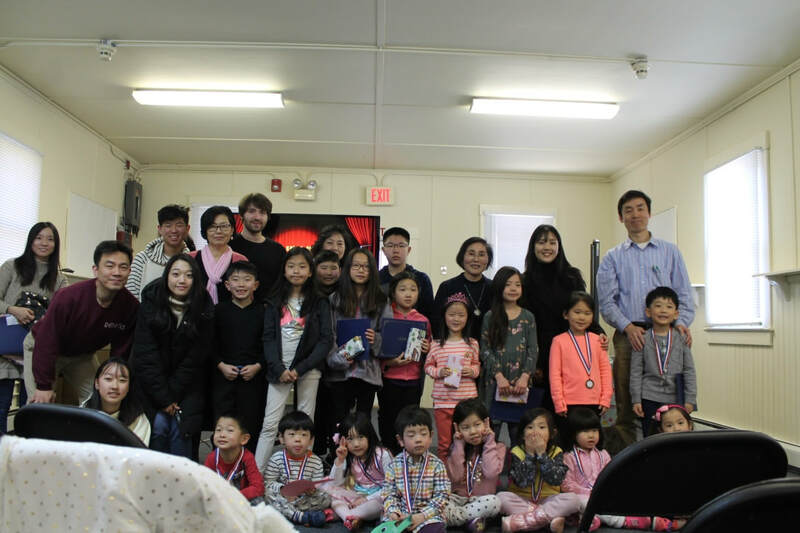 Everyone who participated in it did a great job memorizing and reciting the stories in front of the KAIP students and parents on March 8th. 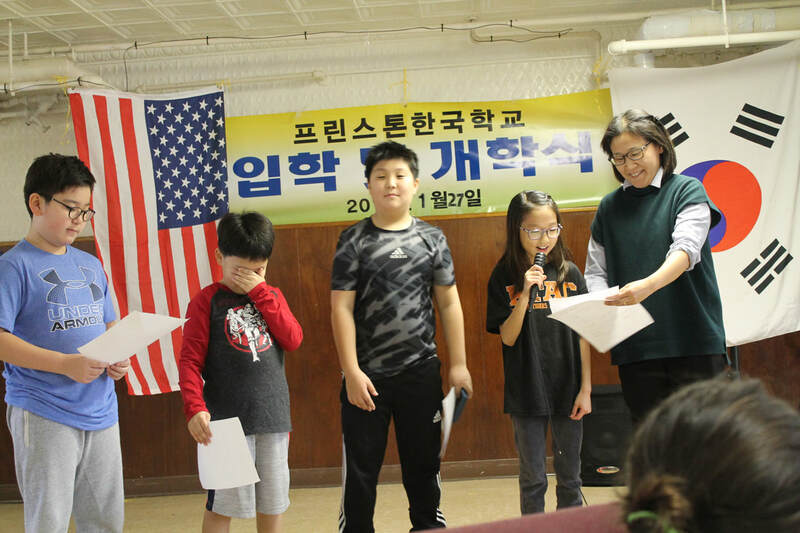 The two students will compete with other schools telling the stories at NAKS (the National Association for Korean Schools, northeast chapter) on April 5th. 이야기 대회를 재미있게 잘 마쳤습니다. 참가한 학생들이 외운 이야기를 전체 학생들과 부모님들이 모인 자리에서 재미있게 잘 이야기 했습니다. 그 중에 두 학생이 재미한국학교 동북부협의회에 나가서 다른 한국학교 학생들과 실력을 겨룹니다. 최은서 학생, 이지은 학생 잘 하세요! 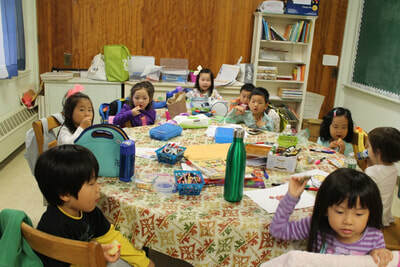 Open Class for Teachers; Ms H. Lee (2-1) is preparing to open her classroom for the teachers on April 5th. 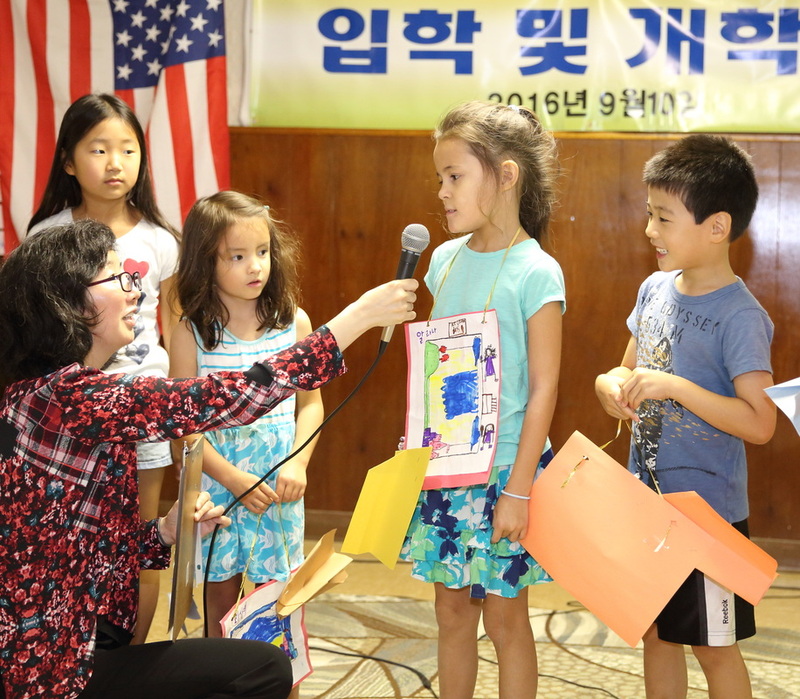 She will introduce new teaching method and creative ideas to teach the Korean language in her classroom. 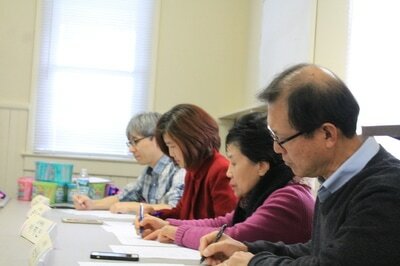 All the KAIP teachers are looking forward to learning something new in this upcoming open class! 4월 5일에 있을 연구 수업을 이혜정선생님께서 준비하십니다. 이선생님이 새롭고 창조적인 방법으로 어떻게 학생들에게 한국어를 가르치는지 보여 주십니다. 이선생님, 연구 많이 하세요! 학부모회 바자회 소식입니다. 주문서 보내주신 학부모님들께 감사의 말씀 전합니다. 그리고 아직 주문하지 않으신 학부모님들은 첨부된 바자회 신청서 보시고 다음주 화요일(3월 25일)까지 저희에게 이메일 주시면 감사하겠습니다. 주변에도 많이 알려 함께 주문해 주세요. 봄처럼 활기찬 하루 되시길 바랍니다.